My wife is always coming home with new furniture – chairs, dressers, nightstands, tables. She loves to redo them, and they always turn out really nice. Recently Eileen’s aunt and uncle gave her an old dresser from when her uncle was quite little. 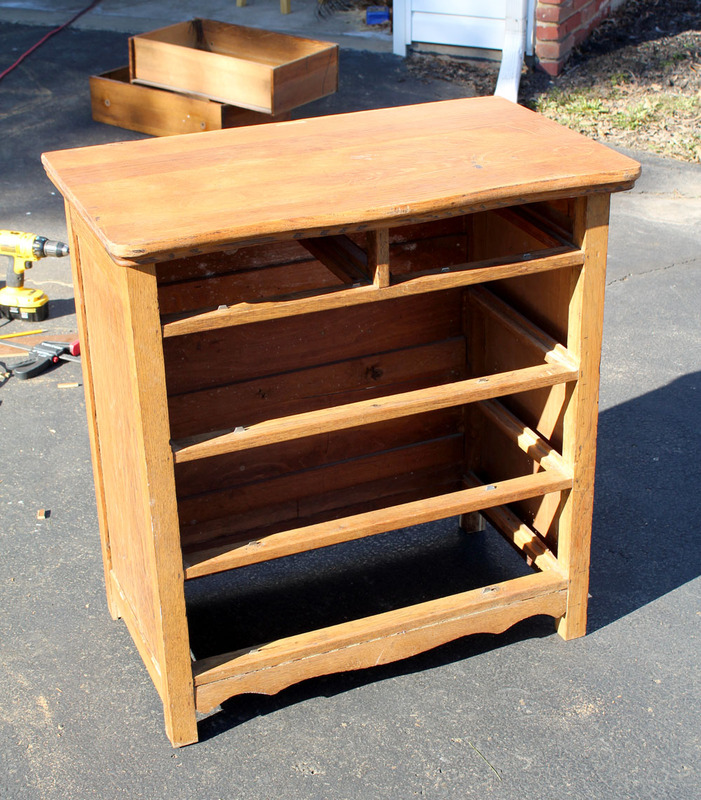 The dresser needed a little TLC, and so we had a plan to make it over with milk paint. However, after watching a little too much HGTV, Eileen saw a couple of DIYers run a dresser through a tablesaw. 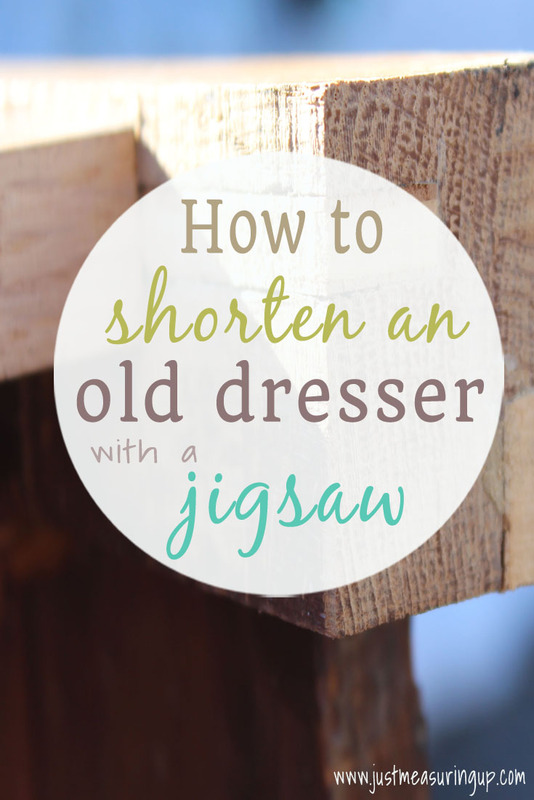 So as Eileen was out in the driveway getting ready to paint the dresser, she got a vision of how nice the tall dresser would look if it were shorter. Now, I’ve never had modify furniture in this manner before, so… challenge accepted. There were a number of ways I thought to accomplish this. I settled on the simplest method of cutting a section off the bottom, and relocating some trim to conceal my work. Once we were satisfied with the feel of the new height of the shortened, it was time to dig into the details to restore the look. In the process of shifting all the trim upwards, I exposed some more grooves in the new legs. I didn’t want to leave the grooves there and risk pieces of the legs breaking off. 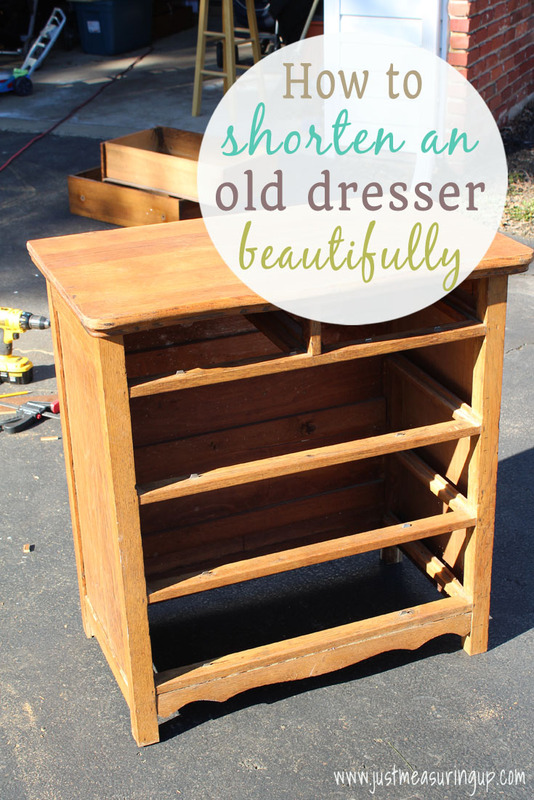 We were so pleased with how the tall dresser was now shortened and couldn’t wait for the next step of the project – making it over with milk paint. 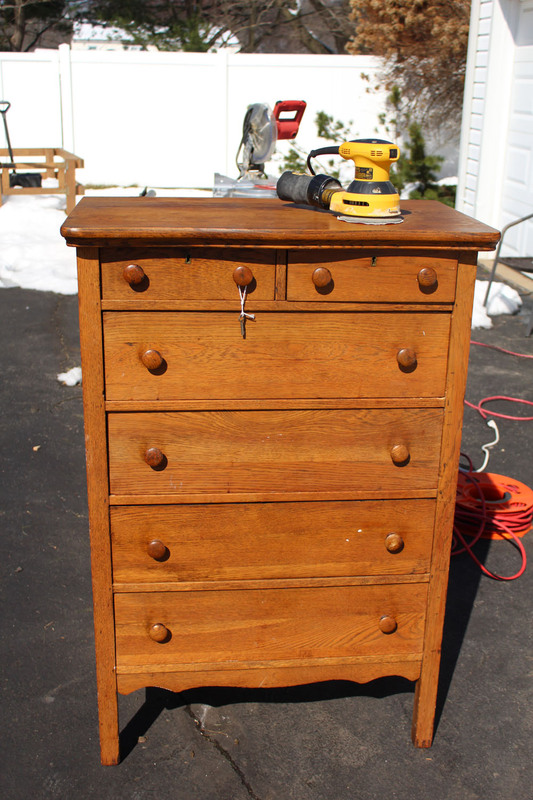 Check back next week to see the complete dresser makeover! 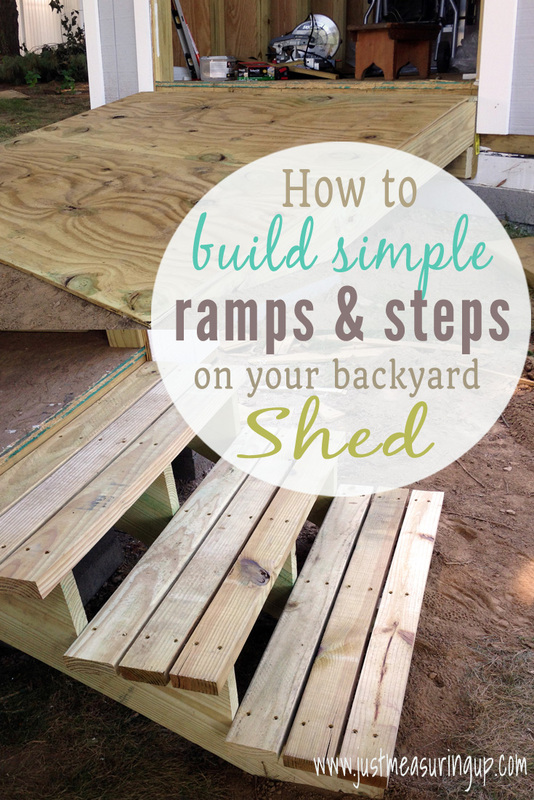 Almost any shed can benefit from a ramp and steps. Such is the case with my shed. If you’ve been following along with me as I built my shed from scratch, my storage shed plans included a spot for both steps and a ramp. If you missed my previous posts, check out my Shed Project Phase 1 (how to build a shed foundation and framing) and my Shed Project Phase 2 (how to build paneling and roofing for a shed). So back to my shed plans. My plans included having two entrances – a double door entrance for the riding mower and a single door entrance to access backyard storage and garden supplies. For the riding mower entrance, my plan was to build a ramp, and then the steps were a necessity for the second entrance, due to how high above the ground the door was. I built the ramp, steps, and doors from scratch. Keep reading for the details. I originally wanted to put the ramp on the right side of the shed, but due to the slope of the ground, it wasn’t very practical anymore. 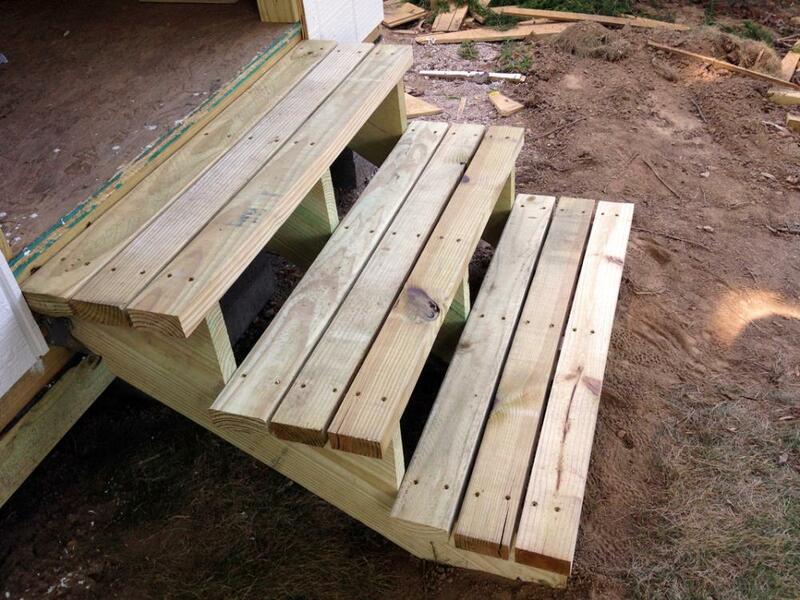 So I adapted my plans to put the shed ramp on the left side and put steps on the right side. The shed steps for the single door were pretty easy to build. I bought 3 pre-cut step stringers from Home Depot. Step stringers are the support pieces at the sides of the structure that hold up the steps you walk on. I did have to measure the maximum height from the shed floor to the ground to buy the right length step stringer though. It turned out that 3 step stringers were adequate. 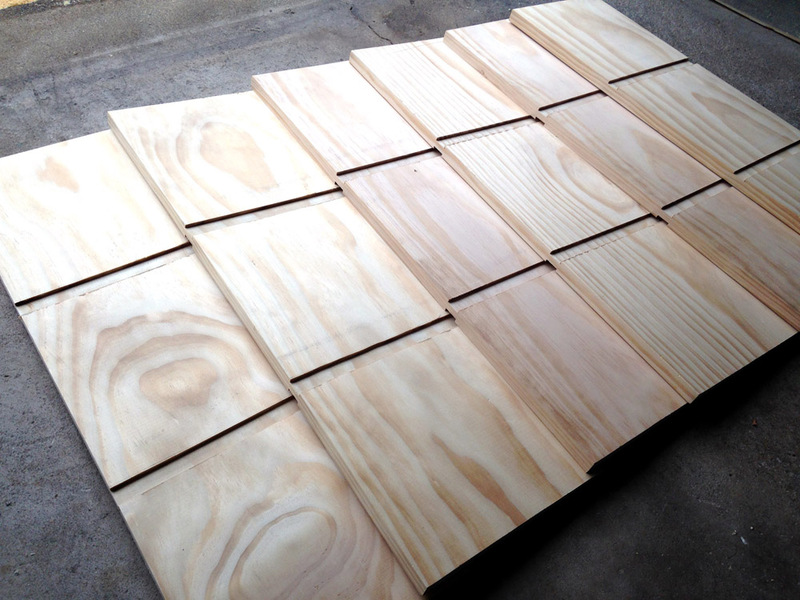 As for the actual steps, I trimmed some 2 x 4s lengthwise with my table saw, and assembled them like a boardwalk. I used 3 pieces of wood per step, with a little spacing in between. 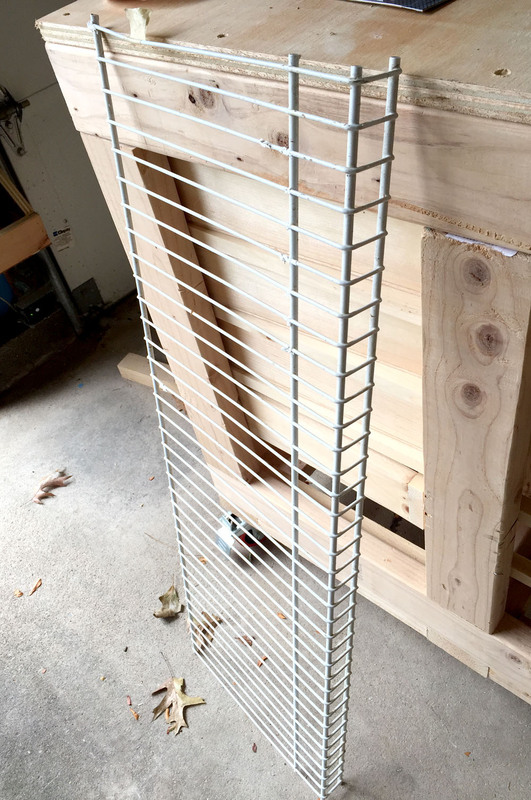 To connect the stringers to the shed, I used a joist hanger. It’s just a U-shaped metal bracket that’s screwed into the floor joists on the shed, and each stringer rests inside. As for where the stringers met the ground, there needed to be a solid foundation. To achieve this, I buried some concrete blocks slightly below ground level and rested the stringers on them. 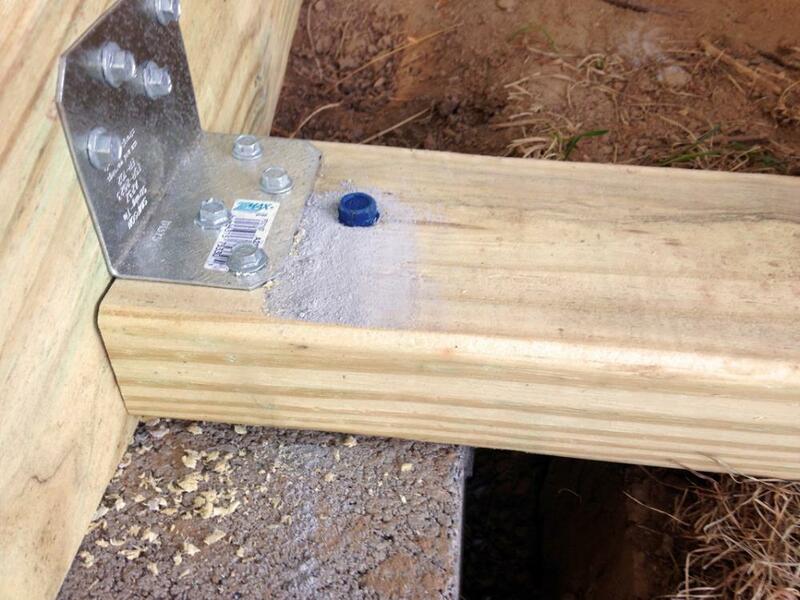 I also attached some 2 x 4 spacers in between the stringers and fastened them to the concrete using special Tapcon screws. After I covered up the concrete blocks with dirt, you couldn’t tell they were there. The concrete blocks gave the shed steps a really solid feel when you walked on them. The boardwalk style steps added a nice touch to the plywood shed. Later on, I covered up the fronts of the steps with a thin piece of plywood, and then applied a good deck stain to protect the wood. The ramp construction was similar to the steps in that it used stringers and hidden concrete block supports. 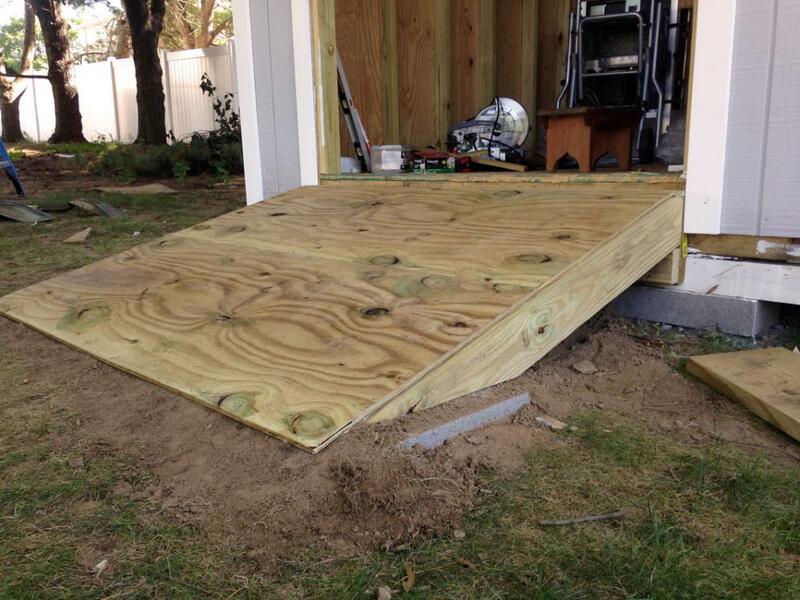 To learn how to build a ramp for a shed, read the step-by-step instructions below. 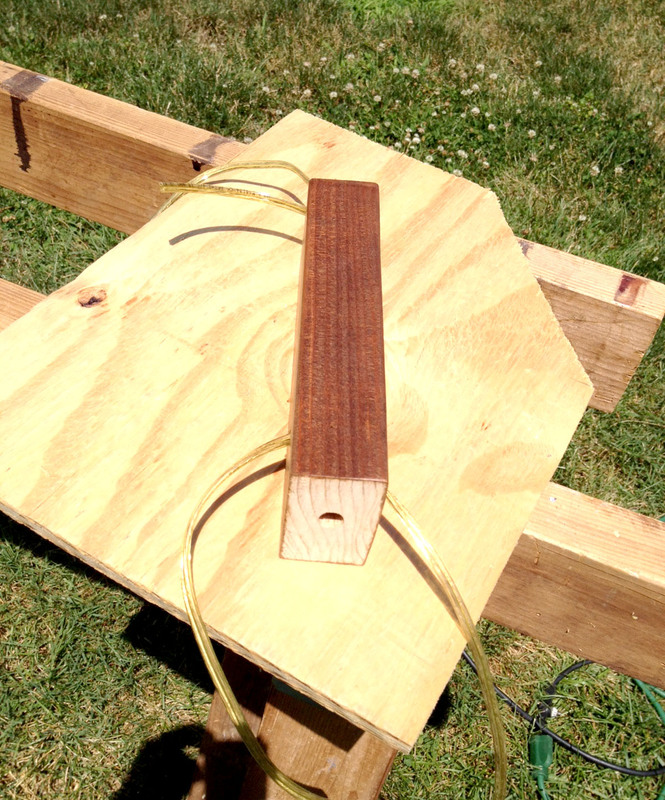 For the shed ramp, I first had to determine the angle of the slope. If I made the shed ramp length too short, the slope would be too steep and cause me problems when driving the mower up. Either the bottom of the mower would hit the top of the ramp, or the mower would not have enough power to climb the slope. Too long of a shed ramp would not look that great, and it would take up valuable yard space. After some research, I decided to go with a 4-foot shed ramp. It was going to make a slightly steeper than normal ramp, but I was okay with this. Five foot ramps seemed to be the most common length for a shed ramp. Yet, I wanted to compromise between functionality and aesthetics (be sure to keep reading this section to see how this turned out). 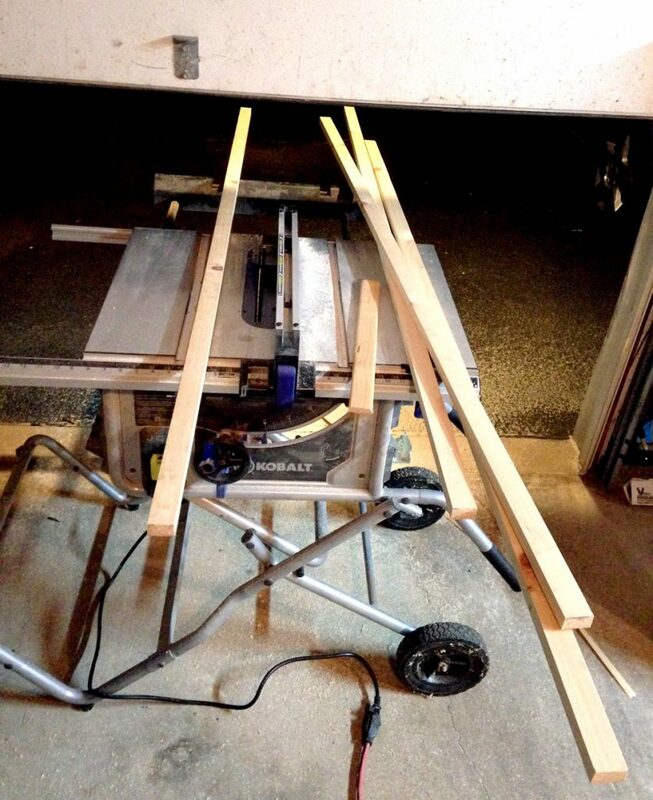 Once I determined my shed ramp length and angle, I cut 5 stringers out of 2 x 6 wood. The next step was to set and level the concrete blocks for the lower foundation. The leveling took a little bit of time because I had to get each stringer to sit perfectly flat on the blocks while maintaining an even ramp surface. Once leveled, I worked on attaching the stringers to the shed. Instead of using joist hangers like I did with the steps, I needed something much stronger to hold the weight of the riding mower. Based on my research on shed ramp design, I went with a ledger mount. This was just a piece of wood attached to the shed that the stringers rested on for primary support. 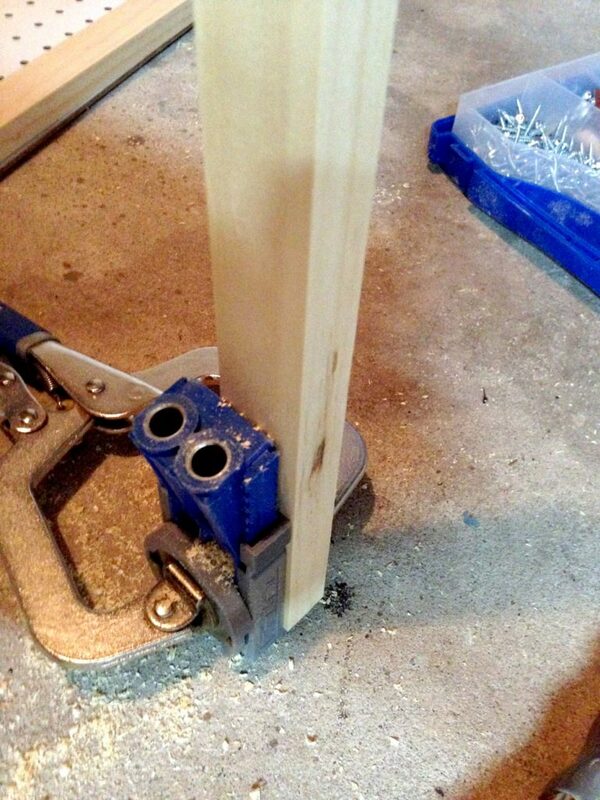 To make the ledger, I just bolted a giant 2 x 10 piece of wood to the floor joists. Near the bottom of the 2 x 10, I bolted on a 2 x 4 for the ramp stringers to rest on. While the ledger handled the vertical load on the ramp, I didn’t want any lateral movement, so I used two types of fasteners to secure the stringers to the ledger. 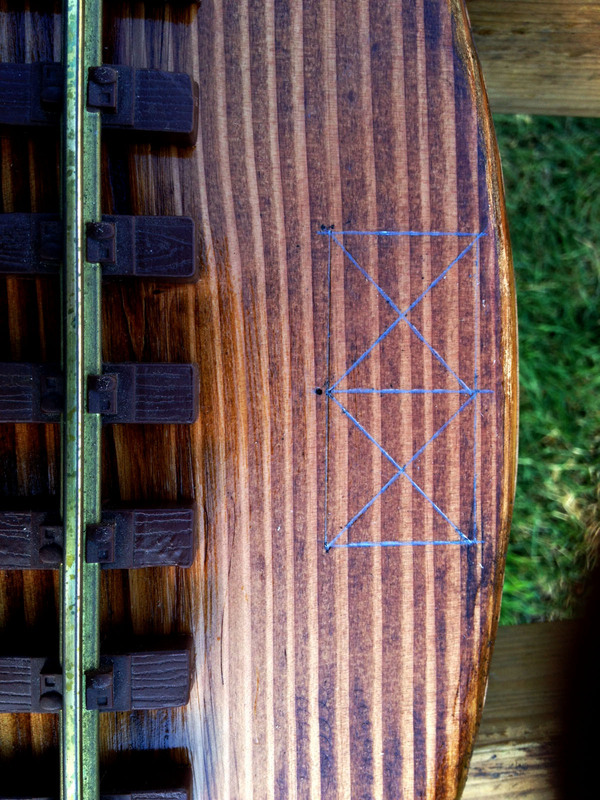 The first were some L brackets to keep the stringers in place (just one L bracket per stringer). 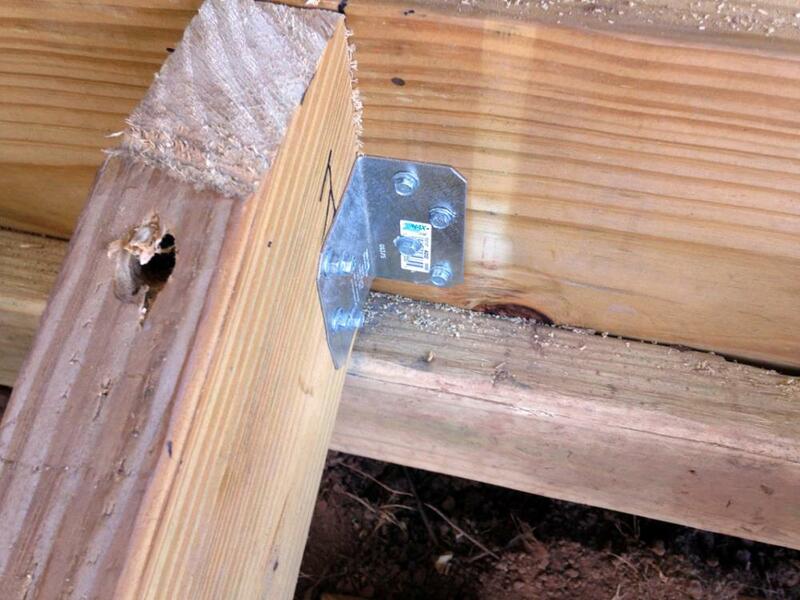 The second fasteners used were the 6-inch TimberLok screws I had secured the roof joists with. Before I used them on the stringers, I wanted to secure the lower portion of the stringers to the concrete blocks first. The TimberLok screws would really lock the stringers in place, preventing me from adjusting them on concrete blocks. 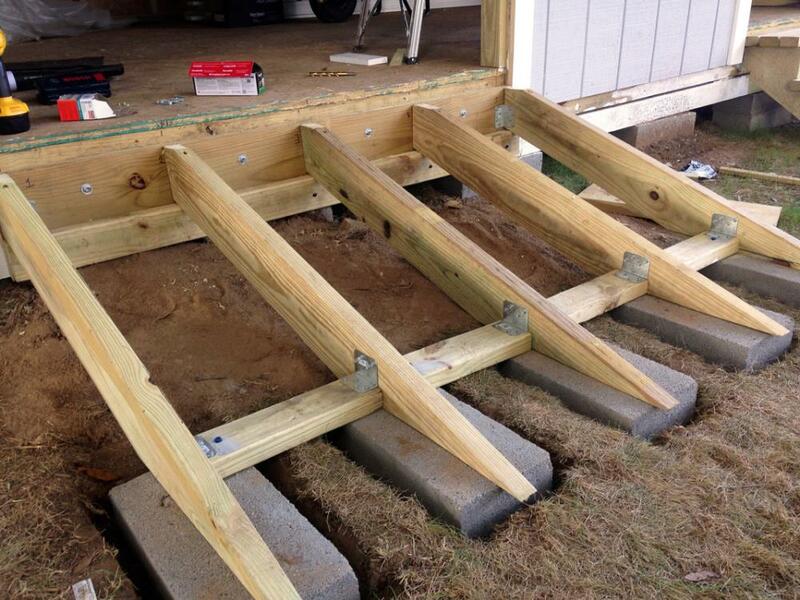 Onto the foundation for the shed ramp now – just like the steps, I used some wooden 2 x 4 spacers between the stringers. I attached them to the stringers with L brackets and used some more Tapcon screws to secure the spacers to the concrete blocks. With the shed ramp foundation set, I ran one TimberLok screw per stringer at an angle through the top middle of the stringer, straight through the 2 x 10 into the shed floor joists. This made a very tight connection between the stringers and the shed. There was going to be no lateral movement here. The whole ramp for the shed was extremely solid at this point. At this point, I was very excited. I could finally drive the mower into the shed using the ramp. So I wasted no time and retrieved the mower from the garage. I positioned it carefully at the bottom of the shed ramp, put it into gear and slowly drove up. Everything was looking great….until I made it halfway up the ramp. The mower did not have the power to drive up the shed ramp at my current speed. I should have gone with the 5-foot ramp design with a more gentle slope. So I tried a different approach to getting up the shed ramp. I reversed down the ramp, put the throttle on max, and let go of the brake. The mower shot up the shed ramp and successfully made its way into the shed. This is how I park my mower today. It took a little bit to get used to, but I have to drive up the shed ramp at near full speed, with care not to drive into the shed wall at the back. At this point, I was almost finished building the shed. I just had to attach some more trim to the shed exterior, and install the windows and doors on the shed. The shed windows went on easily. I first used window flashing tape to seal the window frame and the siding. 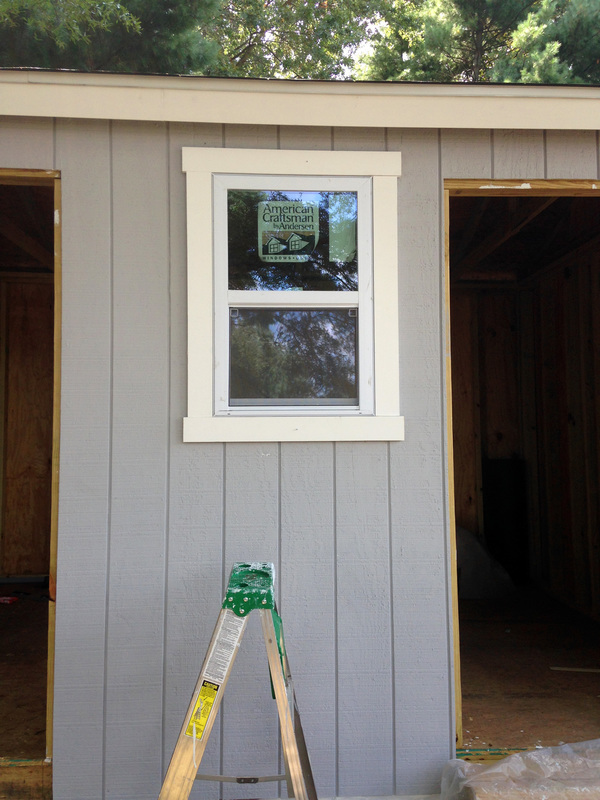 Then I ran caulk along the shed window perimeter (on the flashing) and placed the window in the opening. The caulk held the window in place long enough for me to drive some nails through the window nailing strips. Then I covered the flashing and nailing strips with trim. For the shed door, I custom built the doors following the steps in the shed design plans. I needed 3 doors for the shed – a single door by the steps, and double doors by the ramp. They were constructed with a rectangular frame of 2 x 4s sandwiched between two sheets of T1-11 siding. For the trim design, I did some research online and found several patterns to show Eileen. She has an eye when it comes to design and picked a pattern she liked. It looked fancy but was very easy to cut with my miter saw. Eileen primed and painted the doors for me to match the shed. To install the shed doors, I put them in place and spaced them properly in the door frame with some wooden shims. 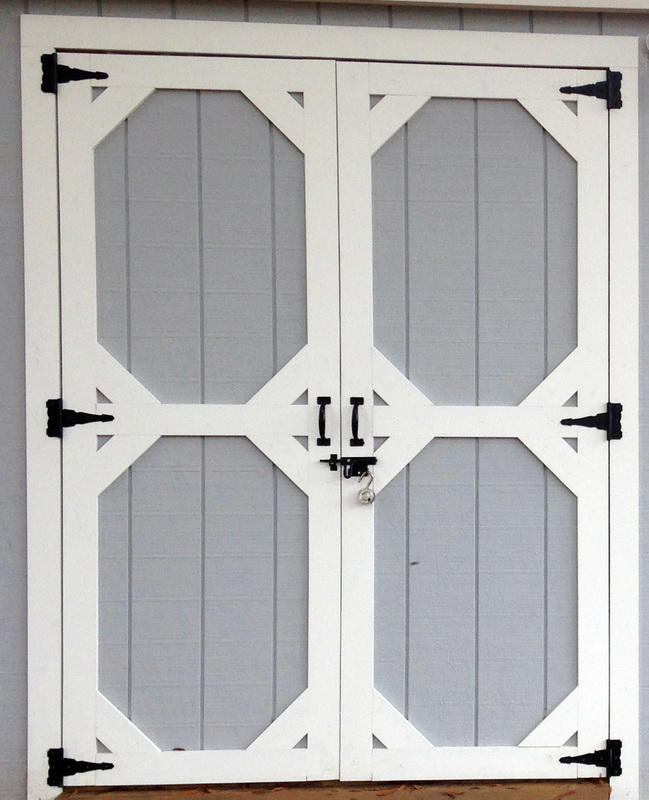 These were some seriously heavy doors, and as such, needed some heavy duty hinges (3 per door). I screwed the hinges onto the shed door frame and the shed door (making sure to hit the wooden frame inside the door). 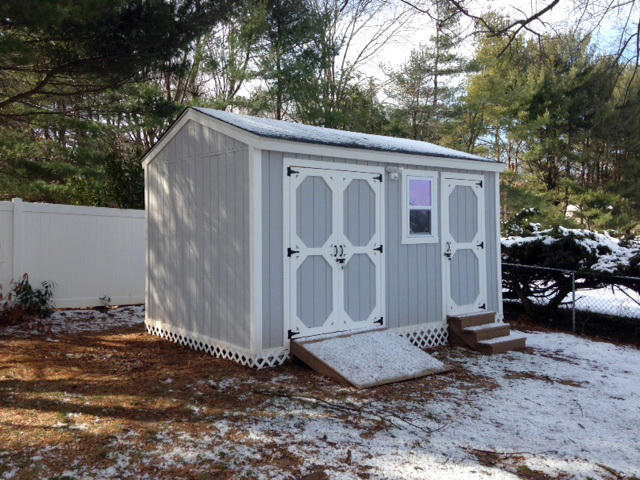 Once all the door hinges were installed, I removed the shims, and voila – the shed doors swung open nicely. To wrap up, I screwed on a door handle and a bolt lock. Almost done with the shed now! Time for some final touches. Since the shed foundation rested on concrete blocks, there were large gaps under the shed where animals could enter and reside. Because I did not have any future plans to open my shed up for tenants, I wanted to seal up the underneath area. We have groundhog problems, and they live under the sheds of our neighbors. I came up with the cheap and easy solution of using plastic lattice fence. These came in 2’ x 8’ strips which I cut to fit using my table saw. The lattice was already white and matched the shed trim. I also wanted some lighting for the shed when it was dark. I opted to use a solar panel motion LED light. So I mounted the lights in between the shed door entrances. Then, I positioned the solar panel on the right side of the shed where the most sunlight was available. Finally, I completed the shed! It took about 2 months for me to single-handedly build the shed, and it cost about $3000. 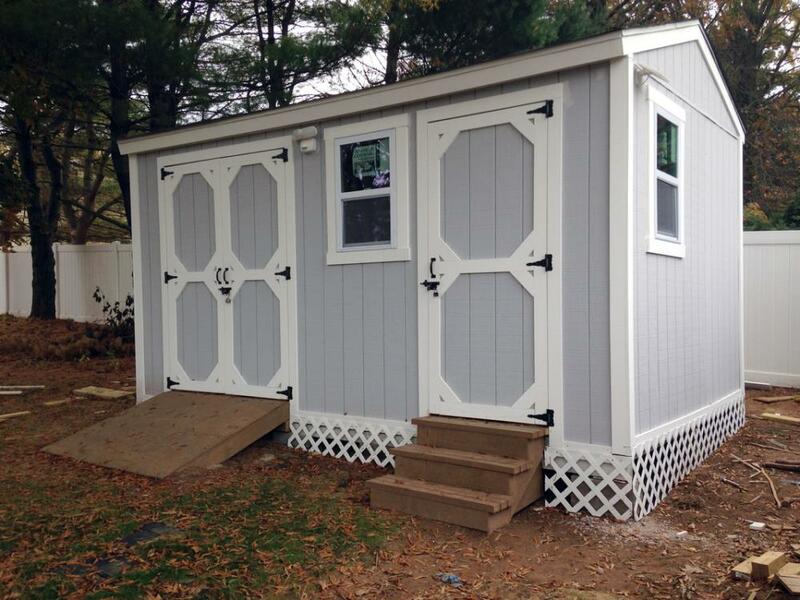 I did my research online and estimated that a pre-built shed this size and quality would have been more than $7000. Building it myself netted huge savings. The shed freed up a lot of space in the garage too. The riding lawn mower, push mower, wheelbarrow, gardening tools, and other large items fit in there with lots of room to spare. It definitely provides a lot of storage space. We even put all of our summer patio furniture in there during the winter – with space left over. It was definitely a worthwhile endeavor. With no construction background, and never having built anything close in capacity to a shed, I impressed my wife, my neighbors, and myself by building a shed. My work on the shed isn’t over yet though. I still have some interior plans for it. Down the road, I plan to install shelves and other organizational units. I also want to install another solar motion light inside the shed too. Additionally, I envision a partial interior wall to provide more wall space for hanging tools (in case the four shed walls weren’t enough), and possibly utilizing the roof rafters for some storage. The sky’s the limit, and you can bet there will be a blog post to tell you all about it! If you missed Building a Shed Phase 1 (Foundation and Framing) or Building a Shed Phase 2 (Paneling and Roofing), be sure to check them out. One of Ash’s favorite meals is a simple pot of rice and beans – but he gives it a little kick with a hot pepper called a wiri wiri pepper. It’s a Caribbean hot pepper, so it’s hard to find around here. Luckily, Ash’s mom had a plant to give him. She was happy to pass it on because they were having trouble growing it in their soil. That’s how the wiri wiri pepper plant on our fireplace came to be. But here’s the ridiculous part – Ash didn’t have a planter around, so he looked around the garage and ended up planting it in a fish bowl. It’s even more ridiculous that the fish bowl wasn’t meant for fish – it was originally going to be a helmet for a robot scarecrow. So, it was only a matter of time until I suggested a proper planter with some drainage, rather than the silly fish bowl. I was thinking we could make a collection of planters too, so I could plant some herbs. 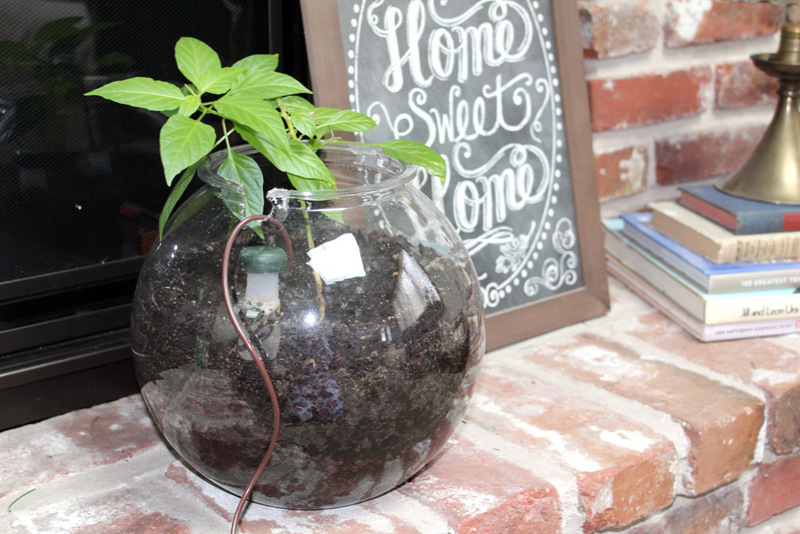 The wiri wiri pepper was growing really well on the fireplace, so why not try my hand at a little indoor garden. While thinking about a creative DIY planter box to make, I remembered how much our toddler loves (and I mean LOVES) shapes. Rather than asking people their favorite color or favorite food, he asks them what their favorite shape is. 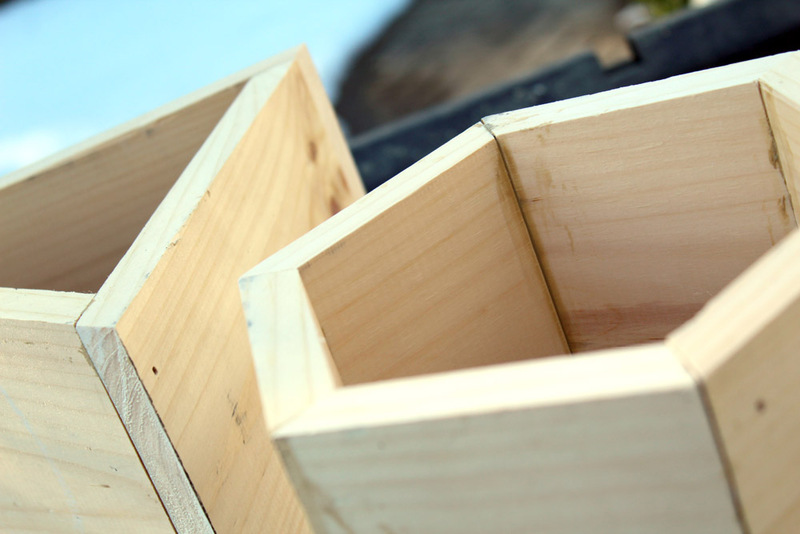 So, rather than making a couple ole rectangular planters, we decided to be a little creative with shapes for our DIY planter boxes. 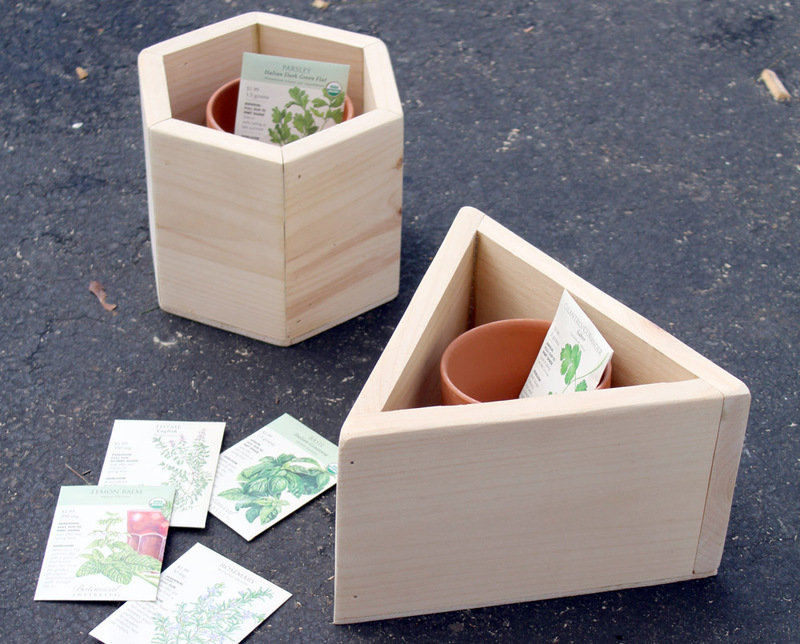 With DIY planter boxes, you can either fill the box up with dirt or just conceal a pot inside. Putting dirt directly inside the box requires the use of certain types of wood (like cedar) or protective stain treatment (I highly recommend a non-toxic stain if growing herbs). Without this, the wood may start to rot quickly. Since we had a lot of scrap pine board cutoffs in the garage, we went the simplier route and decided to just hide a terracotta pot inside our hexagon planter box. 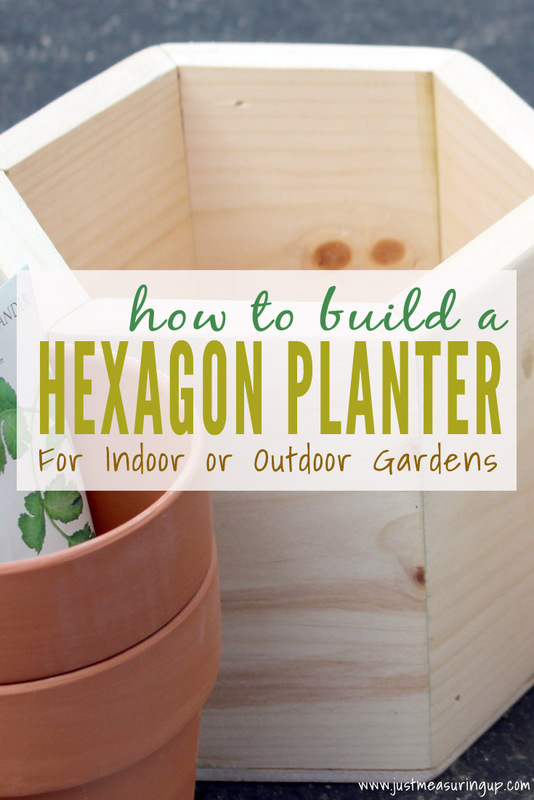 To build a hexagon DIY planter box, we needed six identical wooden segments to make the six sides of the hexagon. Then for each segment, we needed to bevel the edges at a 30 degree angle so that they could fit together seamlessly to form the hexagon. Bevelling the edges was a breeze with our table saw. 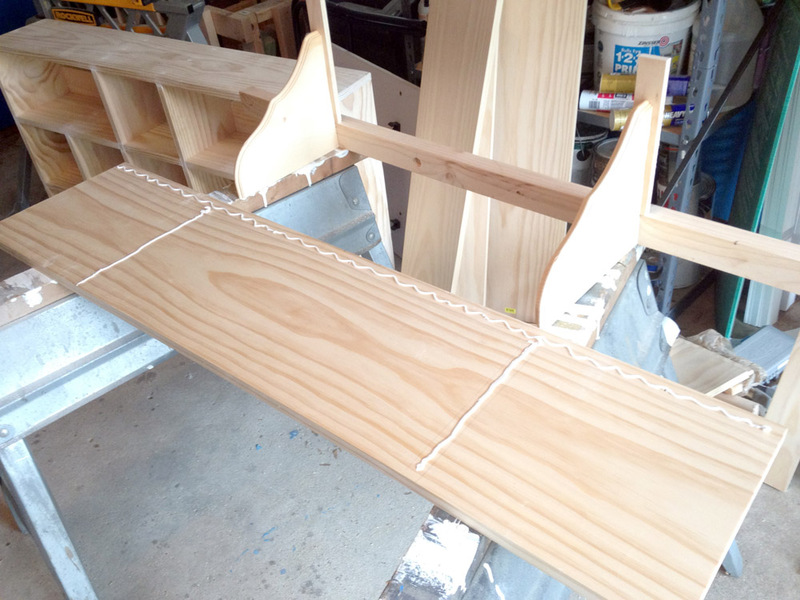 Once we had 6 segments, it was time to connect them together with wood glue and finishing nails. 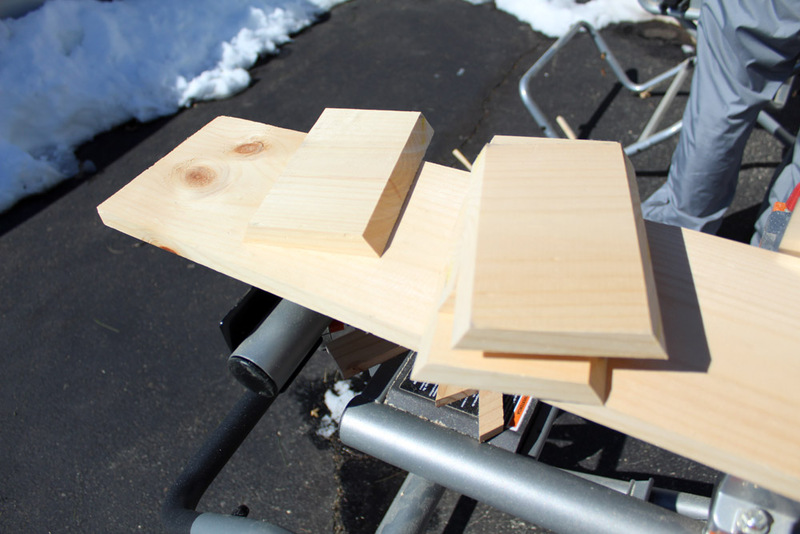 We used a clamp (our handy JawHorse) to hold the segments in place to help with this process. Next, we pressed another segment against the glue, and used two finishing nails to hold the pieces in place while the glue dried. Then, Ash used his finishing nail gun to speed up this task. 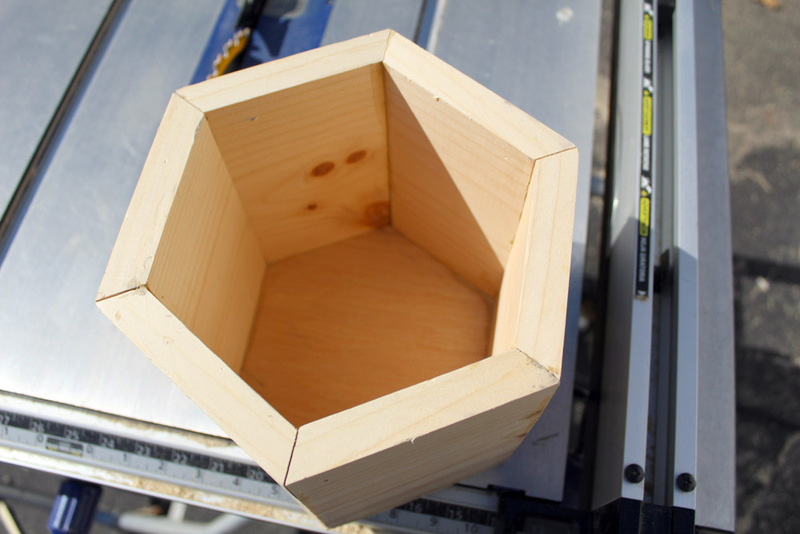 Segment by segment, the DIY hexagon planter started to take shape. When all the sides were connected, it was time to cut out a base for the wooden planter box. 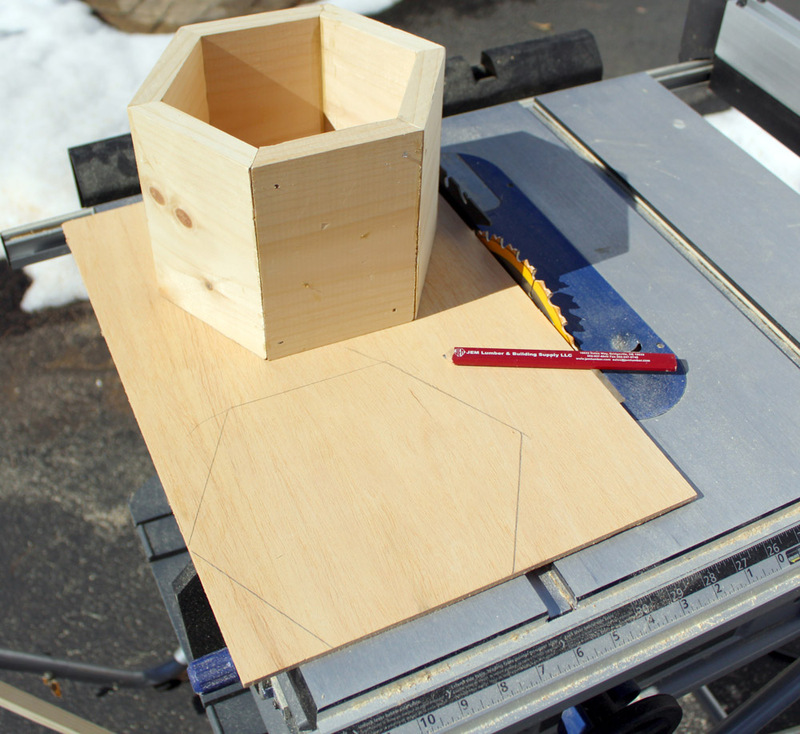 To make the base, I traced the outline of the hexagon against a plywood sheet. 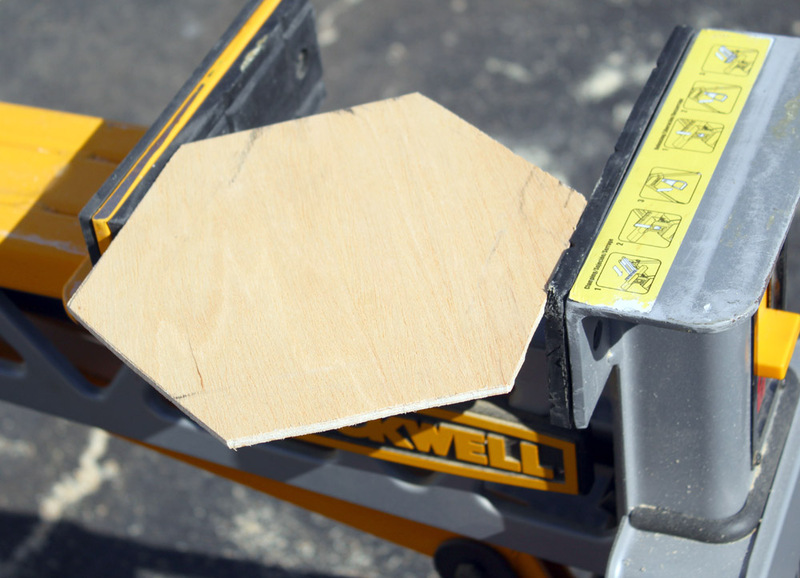 With the assistance of a clamp and a jigsaw, I cut the hexagon out of the plywood. I had to hold the plywood very firmly as I ran the jigsaw through the wood. 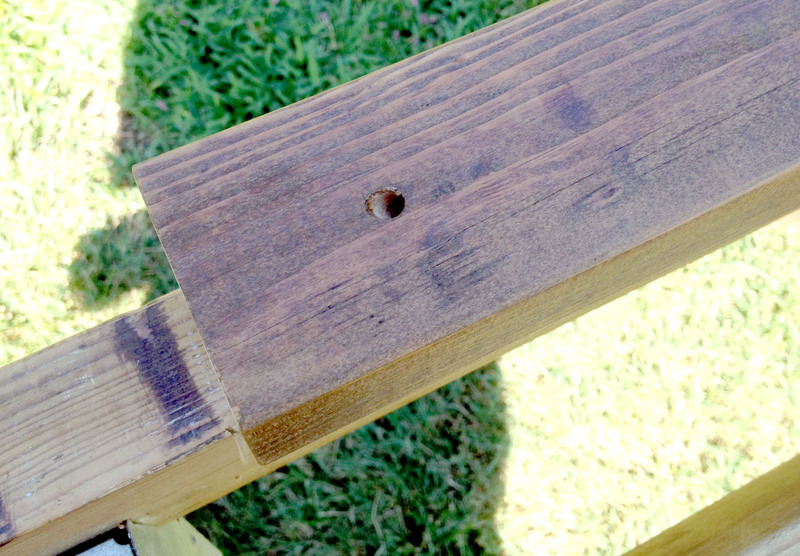 To attach the base to the planter box, we used more wood glue and finishing nails. The hexagon planter box was mostly done at this point. The triangular planter box was very similar in design to its hexagonal planter box cousin. The main difference was the number of segments – I just needed three. The segments still needed 30 degree bevelled edges to make a seamless triangular shape. 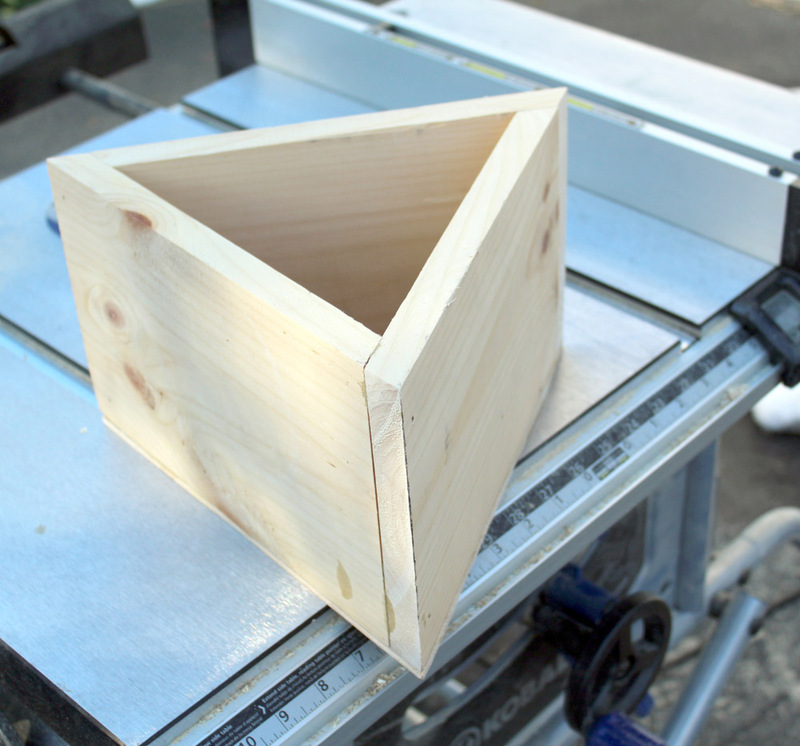 I repeated the steps I did for the hexagon planter box, producing this nice triangle planter box. As with most woodworking projects, you’re not done until you give everything a good sanding. So I used my random orbital sander to smooth all the edges, making the planter boxes easy on the hands to handle. I haven’t decided if I am going to paint or stain these DIY planter boxes. Check back next week for an update – along with an updated picture of the wiri wiri pepper’s new home. There’s one room in my house that just drives me nuts. No organization, nothing pretty about it, and it’s not functional for our family. This room – our mudroom – needs a complete overhaul. I mean knocking down a few walls, fresh flooring, wall paint, and a complete rearrangement. It seems like such a big project, so we’ve been consistently putting it off until summer…summer of 2016, then summer of 2017…. and here we are in 2018. So this year is the year. Mark my words! I decided to get started on the mudroom makeover with little tasks to make the room more functional. Plus, knocking out some of the little things always makes a large task seem smaller. First things first, there’s nowhere for coats or bags – except a hat stand in the corner, which just makes the room look messier. 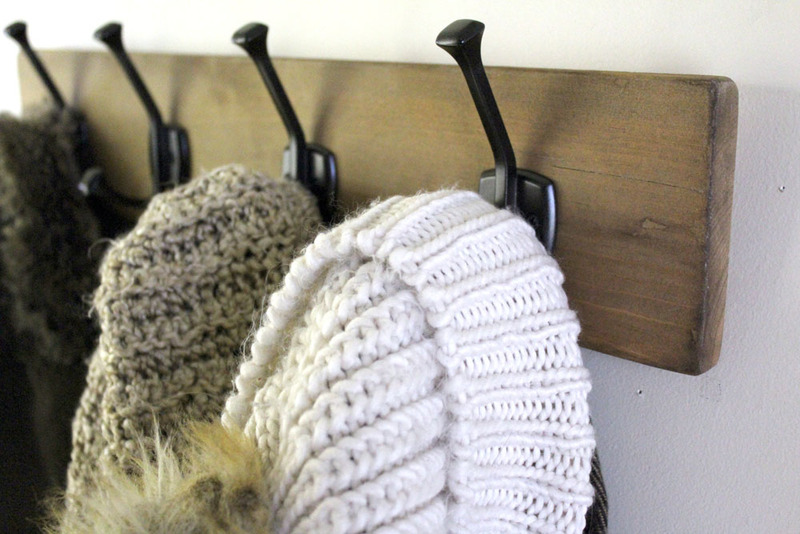 So, I decided to make a simple wall-mounted hook rack for coats, scarves, and bags. One of the things that drives me crazy about our mudroom is that it’s so disorganized. 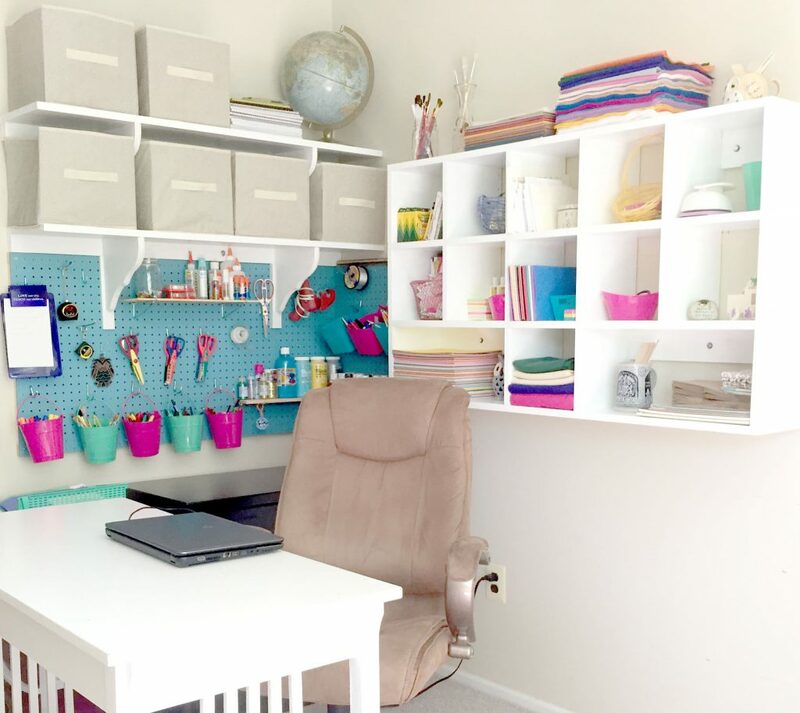 Since my project list for this year revolves around keeping an organized home, this is the perfect place to start. So, I killed two birds with one stone by grabbing a piece of scrap wood from the garage and using that to make this simple DIY hook rack. One less piece of wood laying around the garage, and hopefully less coats and bags around the mudroom. 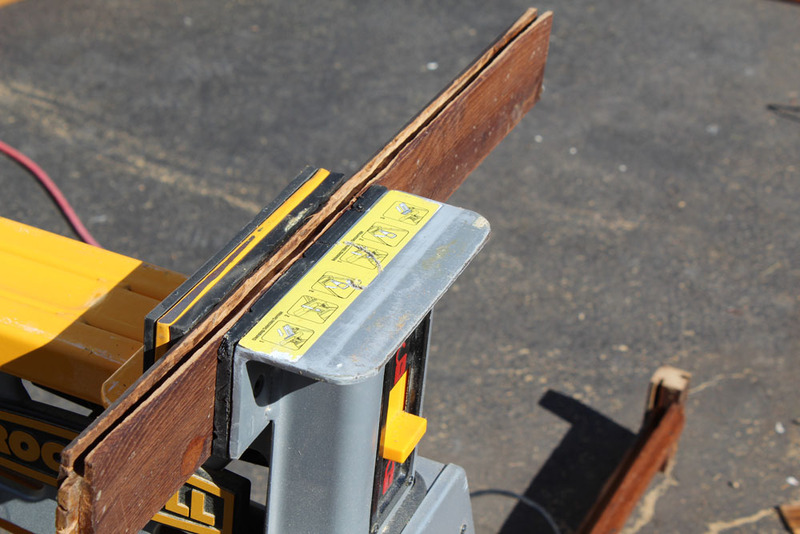 Piece of wood – I grabbed scrap wood from the garage that measured roughly 5″ x 24″. 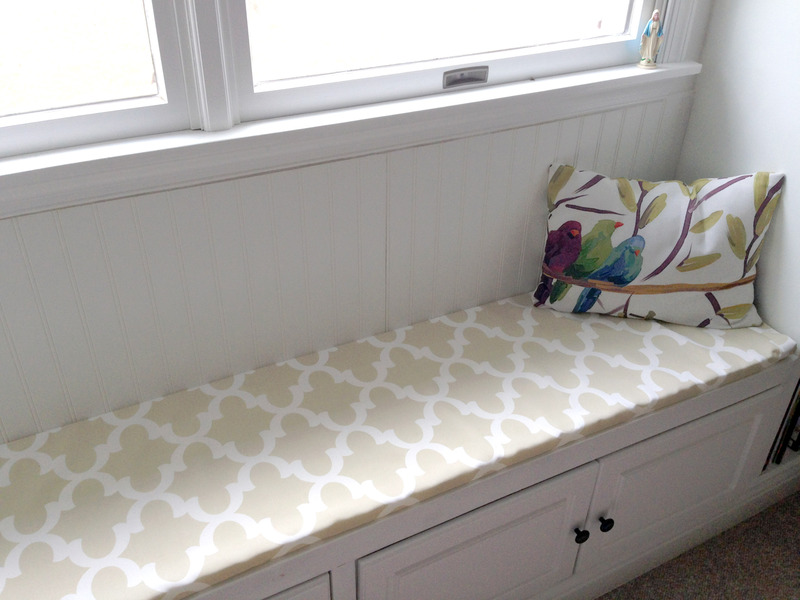 Paint or stain – I stained this piece with homemade stain! 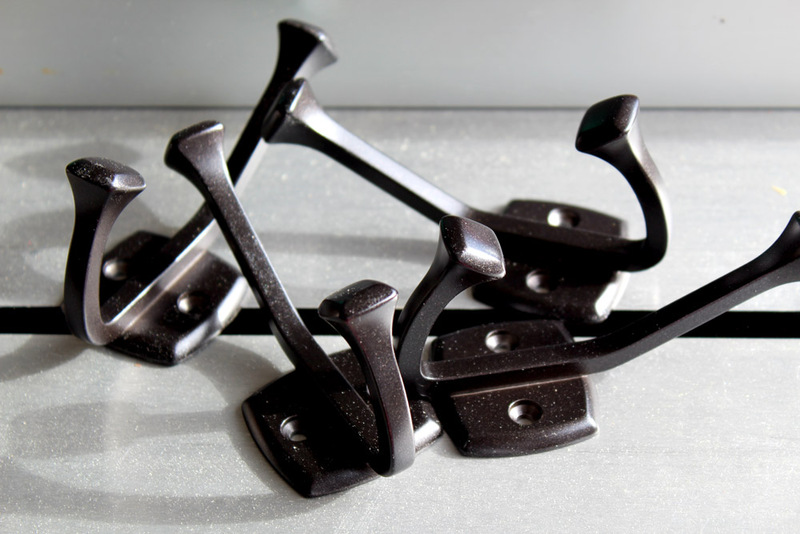 Four hooks – I picked them up at Home Depot – but these hooks are similar. 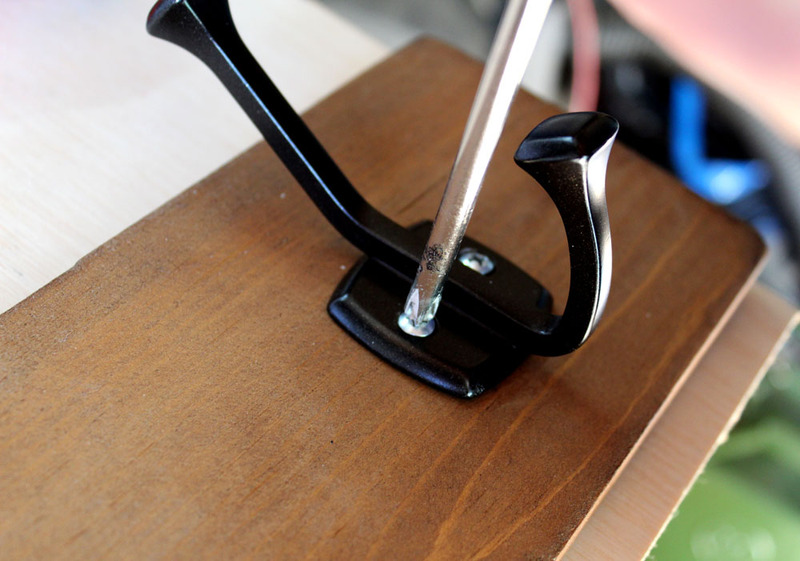 Sander – I used my random orbital sander to restore the scrap wood to its former beautiful self. I used my saw horse clamp in conjunction with this. 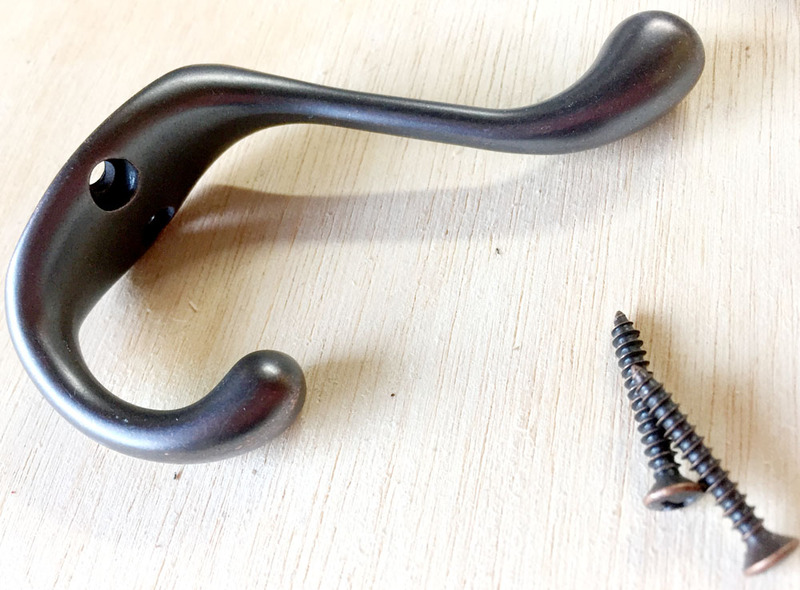 Now for the instructions on how to build a wall-mounted hook rack – and I’m sure you’ll find it quite simple. 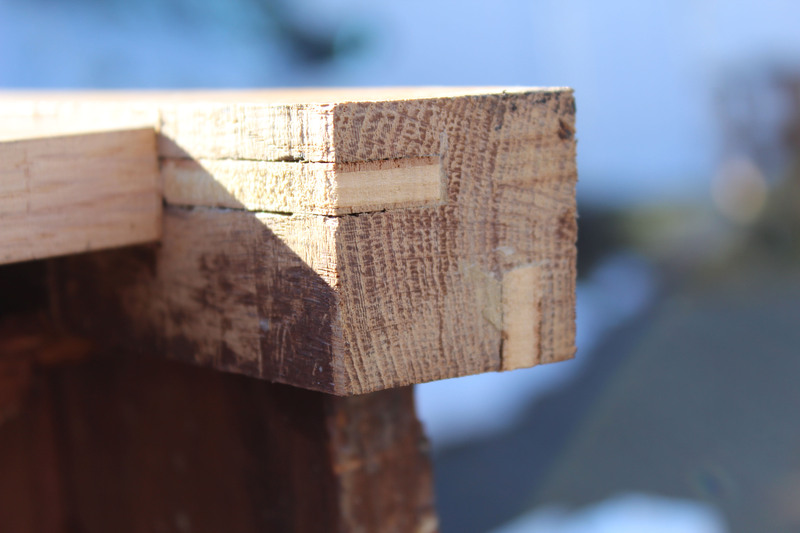 First, I grabbed a piece of scrap wood that looked like it would nicely fit four hooks. It was roughly a 5″ x 24″ piece. I put it into my saw horse clamp, so I could easily sand it down. It was a little beat up from laying around the garage. Next, I used the random orbital sander to smooth the wood. 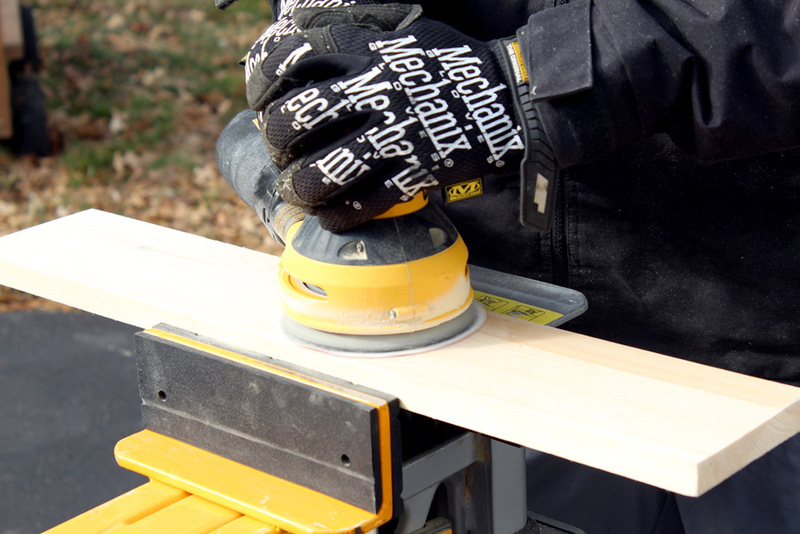 This is one of my favorite tools because it does a very even and consistent sanding job. I used 80 grit sanding paper for this task. Not only did I sand both sides of the DIY hook rack to-be, but I also rounded the corners with the orbital sander. Rounded edges add a nice touch of professionalism to any piece. They are also easier on the fingers because they remove any splinters or coarse edges. If you have a router, you can take it a step further and bevel the edges to really impress your friends. 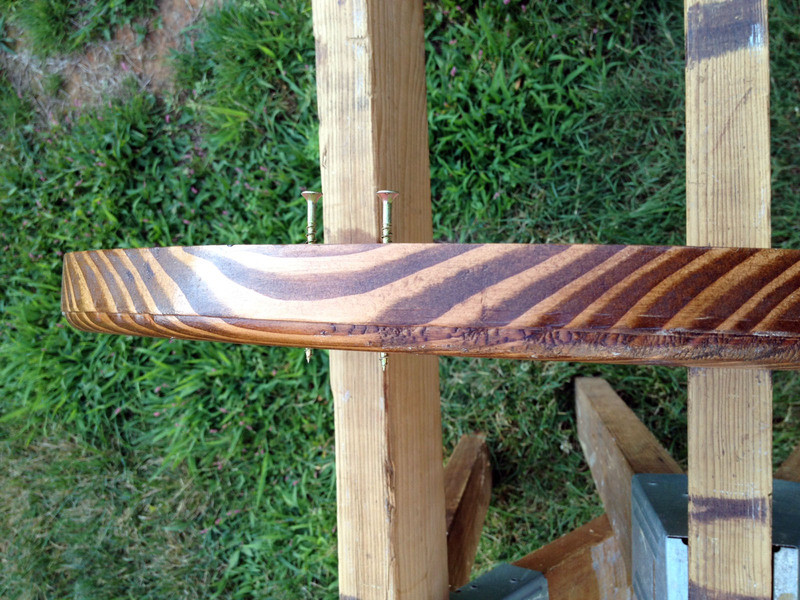 Next, I stained the hook rack. 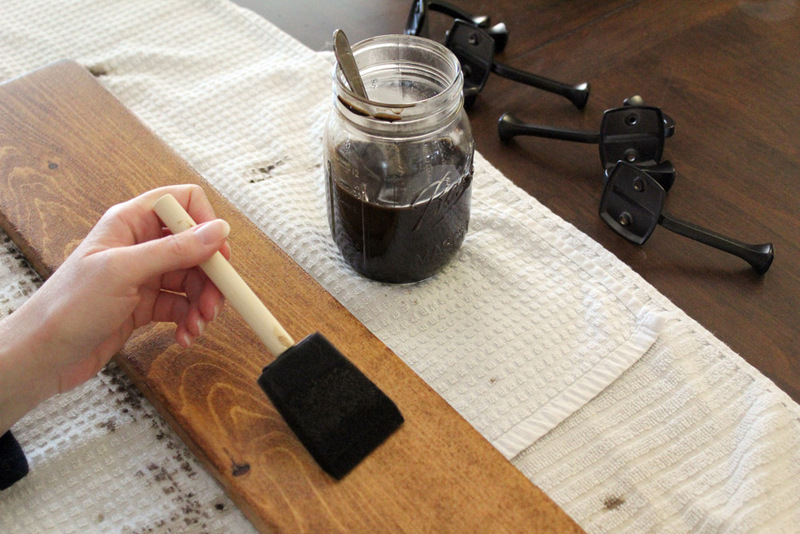 I used a homemade wood stain made from pantry items – which I am loving! I stained it right on my kitchen table with no gloves. 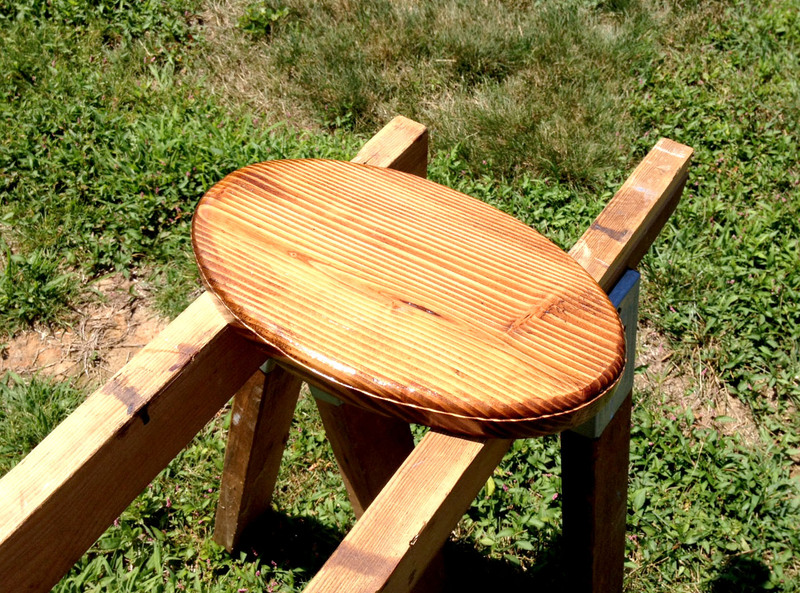 What a treat to use a completely chemical-free wood stain! 🙂 Check out how I made this homemade wood stain. After the stain dried, I lined up my hooks evenly and marked where they would go with a pencil. I measured about 3 1/2 inches in from each side and place hooks there. Then, I evenly spread the remaining two hooks in the middle. I used a ruler to line the bottom of the hooks up. 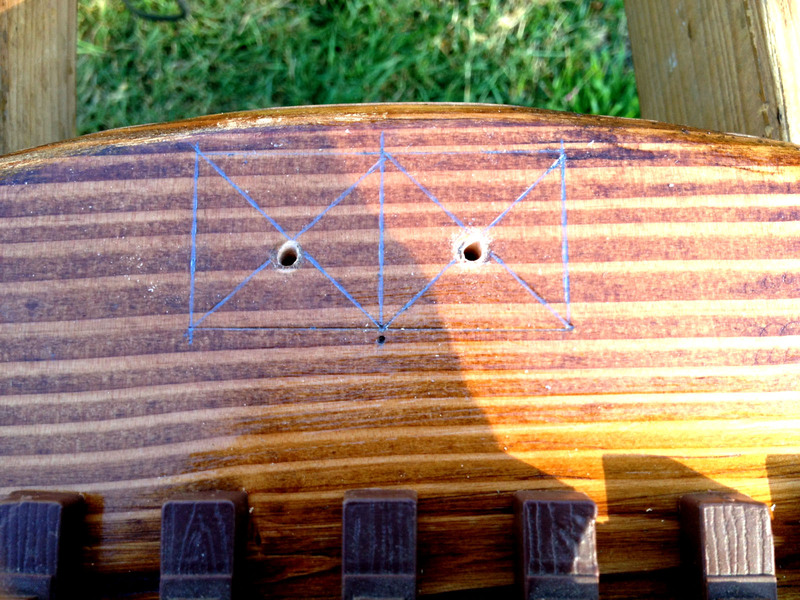 Then, I put a dot with a sharpie in the center of each screw hole. Next, I sealed the hook rack with Annie Sloan clear wax. One day I will make my own from beeswax 🙂 Once that dried, the DIY hook rack was ready to have the hooks attached. To attach the hooks, I simply used a screwdriver. The wood was soft, so there was no need to pre-drill. I used an electric screwdriver to get most of the screw in. Then, I just tightened them with a regular screwdriver. This was partially because of the awkward angle caused by the hooks. 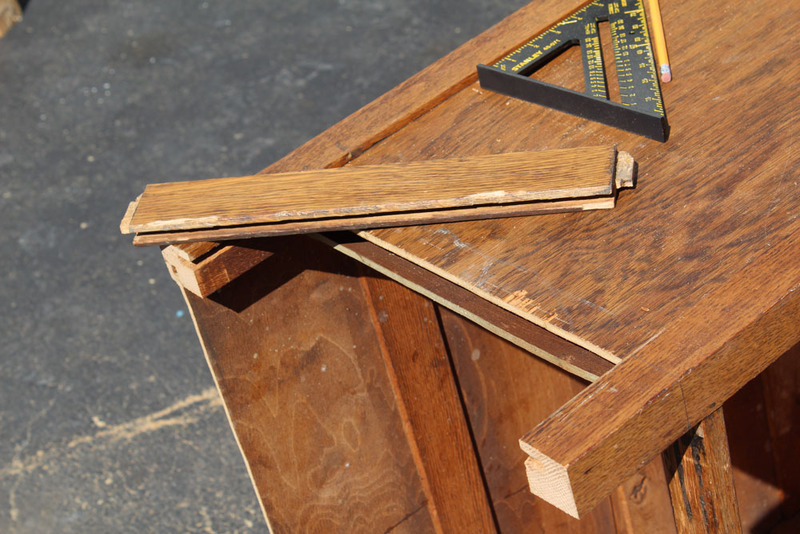 However when working with soft wood, it’s always a good idea to use tighten up your screws manually with a screwdriver. 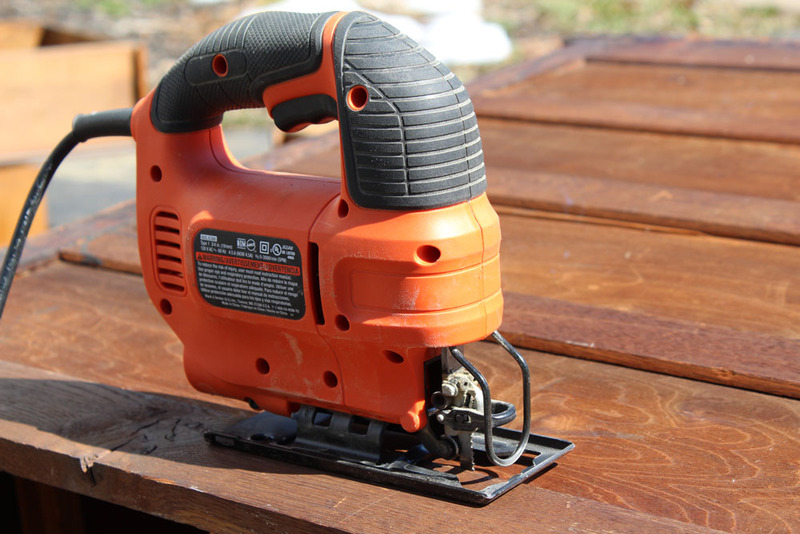 With a power tool, you can too easily overdrive a screw in soft wood resulting in no grip at all. So, I had two options. 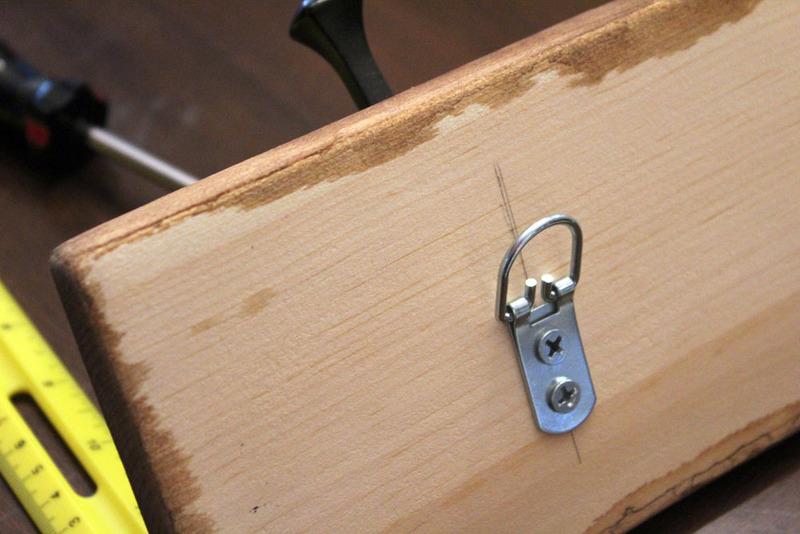 Use the screws that came with the hooks and then use the dremel or oscillating multi-tool, to clip off the ends. 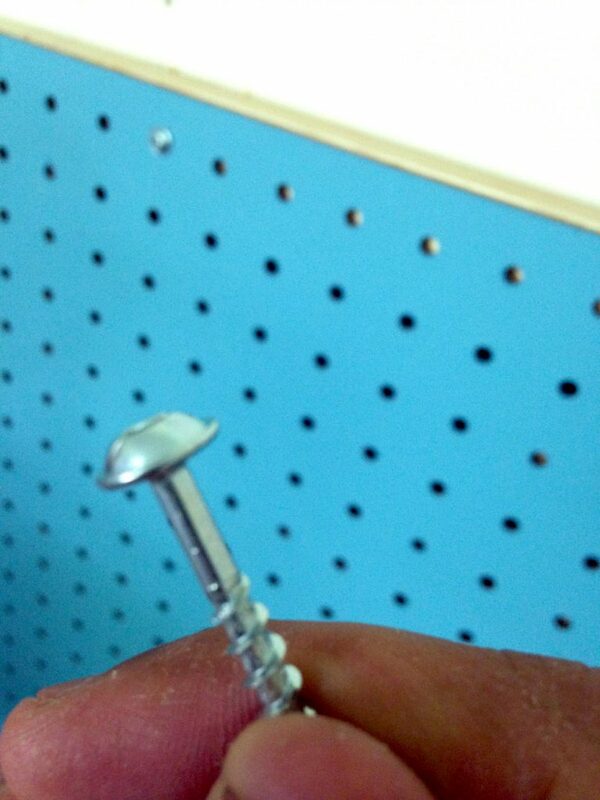 Use smaller screws of a different color and then paint the screw head to match the hook. I went with the latter option and painted the screw head with acrylic paint. I mixed black with a little blue and then dabbed it on with a very thin brush. In mounting the DIY hook rack to the wall, we had two options. The first was to use D-rings at the back (these come with most mirror/frame hanging kits). This option didn’t alter the front of the hook rack at all. The second option was to drill a hole on both ends of the hook rack for wall screws, and plug the heads with caps. I opted to use the D-rings because I wanted an unblemished surface without any caps. 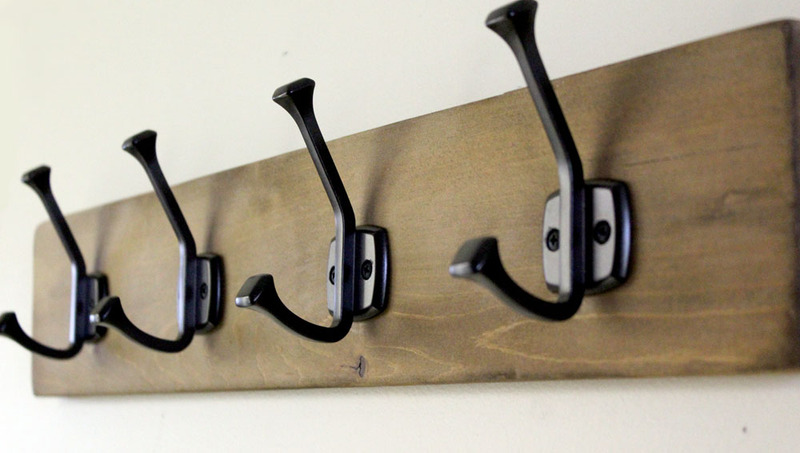 If you end up using caps, consider getting wooden ones and stain them to match the rest of the hook rack. This project took me about an hour, if you don’t include dry time. 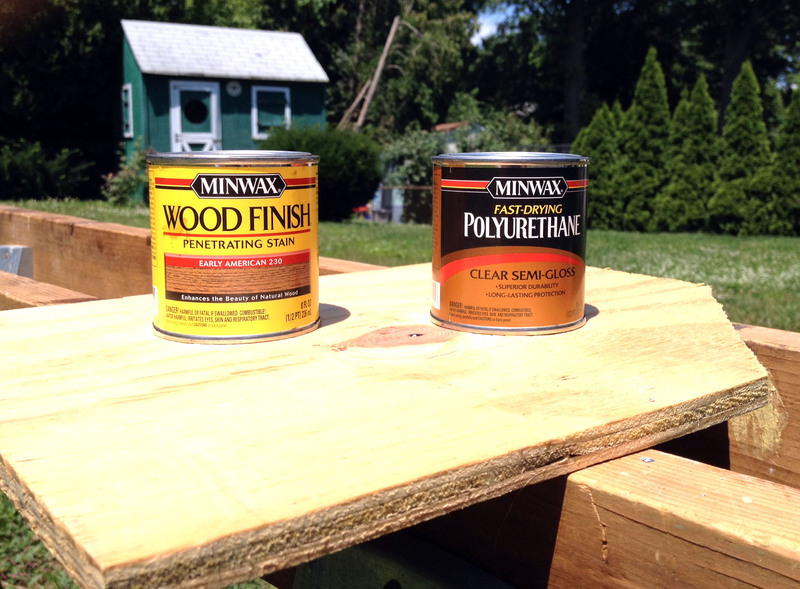 The scrap wood was free, as well as the staining materials. I did have to purchase some D rings from the store for $4 and the hooks for about $10. If you ask my husband, he knows it makes me crazy when he says he didn’t have time to do something. Yeah, I’ll have time later. Even though I know how busy we are, the time excuse makes me crazy. Because the way we keep our schedules, if you want more time, you have to make it. And you can, if you manage your time well. I first learned to manage time when I was waitressing in college. For the first few weeks, I ran around like a chicken with my head cut off. Then, I eased into a routine. While one table was waiting for their food, I would head off to take another’s order, stopping by the beverage station to grab a refill for a third table, and extra sugar packets for a fourth. I definitely put those skills to use when I started teaching classes of 35+ kids in the inner city. After all this, I thought I was awesome at managing time… until I had my own kids. Nursing a newborn while potty training a toddler had me feeling the same way I did when I was a new waitress in the weeds. However, I have learned if you manage your time well, there are so many ways to find extra time in a hectic schedule. With the follow eight tips, you’ll be making extra time in your crazy schedule – in no time 🙂 You’ll be amazed at just how much more time you will have. You already set snooze as many times as you possibly can, so how can you get up earlier?! I felt the same way… until I did it. Getting up an hour earlier gives you time to work on your projects. The chance to work on your project first thing is a great motivator to get you out of bed. 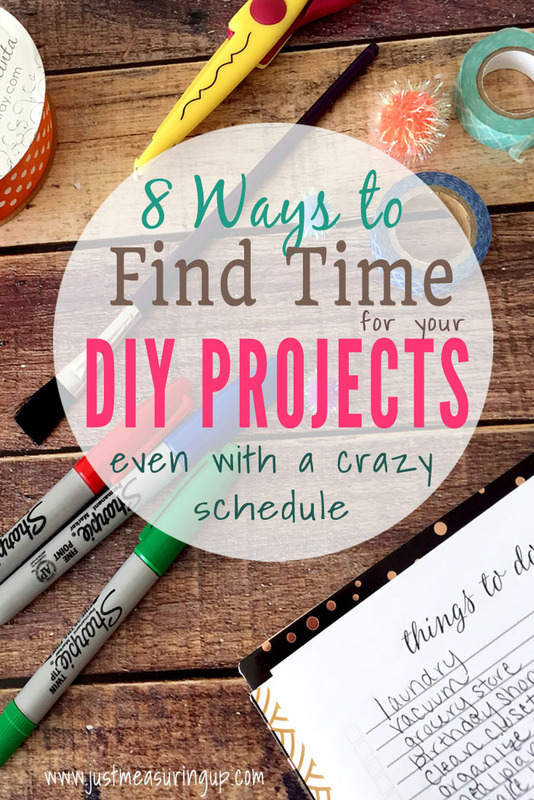 Or, start your day (throw dinner in the crockpot, get the day’s chores done), to free up that hour later for your diy projects. It’s so peaceful in the mornings. The house is so quiet that you’ll never sleep in again. You know when you are throwing a party and the day of the party, you still have a long list of things to do? Then some guests show up early. And, the rest of the list goes out the window. Think about your day, your week, your schedule. What things can you cut out – that wouldn’t be noticed? Maybe you start vacuuming once a week instead of every other day. Maybe you really don’t need to do laundry every day? If you can cut a couple things out of your busy days, you’ll dust off some much needed diy time. Have little ones and a project you’re dying to work on? You can actually manage both at the same time. Simply set up a little station for your kids to work too. If you’re painting a piece of wood, give them something to paint too. If you’re sewing a craft, give them some fabric to play with or color. My toddler LOVES our craft time. He usually picks up all of my scraps and makes things with them. 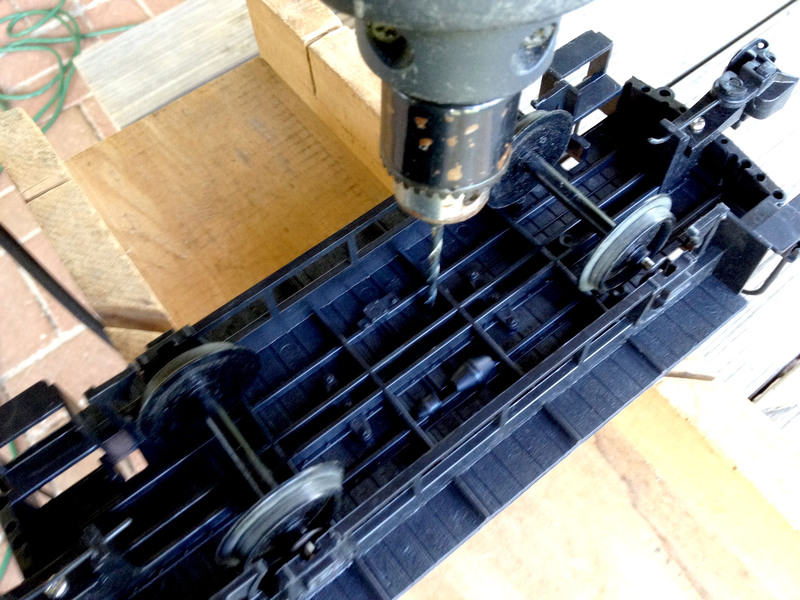 He put together a bunch of foam scraps into the shape of a train the other day. Working alongside your child inspires creativity and gives you quality time together. Maybe your husband can take over dinner or packing lunches a few times a week. Kids can start making their beds or doing their laundry. Maybe your mom or a mommy’s helper can come watch your little ones while you get some DIY time. Think about your schedule. And find a few ways that you can delegate some of your tasks. Delegation is definitely a win-win that you can benefit from. There’s nothing like FINALLY having time for your diy project, and then you can’t find the painters tape, or the ribbon you wanted to use, or the tools you need. Or, maybe your workspace is covered in junk. Or, maybe you can’t find the website with the instructions (or the pin you thought you pinned). 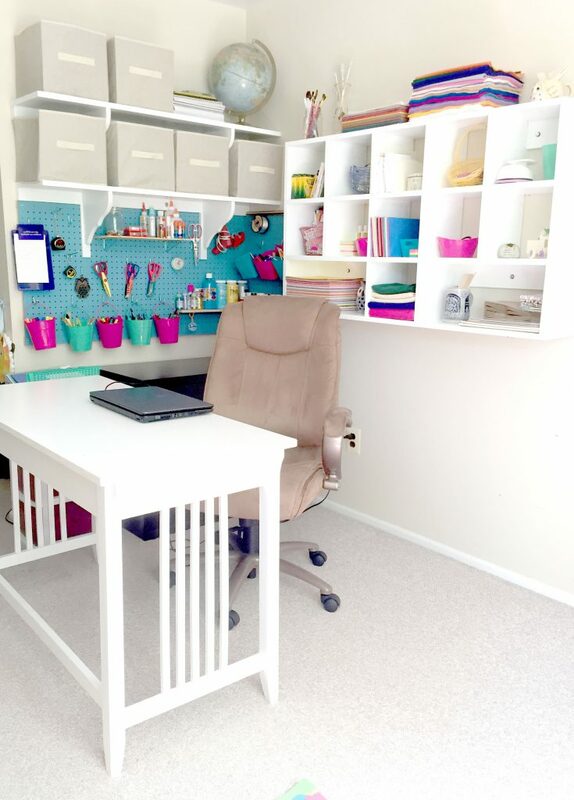 Take a few minutes during the day and get your project, your workspace, and your instructions organized. When you finally have the time, you can jump right in. Get the dishes washed. Delete your emails. Steam the floor. Have a slow eater in your family? Clean up the kitchen while they’re finishing up. Make the kids lunches for the next day. Write down your shopping list. As much as you want to relax, using this time wisely lets you cross TWO things off your list, instead of one. How’s that for productivity?! Even though I manage my time well, my cell phone is my downfall. I check Facebook, then I see what’s trending on twitter. I look at the news, my instagram feed, and of course, reply to all my text messages. Yet, once I started realizing all of the time I was wasting, my mind was blown. All those minutes add up into hours a day. Those hours across a whole week – the number was insane. Even though I love to relax by checking my phone, I would much rather be spending this time on my DIY projects. During my college orientation, one of the deans gave amazing advice that I still follow today. He said that in the next four years, you will find yourself waiting a lot. Waiting for that awkward amount of time in between classes – where you have more than a few minutes but not enough time to go back to the dorm. Waiting for professor’s office hours to start, waiting for your study group to show up, waiting for class to start. He said that all that time adds up – so use it wisely. His advice undoubtedly applies to more than just college. Waiting is a big part of life, especially with kids. So use those few minutes you are waiting in the school parking lot to answer emails or make a hair appointment. It will make your to do list shorter later – giving you more time for your projects. Pick just one or two of the above tasks to work on. 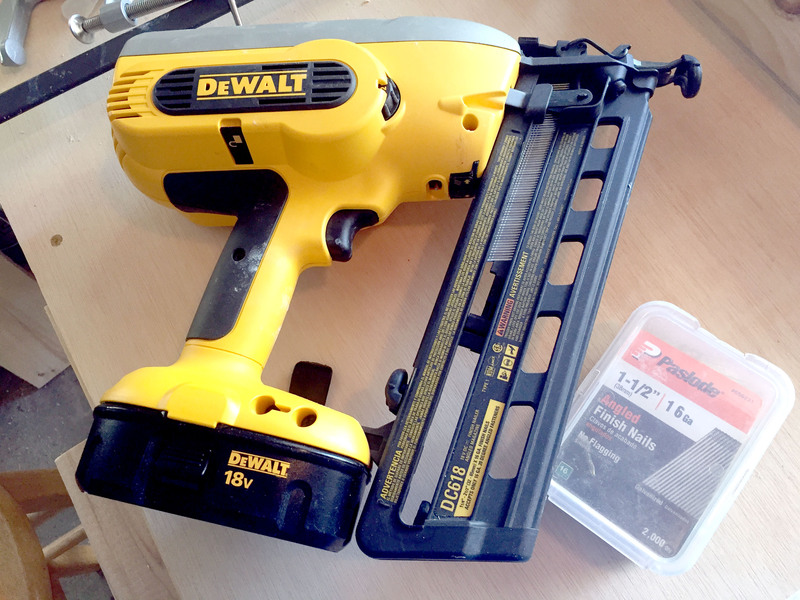 You’ll soon start to see that you’ve freed up some time for your DIY projects. With your hectic schedule and the constant running, you will finally have time for yourself and the projects that you’ve been dying to start. Hands down, the holidays are my favorite time of year. Growing up, my sisters and I loved making creative DIY Christmas gifts for our family members. I remember painting small scrap wood blocks to make buildings for my dad’s hobby train setup. I drew signs on each of the buildings and stores, naming them after our family, such as Momma’s Art Studio and Bridget’s Bakery. More than 20 years later, my dad still has these little buildings. Years ago, I made everyone in my family crocheted scarves handpicking the yarn and style for each person. This past weekend, my mother-in-law was visiting and was delightfully wearing the cranberry red scarf I made her so long ago. That’s the thing about homemade presents – they become such cherished gifts. So much more thought and time goes into them that they really do become treasured. 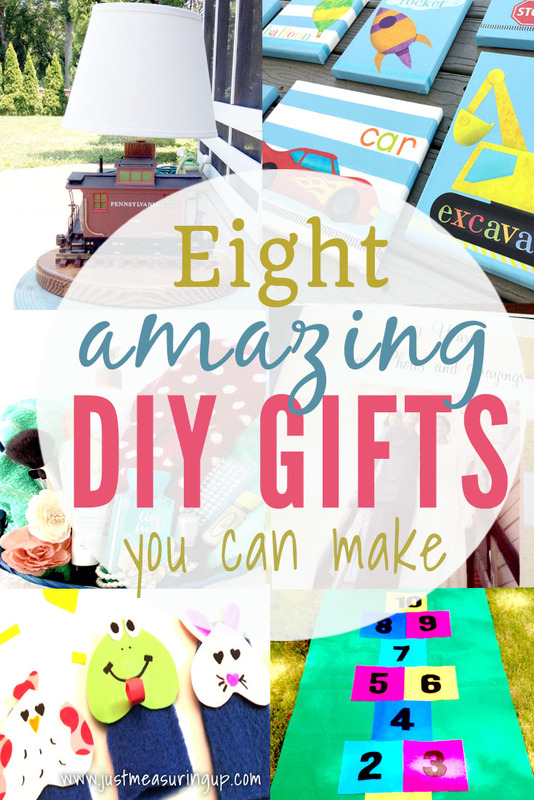 So today I’m sharing 8 DIY gifts that you can easily make this holiday season – along with a homemaking bundle that you and your family members will love. These can be easy homemade gifts for friends or family or even kids. Did you know that you can make a lamp from anything? 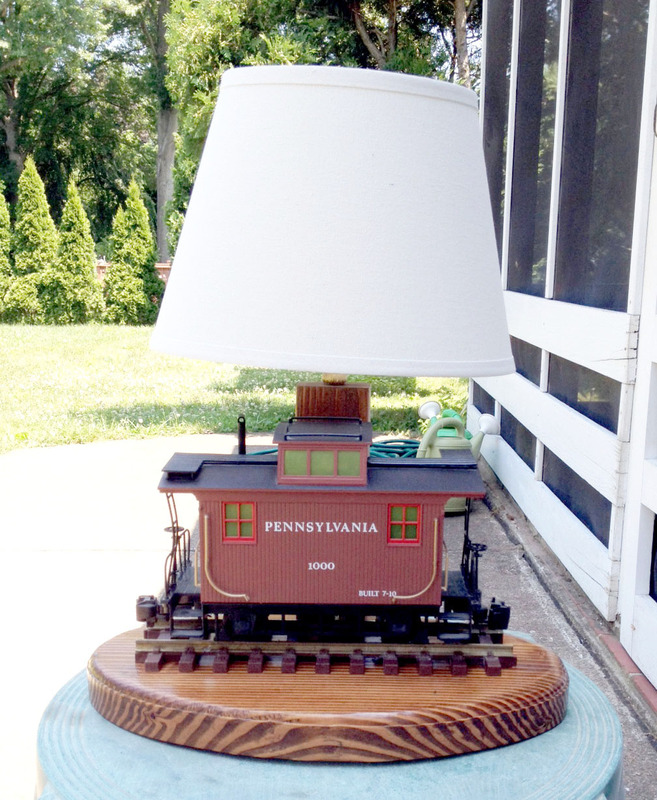 This DIY lamp was made using a model train! How cool is that?! The idea came from an old fisherman’s lamp that my dad repurposed into a lamp that he would enjoy. 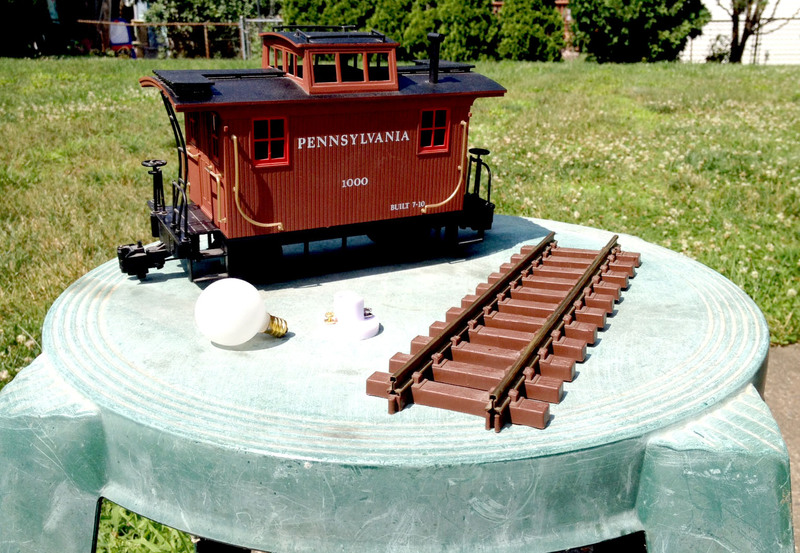 His train-collecting friend loved it so much that my dad made another one from scratch. It was simple to make – and we have really thorough, easy-to-follow instructions here. If you have someone in your family that’s difficult to shop for, think about their hobbies, and turn one of their interests into a cool lamp. This is a perfect homemade gift for friends or family members. 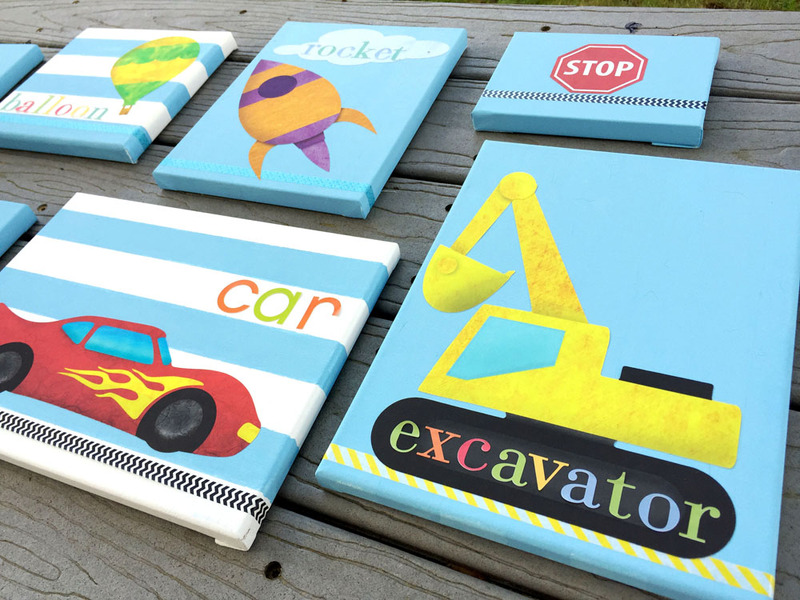 If you are looking for an easy DIY gift that looks store-bought but has creative charm, make these homemade canvases. First, find some cool wall stickers (we love the wall stickers from My Wonderful Walls). Then, paint a few canvases. Let them dry and then apply the stickers. You can also adorn them with washi tape or letter stickers – the possibilities are endless. We have a full tutorial here – along with links to the products we used. With this easy DIY gift, you’ll have beautiful wall art in a matter of minutes. These are great creative Christmas gifts that kids can make for mom or dad – or that gifts that siblings can make for each other. It’s also a great gift idea for craft lovers to make. One thing people love is a thoughtful gift. And, giving homemade gift baskets enables you to be so creative and thoughtful. But I’m not referring to the premade gift baskets that you buy online or from the stores. I’m talking about one that’s hand-picked and made with your recipient in mind. Homemade gift baskets are without a doubt my favorite gifts to give – I love everything from picking out the basket to finding creative gift ideas to put inside. I have so many gift basket ideas on our blog – from an ice cream sundae gift to a cookie decorating gift basket. Heck, I even made a huge list of all types of items to include in themed gift baskets. From “gift baskets for mommas” to “gift baskets for practical people,” check out the full gift basket list here. These are easy and creative DIY Christmas gifts to make, and you’ll definitely find something for every person on your list. As an added bonus, your friends and family will love the thought that you put into this easy DIY gift. It’s a simple homemade gift idea that always goes over well. Who loves photos?! And who would love to not make a million nail holes in their walls?! 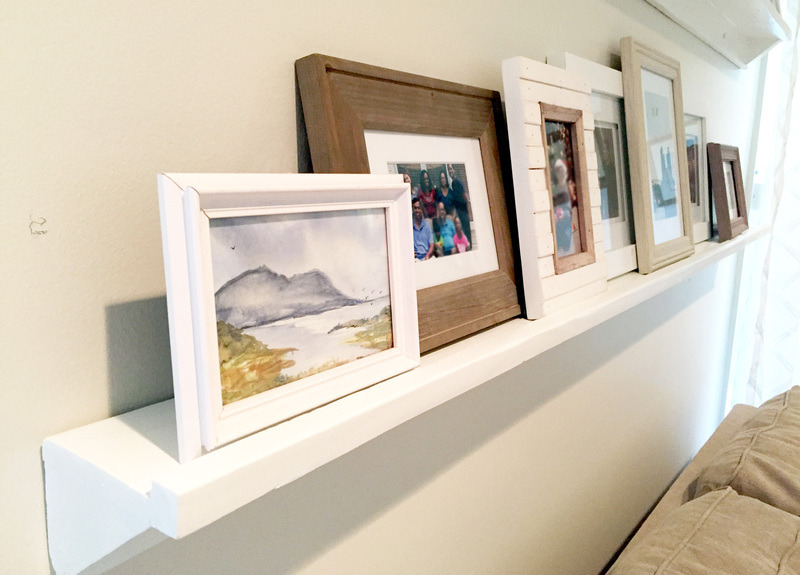 These picture ledges are perfect for those on your list that cherish photographs and would love an easier way to display them. If you have the right tools, they take just an hour to make and they look amazingly elegant. We have the step-by-step instructions here. And, did I mention that the cost was less than $10?! Speaking of those who love photos, we have a gift that we love to give in my family – photo books. But not just any photo book. We love making our books personal by pairing pictures with funny or special sayings. You see, for my mom’s 60th, we made her a book with pictures all throughout her life paired with cliches and common sayings she frequently utters. 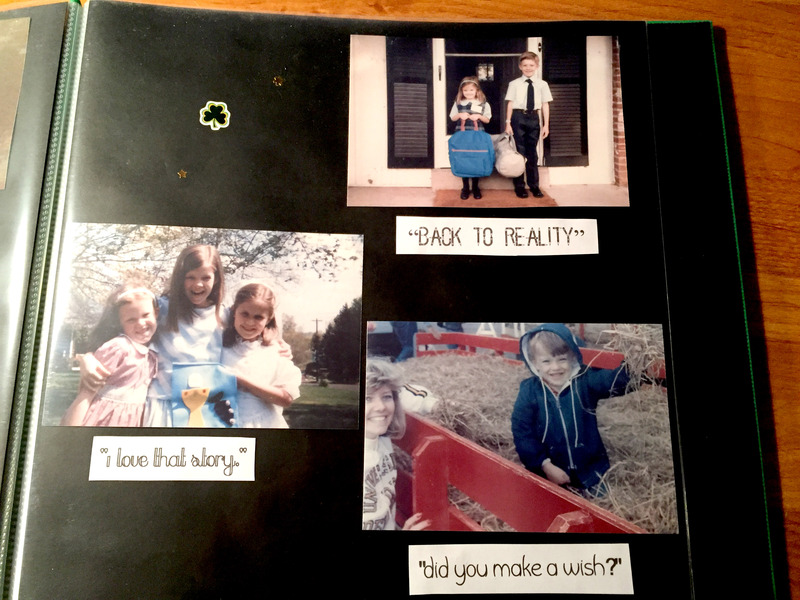 For my sister’s 30th, we made a book of pictures from her life paired with hilarious Seinfeld quotes (her favorite TV show). And, for my in-laws who have lived in a few different countries, we paired pictures from their life with sayings from those countries. To see these books, check them out here. You can make these books scrapbook style (pictured below), or you can make them with a photo site, such as Walgreens. We’ve done both, and they both turn out awesome. I can’t even express how much our friends and family have loved these books. The extra thought has made the books something they cherish. Not to mention photo books are extremely reasonably priced, and they are one of the easiest DIY gifts to make. 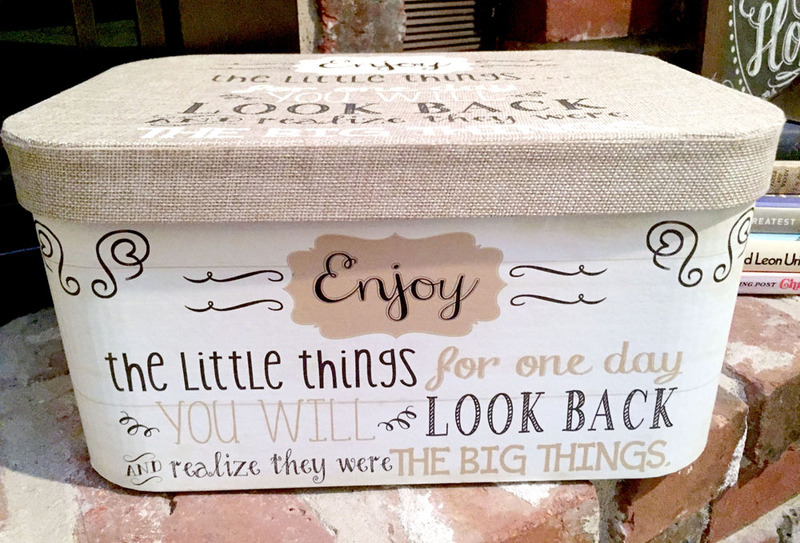 Using sayings or quotations makes it a creative gift too – that’s always so appreciated. These easy homemade gifts are perfect gifts for parents, grandparents, and significant others. 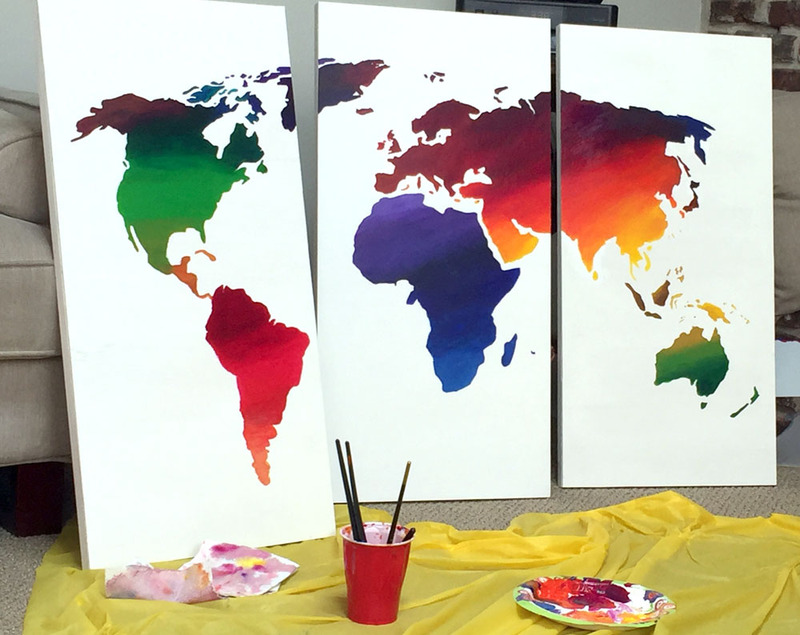 This gorgeous world map was DIYed with just a wood canvas, a stencil, and acrylic paint. Just choose a stencil and you can make a pretty piece just like this one. It’s a really thrift gift because something like this would cost a pretty penny in the stores. 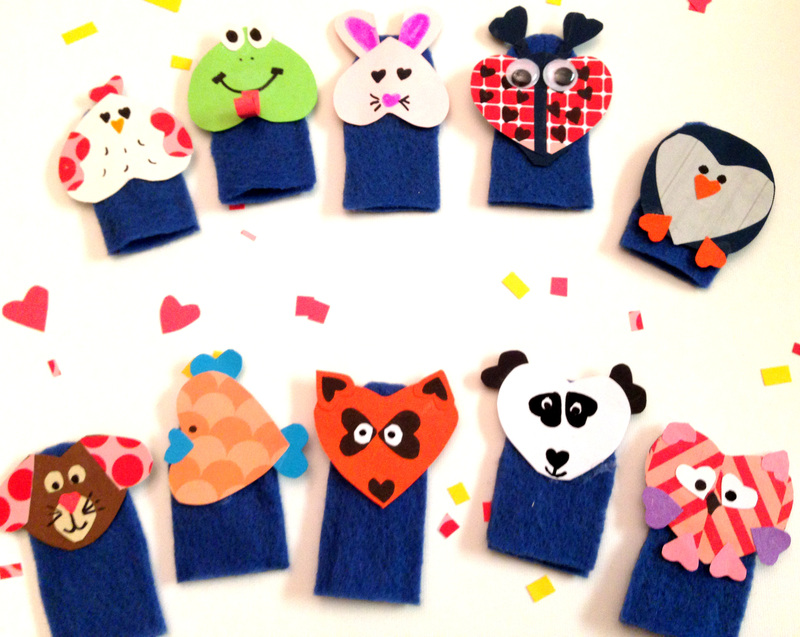 If you’re searching for an easy DIY gift for kids, these super cute, no-sew finger puppets are made from card stock and felt. My toddler has a blast playing with these. He loves singing the Finger Family Song, so these finger puppets certainly made his day. You only need a few materials – including a hot glue gun, and in less than an hour, you can churn out these cute little finger puppets for the little ones that you love. These are perfect for a homemade gift for kids, or they make for a great gift that kids could make too! They are simply one of the easiest and most creative DIY Christmas gifts to give. 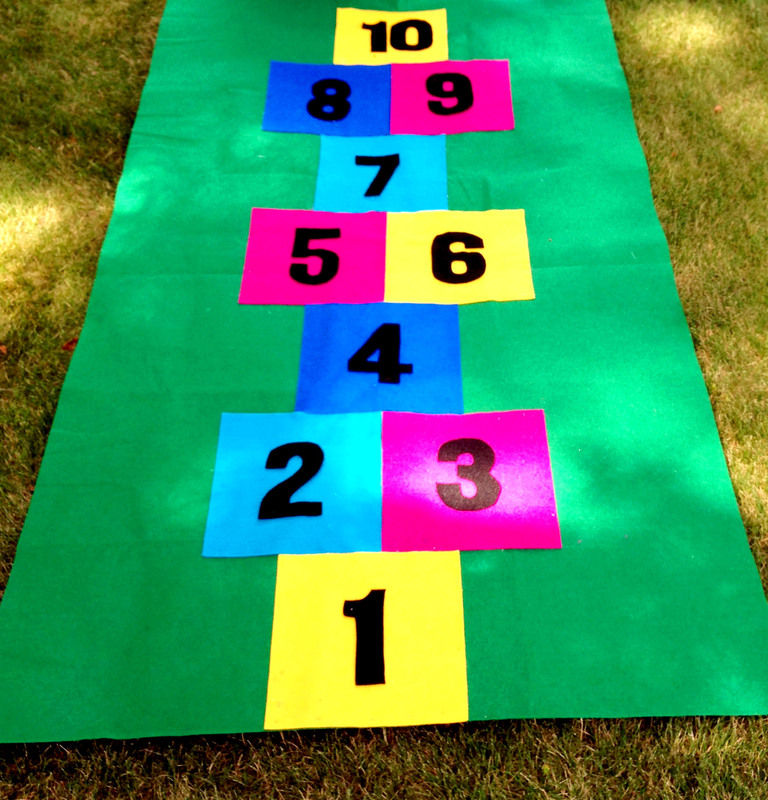 This diy hopscotch mat is simply adorable and so easy to make. It’s a perfect creative DIY Christmas gift for kids. It’s another felt, no-sew project that you can complete in an hour. The mat is perfect for indoor or outdoor hopscotch as well as the perfect reading mat for kids. I even have free printable letters for you to download – to make the tracing easy. This easy DIY gift idea is perfect for kids – or it’s so simple that kids could help make it for others too! These 8 creative DIY Christmas gifts certainly are very simple to make and in my experience are always so appreciated! They are definitely some of my favorite gifts to make. With these easy homemade gift ideas, you can make someone’s day with the extra thought and creativity you put into their gift this year. Not to mention, you can definitely stay on budget by saving with these thrifty ideas that make for easy DIY gifts. Woodworking certainly is a handy skill. From small trinkets to custom cabinets, the things you can create are truly endless. 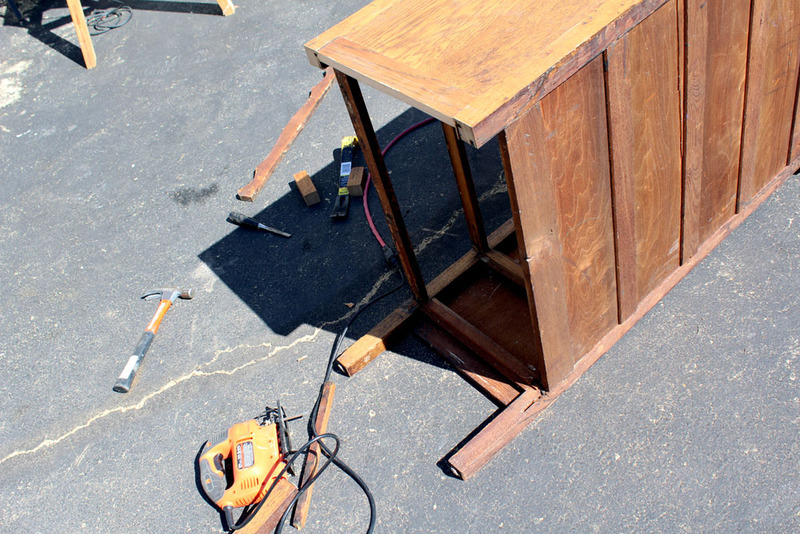 But did you know that you can build your own furniture? Creating your own furniture, especially with little to no related experience, can seem like a large undertaking. 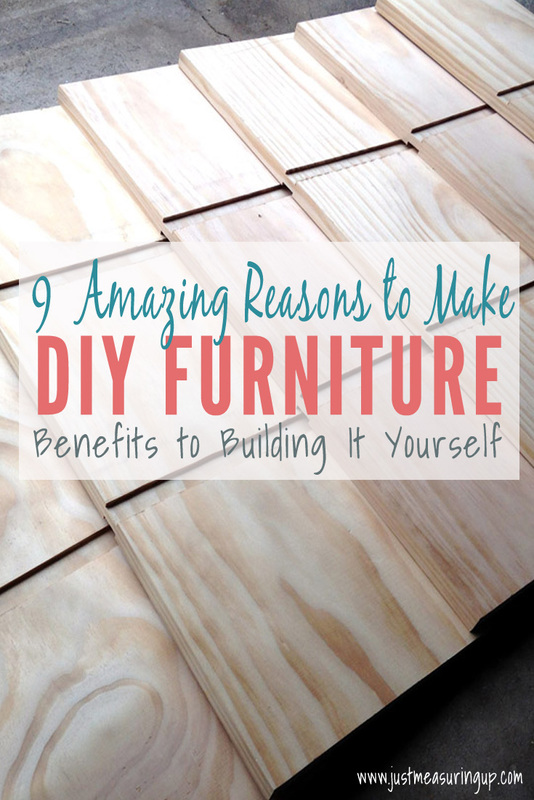 The truth is, while it can be difficult, depending on your skills and what it is you are building, making your own DIY furniture has many benefits over buying from the store. You’re sifting through catalogs of furniture, unable to find exactly what you want. If only you could combine this feature with that feature, you’d have your dream piece. Rather than settle for something close to what you had in mind, build the furniture yourself. Nothing will ever match the exact look or functionality you were hoping for. Not only that, but nobody has a better idea of what you need than you. The advantage of custom furniture is that you can make it look, work, and feel exactly how you need it to. Build your own furniture and enjoy your customized creation. Do you know how to use a saw? Are you handy with a can of paint primer? You’re going to be. Part of making your own furniture is the learning experience and gaining practical skills. Even if you aren’t Bob Vila, you can build beautiful, sturdy furniture as well as anyone. You’ll be so impressed with the experience you’ll gain, and you’ll soon be a furniture-making pro. If you ever run into a rough patch, you can look up tips and tricks online, just as easily as you’re reading this article. When you build your own furniture, you’ll get plenty of experience and the Internet is great at walking you through it. If you’ve ever bought pre-made furniture, then you likely know that it isn’t what you’d consider pre-made, most of the time. Spending hours assembling a simple bookshelf, studying instructions that seem to be written in a different language, only to find the screws are too short or the holes don’t match up. If you find yourself thinking, “I could’ve built this myself by now,” you’re probably right. Yet if you make your own DIY furniture, you can put that time and effort into creating something that you love, rather than following someone else’s “premade” instructions. 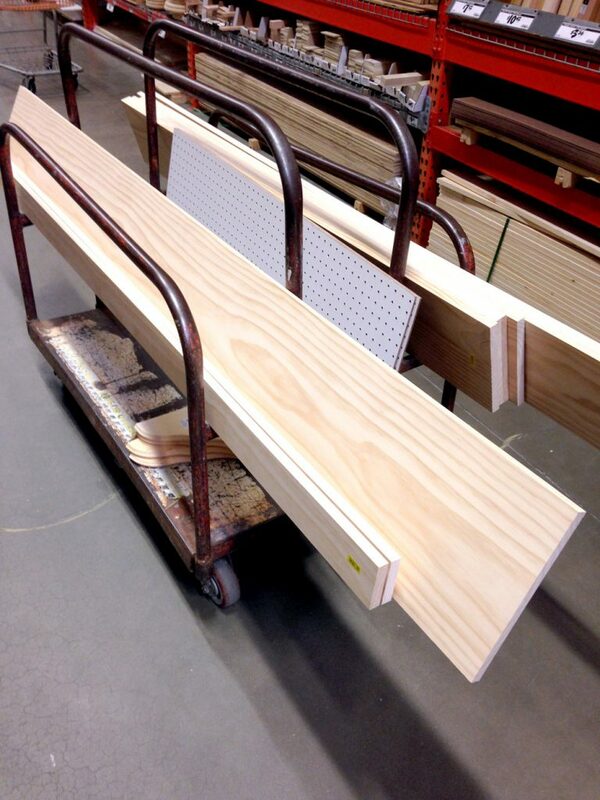 Below is picture of DIY drawers and drawer handles for a rolling workbench. If you ever make a mistake, or your furniture gets old, damaged, or worn-out, the advantage of DIY furniture is that you know how to replace a part or which color to re-finish it, because you’re the one who did it the first time. You won’t have to guess what part number from which company was used, or whether or not they finished the wood with lacquer number 59 or 67. When making your own furniture, you get to make these decisions when building, and then you can benefit from them later on. 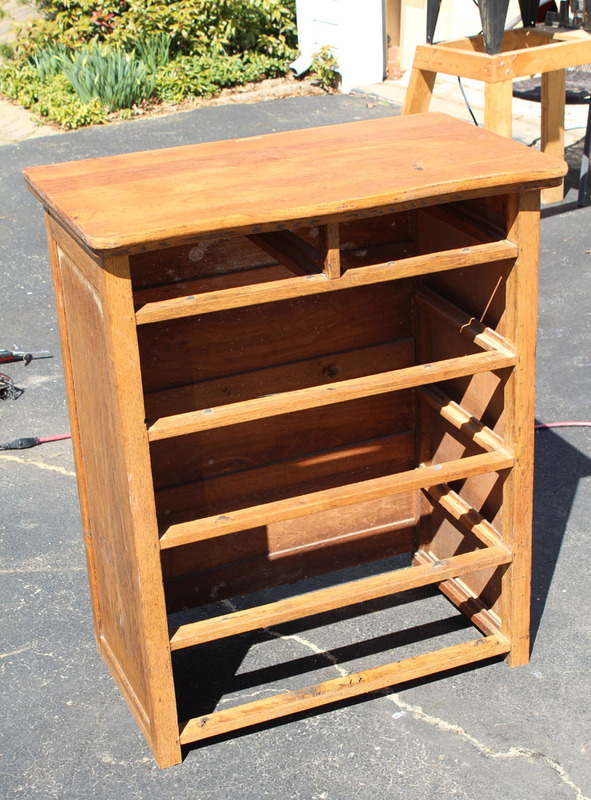 Your homemade desk, chair, cabinet, or anything else, can be used and restored indefinitely. This is such an advantage when you build your own DIY furniture. If you’ve ever been to discount furniture stores, you probably have felt that much of their furniture, especially in the “reasonably priced” section, feels like you could crack it by leaning on it. Those vinyl covered hunks of particle board are designed to be mass-produced and appear nice, but not for very long. Soon, the glue starts peeling, the thin cardboard paneling loosens, and the screws start pulling out under the weight of the furniture. When you build your own furniture, you decide what type of material to use. In most cases of making your own furniture, real lumber is the way to go, which will certainly be much more durable than anything a retail store can provide you with. You did it – you finally found a perfect chair. It’s strong, sturdy, the perfect shade of walnut, and has smooth corners, exactly like you wanted. But then you look at the price tag, and you remember why you considered building your own. Depending on the type of piece you need, where it’s going to be placed, and what materials you prefer to use, building your own furniture could be free or expensive. Yet with most furniture, you can buy the wood and materials you need in good condition for significantly less than you would if you bought a premade item. The additional costs would be the tools you need, assuming you don’t have them. 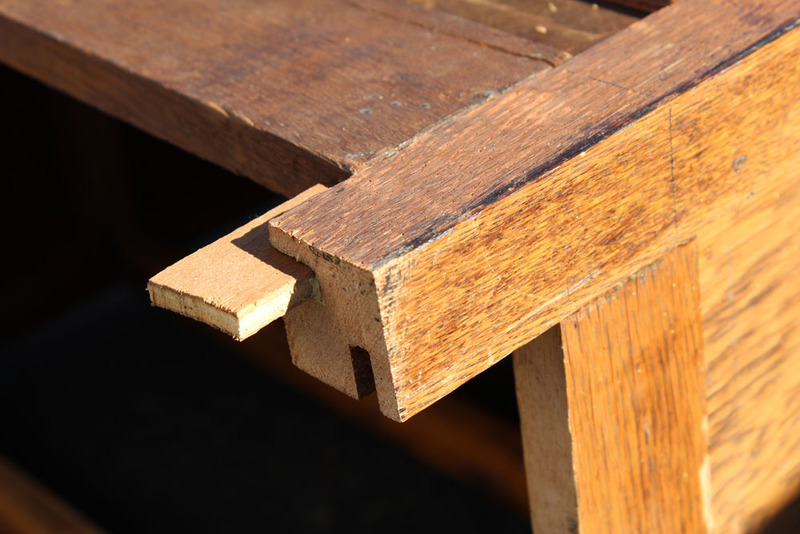 You can also upcycle materials and use scrap wood, which definitely creates savings when making your own furniture. 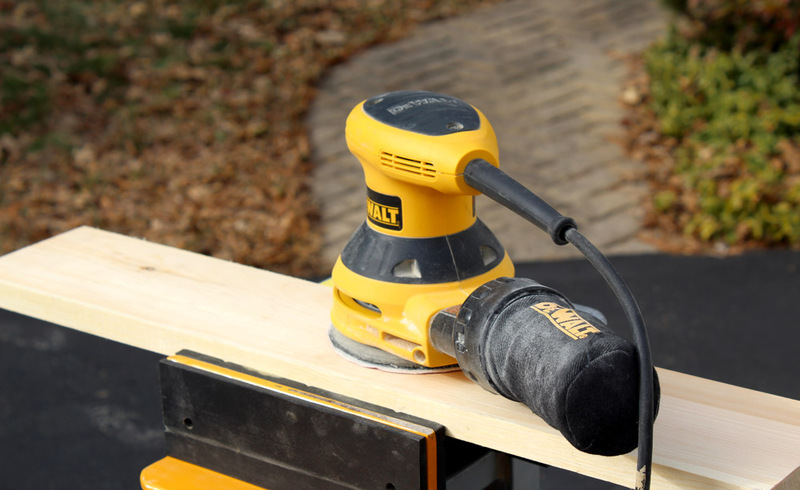 Additionally, discount tool stores often have great deals on saws, hammers, drills, and any other tools you may need. Not to mention, these are one-time expenses, since you can continue using them when you are making your own furniture in future projects. Once you finally build your new chair, you can stick it right in the middle of your living room and show it off to friends and family. Let them know the work you put into it. Your friends will be oogling at your talent. The bragging is even sweeter if it’s such a nice piece that they don’t believe you built it at first. When you start building your own furniture, you’ll not only impress yourself, but your friends too. You don’t have to undertake this project alone. If you have kids, this could be a great way to introduce them to learning about hard, careful work, as well as teaching safety. Or, if you can get a friend who wants a fun weekend project, order some pizzas, play some good tunes, and spend a constructive day with your pals, instead of sitting in front of a TV all day. Making your own furniture is definitely good bonding time, and you get to share the experience with someone else when you build your own furniture. 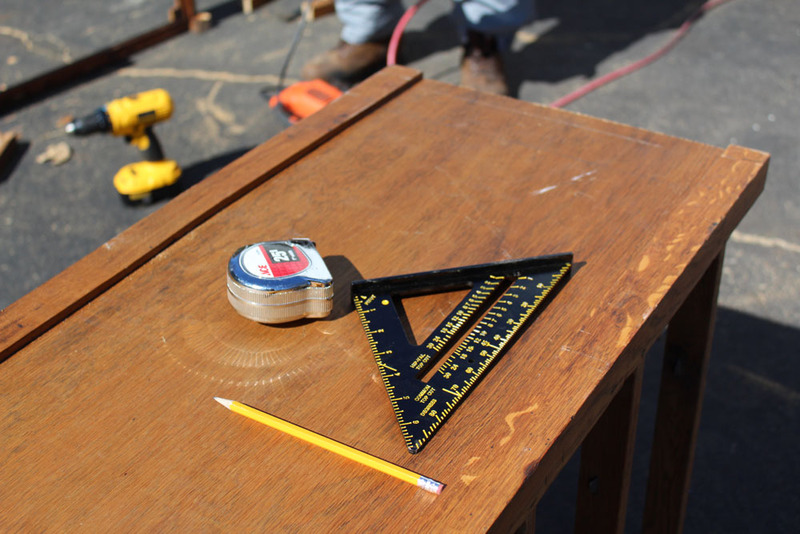 Aside from simply the experience of building your own furniture, a task like this allows you to retain knowledge that can be applied to over fields. 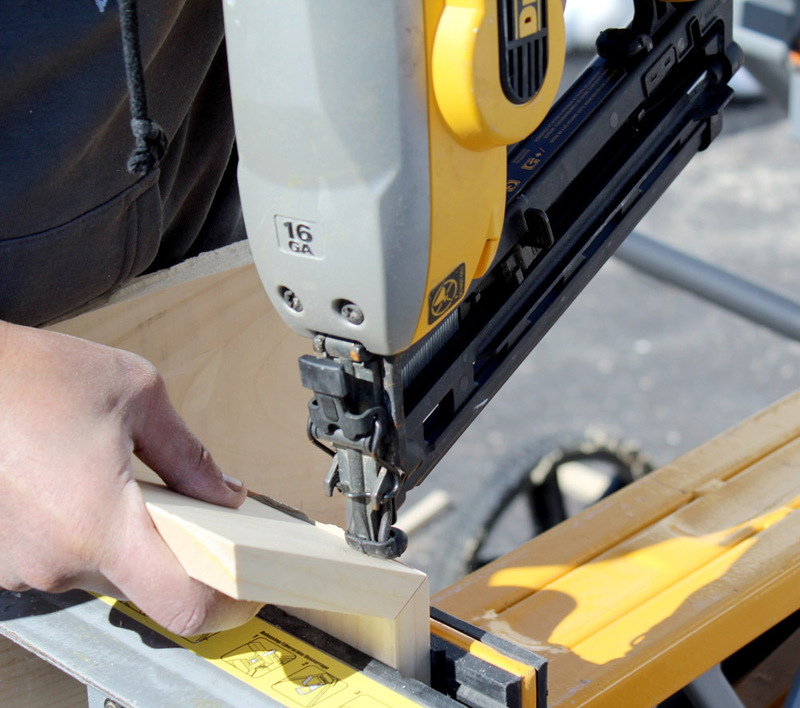 You’ll have a better understanding of construction and building processes when making your own furniture. If your wall gets scuffed, you already know the process of repainting. If your door frame gets chipped or cracked, you already have the knowledge of sanding, using wood putty, and re-finishing. You friend’s car upholstery starts coming loose and you’re able to help, because you already did it once on your homemade chair. You’ll be handy with saws and power tools from making your own furniture – that’s another set of skills that will come handy in your life. These are skills that build upon each other, and you won’t gain them until you start building your own furniture. From bragging rights to affordability to customized creations, there are definite perks of building your own furniture. Next time you’re stuck assembling something that doesn’t seem to go together or looking through catalogs for the perfect piece, definitely consider making your own furniture. Paul is an avid woodworker and the editor-in-chief of the website Woodworkboss.com. 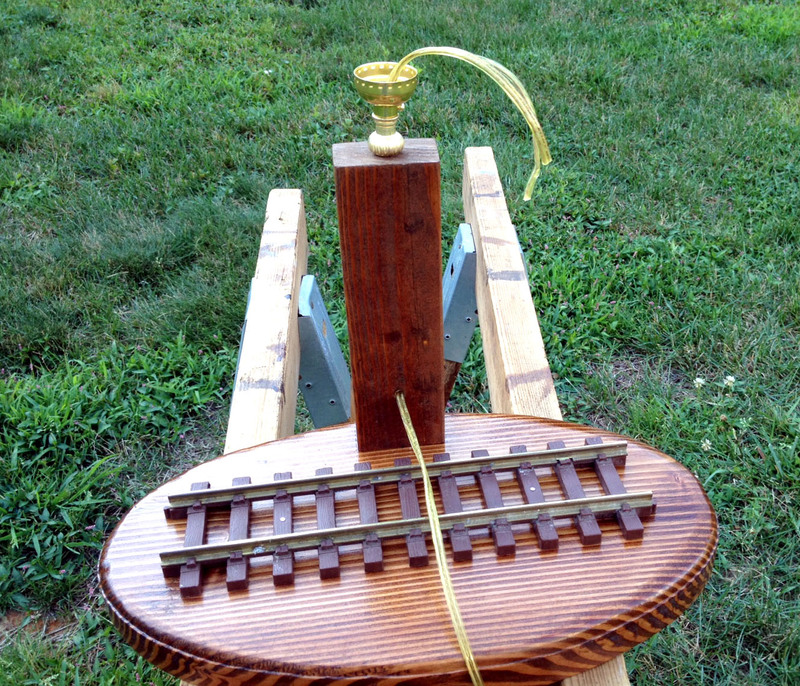 Via his site, he hopes to inspire fellow woodworking enthusiasts while sharing tips and ideas for woodworkers who are starting their crafting journey. 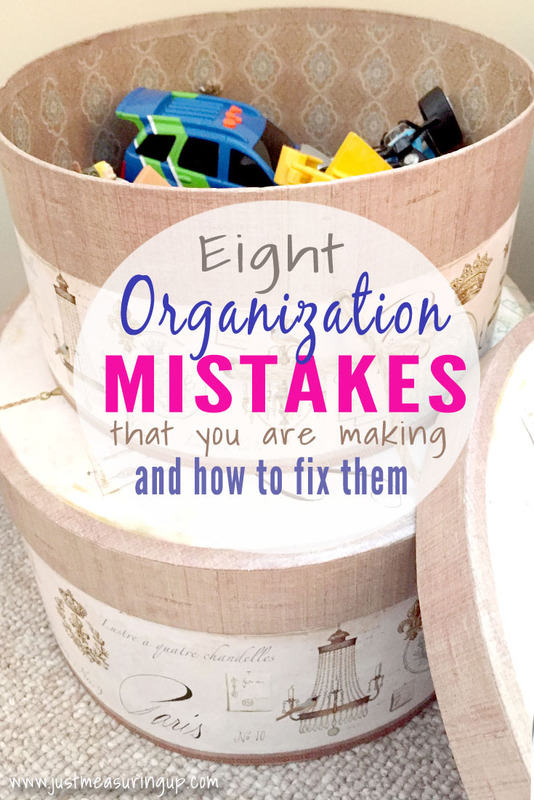 8 Organization Mistakes You’re Making (and How to Fix Them) Post Preview: Tired of coming home to a disorganized house? Check out these DIY organization tips and ideas for the home, and you’ll have an organized home in no time. Ideas such as wire closet racks, cubby storage, wall storage, kids storage and more are discussed. With my eyes half open, I sluggishly got out of bed. Making my way across the room, I lost my balance on a toy car that wasn’t put away. After a loud sigh, I scooped it up along with a few other toys and dumped them in the corner. I head to the closet to grab a towel, where I am greeted by a completely disheveled mountain of linens. Room after room, the story was the same. The closets were overflowing, toys were strewn, nothing seemed to have a place. Truth is, if I didn’t start using my space wisely, my home “organization” would remain a mess. In order to keep my sanity, I had to figure out what I was doing wrong. The following home organization tips will help you add some DIY organization to your home. From using closet space wisely to utilizing wall space, these simple home organization ideas will help you bring more order and less chaos into your home. Closet space is gold. I mean, it’s storage space hidden behind closed doors. Because it’s out of sight, it usually becomes embarrassingly sloppy. In our current home, all of our closets contained only a clothes rod and a top shelf. So as you can imagine, each of these closets became a disaster in a matter of weeks. In our previous home, we had wall-mounted wire shelving configurations in each closet, so everything was much more organized with wire shelving that already existed. 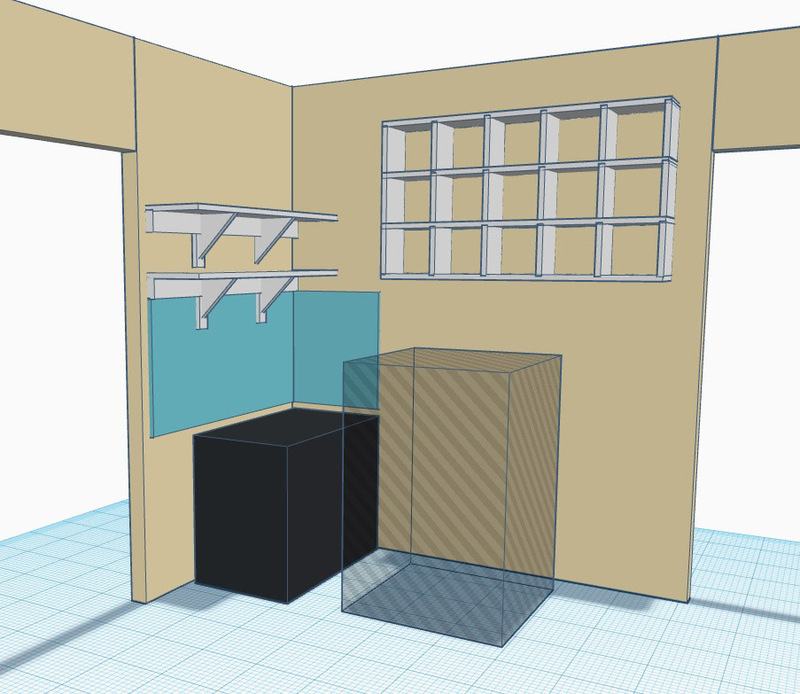 However, custom shelving configurations for closets can be really expensive. So to save money, we simply installed a few standalone wire shelving racks for our closet shelving. Rather than have piles of items shoved into the closet (I had so many of those huge storage bins stacked up), you can neatly slide storage bins, laundry baskets, or other containers on and off the wire shelves. The wiring shelving was especially helpful in coat closets and kids rooms, where that single clothes rod isn’t always the best use of space. The closet shelving gave us extra space, and I can easily find everything. Installing some of these standalone wire shelving is definitely one of the best DIY organization ideas for your home. Another home organization idea is to install double top shelves in your closets. Rather than have one shelf running across the top, add another one above it. This is an easy change that doubles your shelving instantly, using more of that high space wisely. If you use wire shelving, it’s easy to install another top shelf. Speaking of wasted space, I then took a look at our closets to see where else I could utilize otherwise wasted space. To add more home organization, I hung small racks on side walls and hooks on standalone doors. These diy home organization ideas for your closet space will have you using every inch wisely, making more space for all of your things. Install an extra top shelf in your closet and double your space. Closet shelving sets can be really expensive, so rather than buy a hundred dollar kit, just buy a few wire shelving racks that are right size for your closet and attach them to the wall. I found a few wire shelves at a flea market for a couple bucks (you could also check out your local Habitat for Humanity Restore). If you can’t find some cheap wire shelves, home improvement stores have the racks for about $10-$15 plus the hardware, which isn’t too bad for quick, cheap organization. If you don’t want to spend but have extra wood laying around, you can install a few wooden shelves instead of the wire shelves. Paint them white and they’ll blend right in, creating a more uniform and organized look for your closet shelving. Also, look around for anything you can repurpose into closet shelving. Every time I’m ready to kick something to the curb, the wheels in my husband’s head start turning. His most recent trash-night-intercept was a CD tower that he installed in our pantry as extra side shelving. By making great use of closet space, you can really up your home organization game. You’ll get more into your closets, which means less laying around the house. With these DIY organization tips, everything in your closet will have a space. Closets overstuffed? Attic full? Start using the walls! Wall space is one of the best space-saving secrets and my absolute favorite of the DIY home organization ideas. 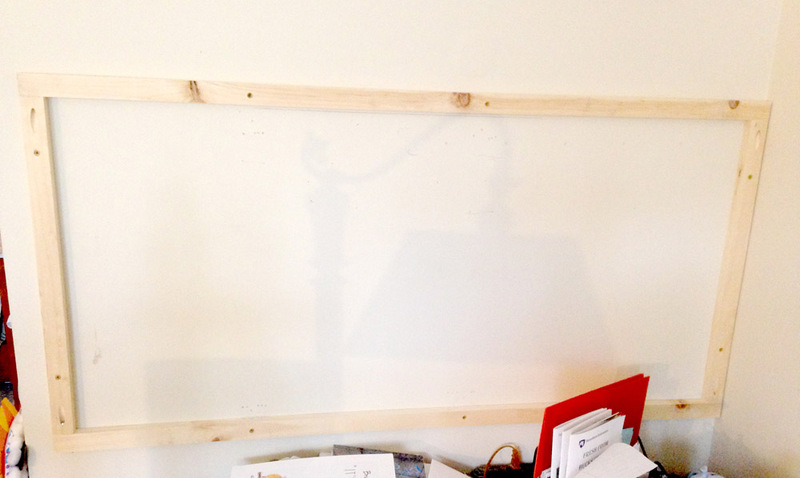 My husband recently mounted a huge shelf to the wall behind my desk. What once was an empty wall is now housing all of my desk and craft supplies! Corner wall space is the perfect spot to put up some floating shelves or even cubby shelves. You can fill the shelves with baskets and bins of anything – craft supplies, shoes, extra towels, toiletries, accessories, bows, kids clothes, etc. If you have a little extra floor space – maybe in a basement or garage, you could use it for a vertical storage tower. We did this in our garage with a space about 6 feet wide and 3 feet deep, and gained tons of storage space. The storage tower holds all of our Christmas decorations (and I have 3 trees! ), Ash’s oversized tools, and more. 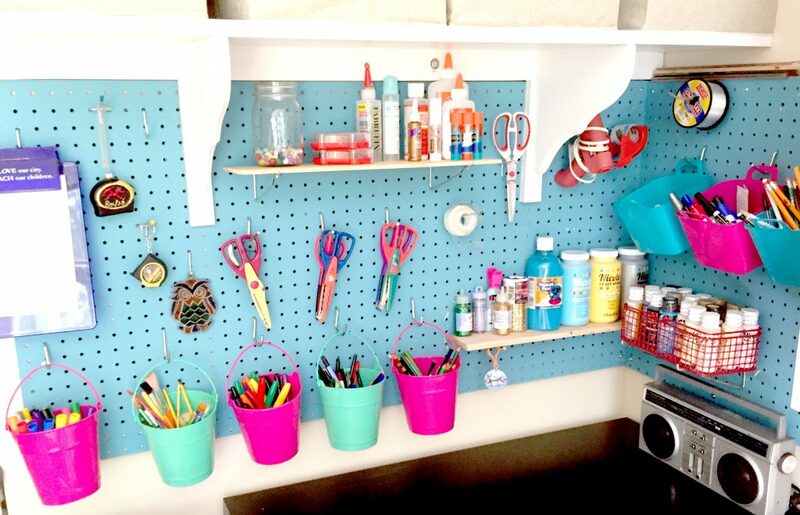 So, take it from us – look for areas that you could turn into a little extra wall storage and you will be thrilled with the DIY organization that space provides. There are tons of great shelves that can easily be mounted to your walls for vertical storage. This iron pipe shelf holds a ton of items and looks amazing. I also just adore farmhouse floating shelves. Aren’t they charming?! I love the finish on these shelves, and farmhouse style shelving looks amazing in any home. If you make your own shelves, you can choose your exact measurements, which is beneficial because then you can customize them to fit exactly what you need. We built two basic shelves for my office and made the measurements to fit four fabric storage bins on each shelf. With two shelves, that’s 8 storage bins that are organized and filled. And instead of taking of space elsewhere, they are on the wall! The shelves were simple to make and mount, and we have free plans available. Using wall space is definitely one of the best DIY organization tips I can give you. It has created so much space, where we thought we had none. When thinking about ideas for organization, don’t forget to look on your walls. 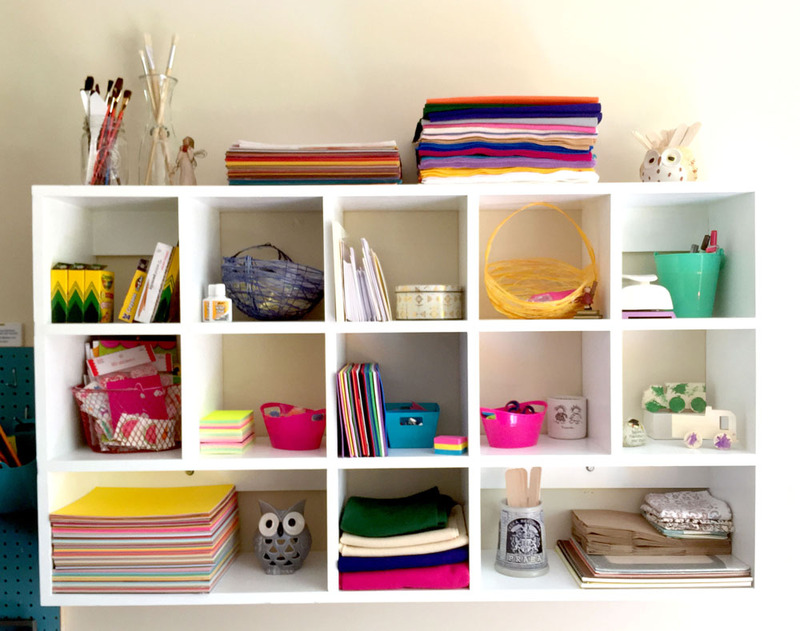 Cubby storage is an organizational gem. 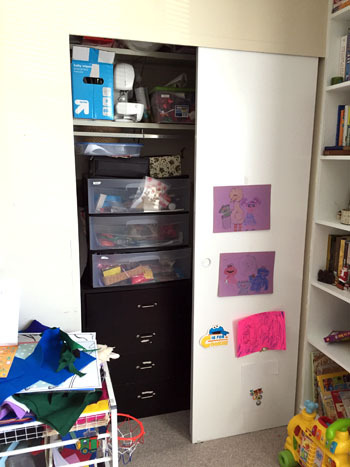 The individual cubbies keep items super organized and in plain sight. You don’t have to dig through drawers, toy bins, or storage bins to find what you are looking for. Everything is compartmentalized in neat little spaces using cubby shelves. Cubby shelves also make for for the perfect bookshelf (no more books sliding around). Cubby storage is an excellent use of corner or closet space and is perfect for organizing toys, crafts, or office supplies. 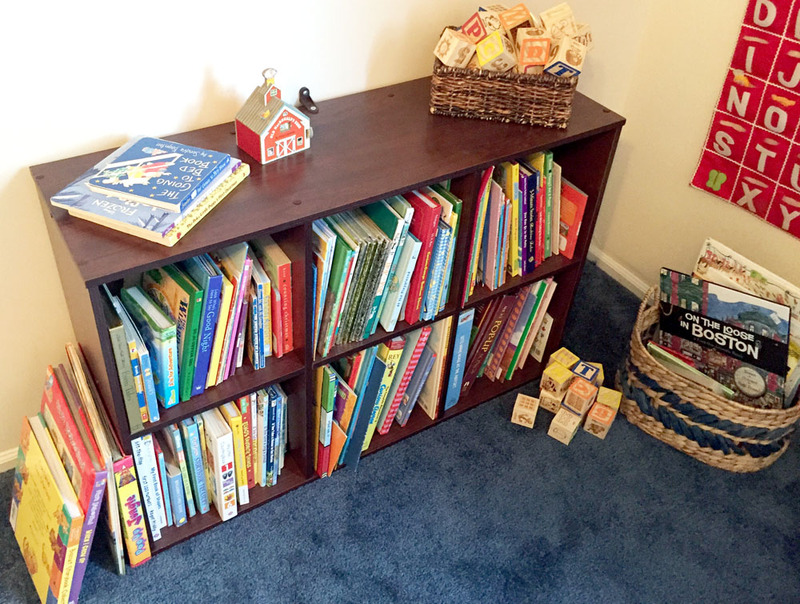 Cubby shelves are inexpensive and make for the perfect bookshelf. Yet one of the best parts about cubby shelving is that you can stack your items in the cubbies, or you can also use storage bins in some or all of the cubbies. Cubby storage is also very versatile, as you can arrange them in many ways – vertically, horizontally, stacked, or even hang them on your wall. We love these cubby shelves from Amazon – they have quite a few finishes and are really nice. We use cubby storage in our kids’ rooms for bookshelves along with the playroom for toy storage and organization. As far as storage bins, the dollar store is carrying storage bins now as well as lots of other useful containers. You can’t beat that for cheap storage. You can also get some good deals on storage during back-to-school sales. If you don’t feel like running to the store, Amazon has lots of cute storage bins too. Although buying cubby shelves is probably cheaper than making them, Ash made me customized cubby storage for organizing all my craft supplies. But here’s the best part – he mounted the cubby shelves to the wall, which frees up ground space AND uses otherwise lost wall space. 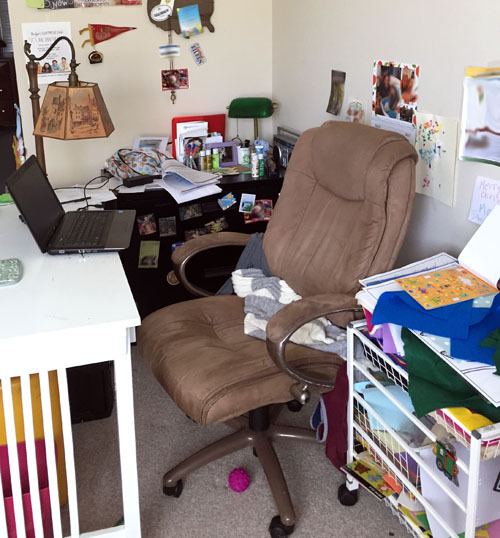 I was able to empty my entire desk out with cubby storage! No more digging through my desk or my filing cabinet or those huge storage containers that were in my closet. Each little cubby holds something different, and I just need to spin my desk chair around to find what I’m looking for. 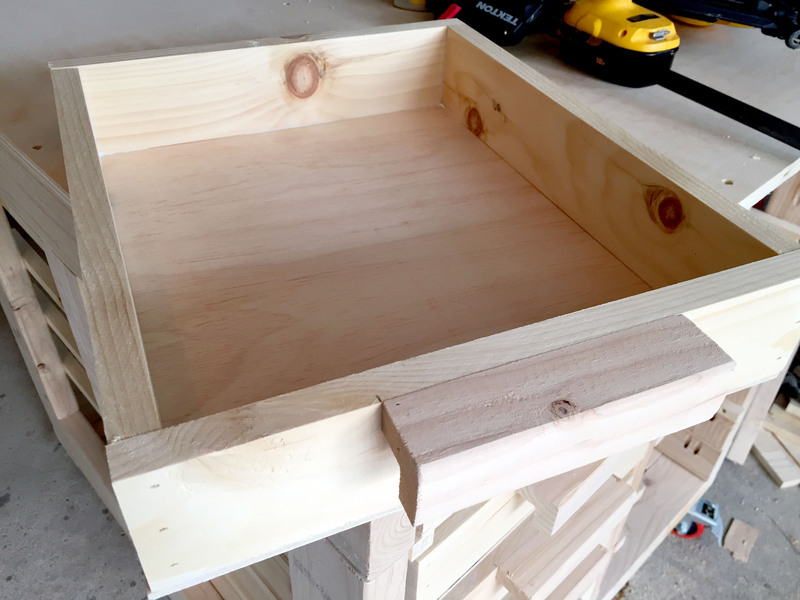 As far as storage bins, you can also make your own. I made several DIY storage bins for our changing table and coat closets (holding mittens, hats, scarves, etc) from cardboard boxes, contact paper, and knobs. When thinking about how to have more home organization, think about where you could add cubby storage. They don’t take up too much, aren’t too expensive, and they add a lot of DIY organization. You know that feeling you get at the end of the day when your house is nice and organized – there aren’t toys everywhere, the pillows are back where they belong, and everything is in its place. It just looks so perfect. Unfortunately, this usually isn’t the case. However, if you create a spot for everything, you can hide some of those eyesores, keeping your home always looking organized. My favorite trick, especially for toy storage, is to use pretty boxes to hide otherwise ugly things. Our toddler has toys in every single room (literally every room except the master bathroom). The biggest problem area was our family room. I mean, blocks everywhere, tools scattered across the room, puzzle pieces wedged between couch cushions. So, I started buying cute baskets and boxes that were on sale at craft stores. 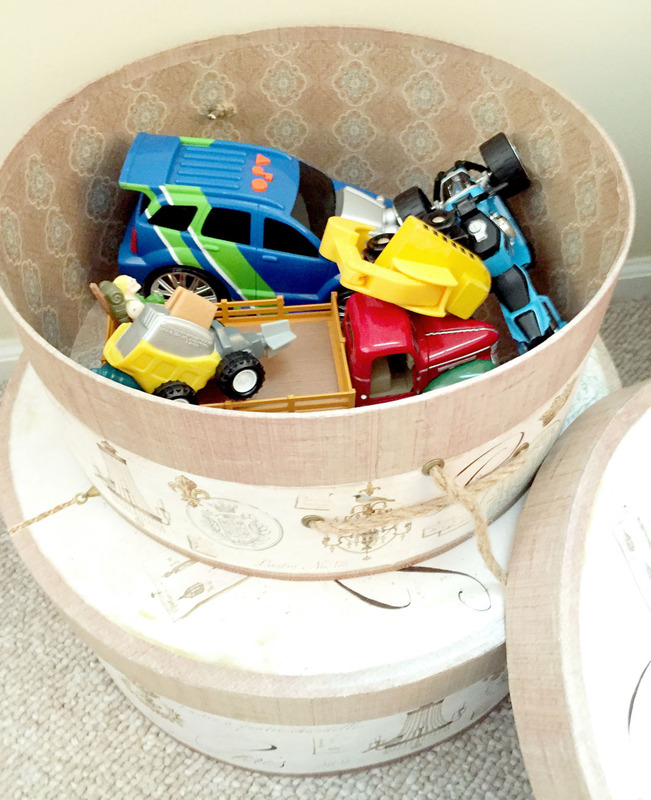 Rather than have tacky storage boxes, I have trendy bins and baskets all around the house. The great thing is that you can’t see the contents of what’s in the bins. So, you would never know that the boxs and bins contain toy storage. Even if your home isn’t filled with toys, take a look around and see what you can hide. Cleaning up some of these things and creating a space for them definitely makes for a more organized home. You’d never know this box houses the entire Mr. Potato Family 🙂 How’s that for toy storage?! You can get baskets and boxes super cheap at Michael’s when they have end of season sales. I have purchased many of these boxes for just a few dollars at 70% off. Pick things you like to hide those toys or other storage items. I would definitely recommend checking there periodically because I have gotten so many bargains on end-of-season bins and boxes. As far as baskets, AC Moore and Michaels have a great selection and you can either use one of their coupons or catch one of their frequent 40% off sales. 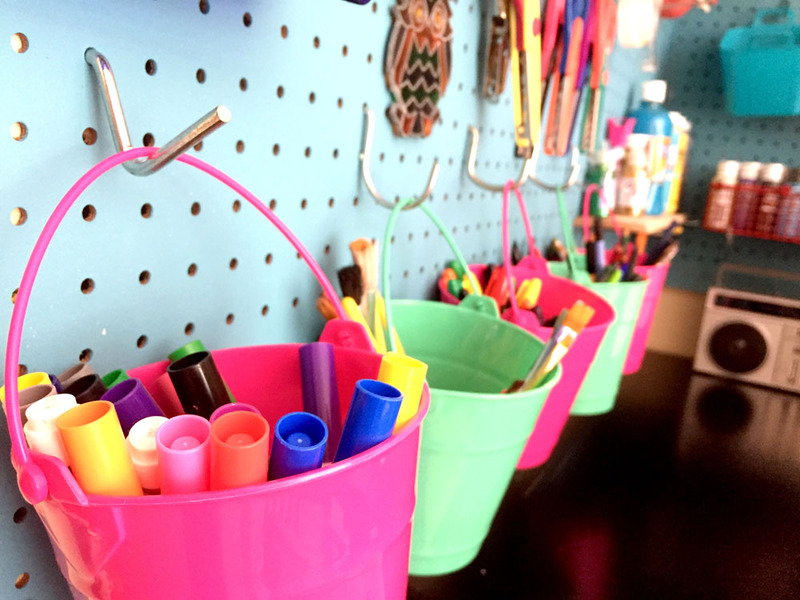 These craft stores offer so much as far as diy home organization ideas. As far as home organizing ideas go, finding a space for everything definitely works wonders. And using pretty boxes to store some of the things that need to be organized is a great home organizing technique. Who doesn’t have a junk drawer in their home… or like five or six of them? I think every drawer in our house became a junk drawer at some point. There’s little I despise more than wasting precious time looking for something. Rather than succumb to disorganized drawers, think what solutions will work for your items. 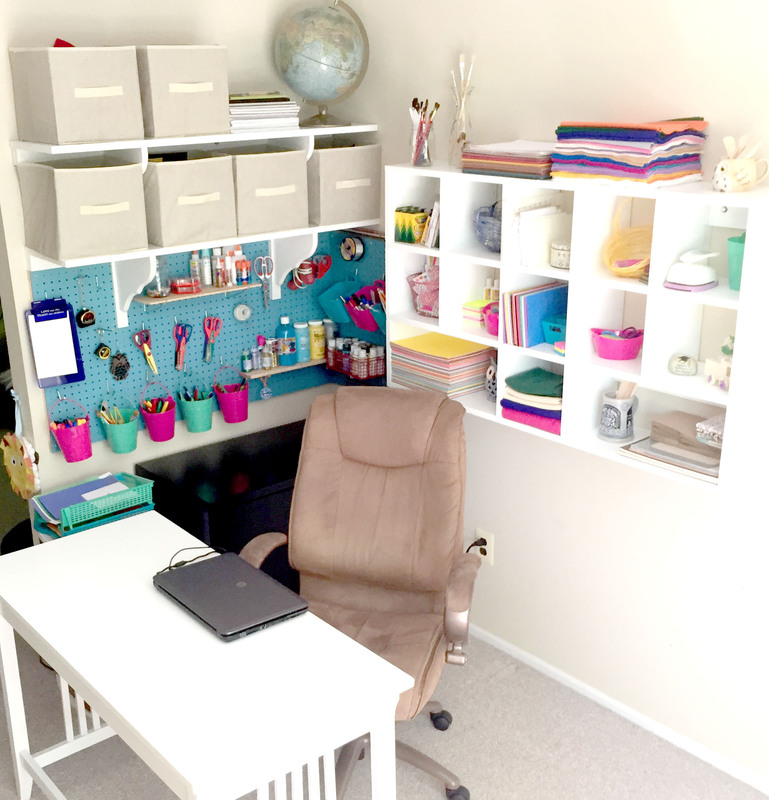 I eliminated my entire desk of office and craft supplies by using cubby shelves and pegboard. 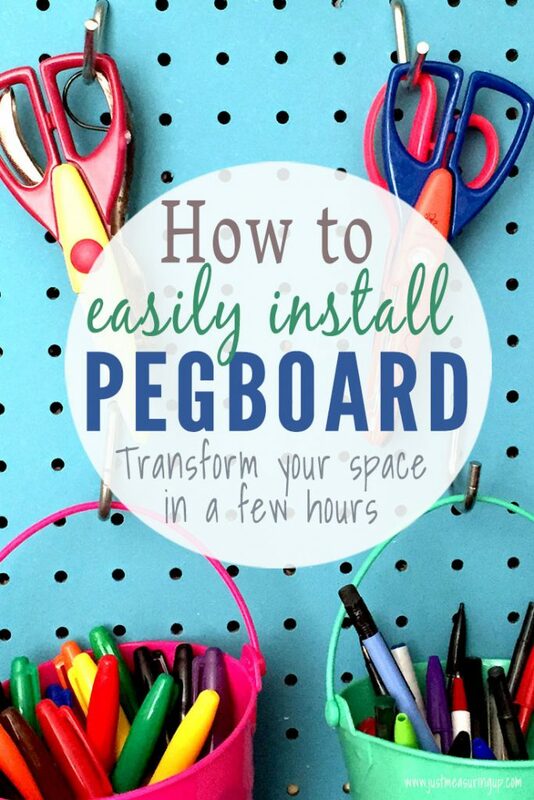 At first, I wasn’t sure I would put things back on the pegboard after I used them. Yet, there’s nowhere else for it go, since I ditched my old desk. 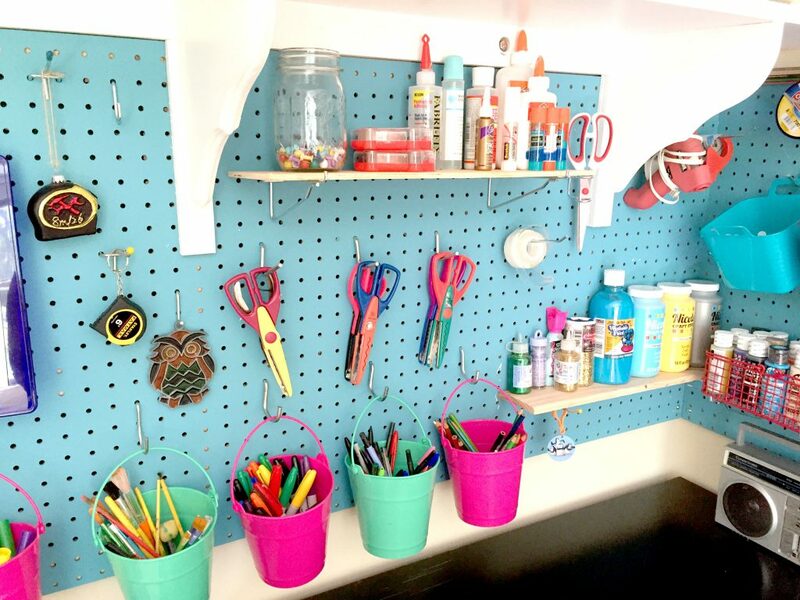 I am loving the pegboard organization – I can clearly see everything I have, and it looks really cool. 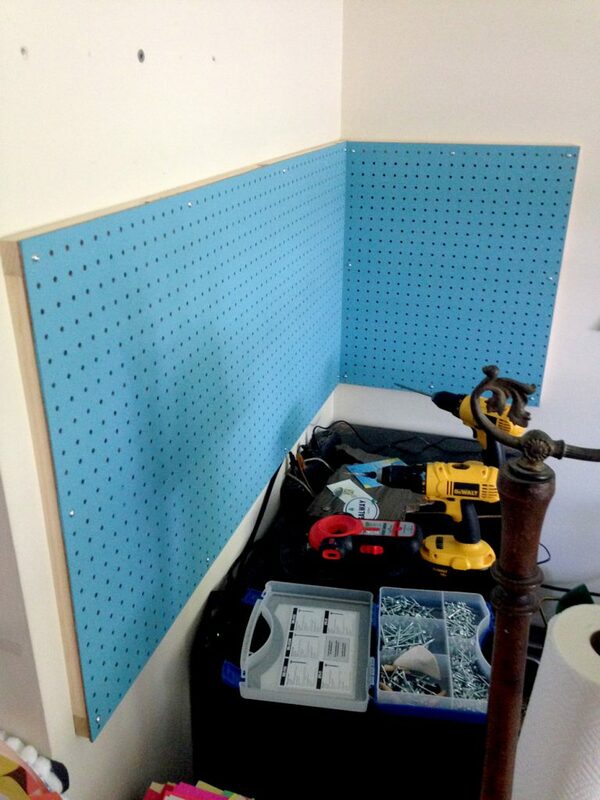 If you don’t have a huge space for a pegboard, it’s no problem. 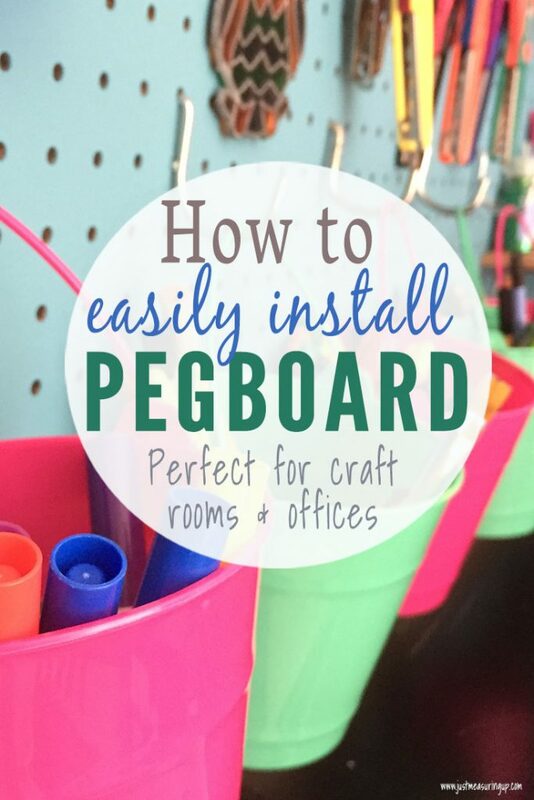 You can use small pieces of pegboard in creative spots, such as on the back of kitchen cabinet doors to hang measuring cups or special utensils. You’ll be surprised just how many messy drawers you can empty with this DIY organization trick. Another idea is to use drawer dividers to separate things. I put these in our kids’ bedroom drawers to separate socks, bibs, accessories, and more. I also organized our kitchen junk drawer with bins. And, as another home organization tip, don’t forget to give your drawers a good ole clean-out, especially those kitchen junk drawers. You don’t need to keep take-out menus because everything is online. Those extra ketchup and soy sauce packets never get used either. Lotion, nail polish, and make-up all get old after a while. So, definitely clean up your drawers a bit as you are organizing, and you will easily gain some coveted space. 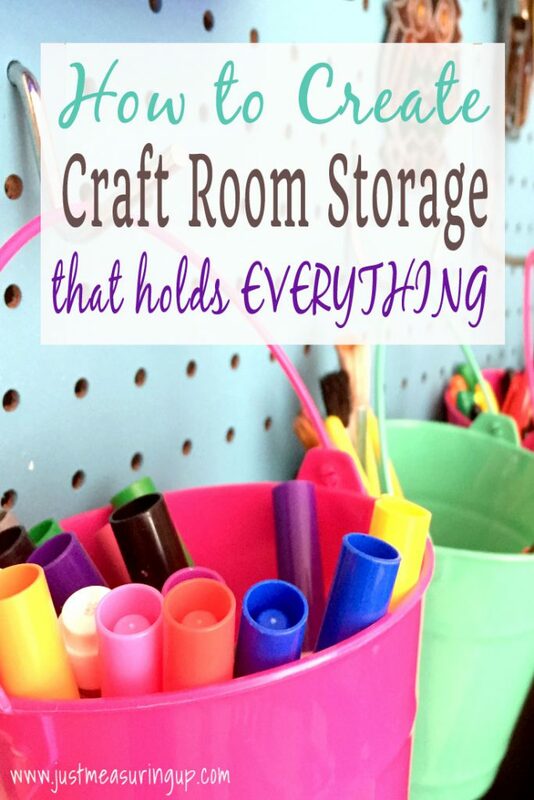 The Dollar Tree and Big Lots are my favorite places to find storage and organization bins, especially around back-to-school time. You’ll find lots of neat little bins and baskets. 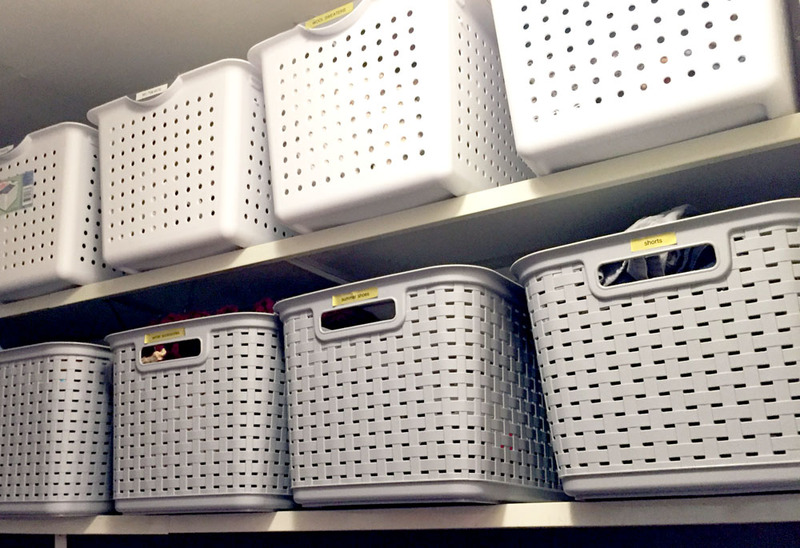 If you like your storage bins to match, buy a few more than you need because it’s hard to find the same bins and baskets again. But overall these stores are great for frugal diy home organization ideas. If you would rather shop online, these interlocking bins are awesome. There’s eight of them, and you can use them individually or interlock them. 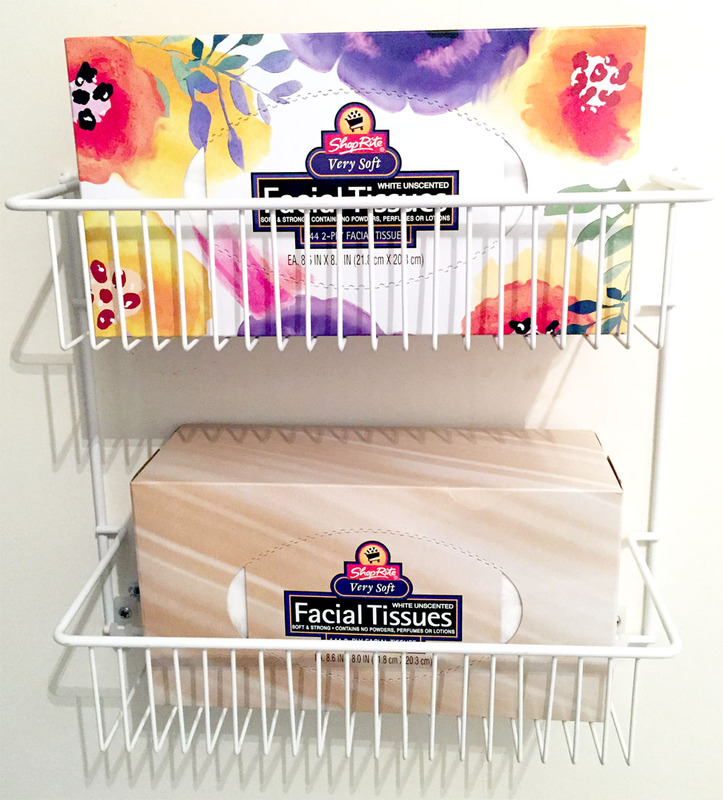 Did you know they make adjustable drawer organizers too?! I love anything that can be easily customized. Last, here’s a great drawer organizing kit for dressers. Look around your house, or your recycling bin, for things you could use as drawer dividers. You could use empty plastic or cardboard bins or boxes, such as shoe boxes or cereal boxes. 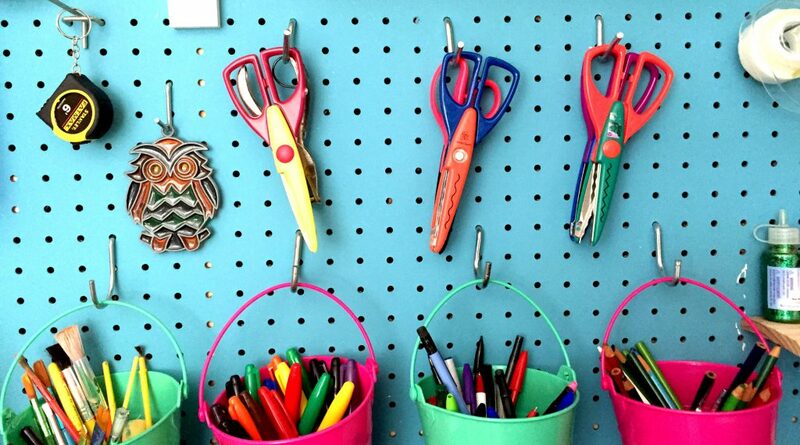 Cut them to size or reshape with some masking tape, and you’ll have yourself free organization. You could even make dividers from cardboard – and spiffy them up with some cute contact paper. This DIY home organization tip shouldn’t be overlooked. Handling those messy drawers will make for a much neater and more organized home. Every time I came home with the kids, I would always drop the diaper bag on the ground. Sometimes it would make its way over to the closet and embarrassingly, sometimes it remained on the ground for a few days. I don’t know why it took me so long to realize the solution was to buy a $2 hook for the mudroom. I can now easily grab the diaper bag when I’m on my way out the door, and it doesn’t drive me crazy on the floor for days. 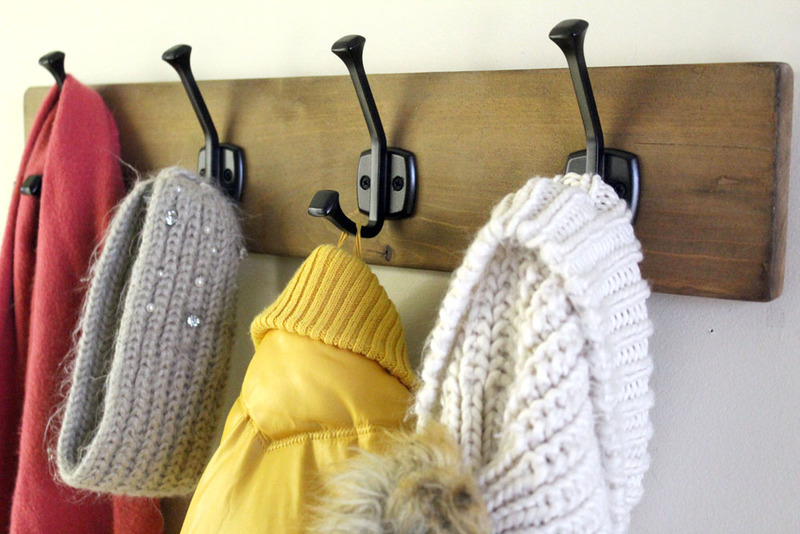 If you always have school bags on the floor, add hooks in your mudroom or entryway for kids to hang their bag up. 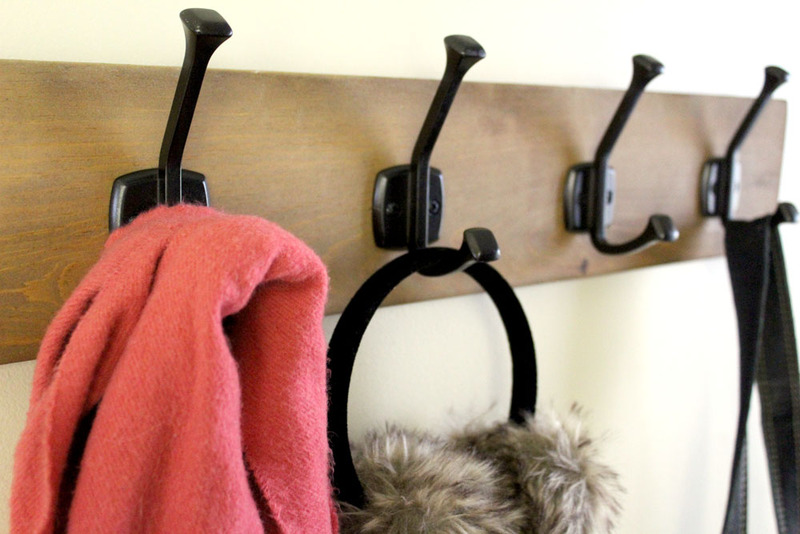 If your kids are always leaving their hoodies around, put some hooks up for them in a hidden spot. Simply find the problem areas, and then think about how you can create a spot for it. 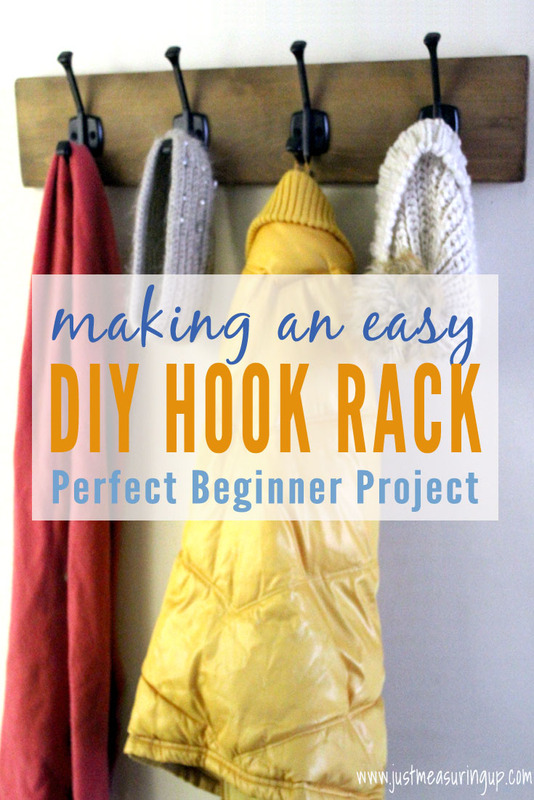 Don’t disregard your doors and little spaces on the walls, where you can easily add a hook or a rack. The back of the closet door is perfect for holding towels – rather than throwing them over a door, having kids leave wet towels on the floor, or cramming them all on the same towel rack. Closet doors are also perfect for little containers, such as spice racks, to hold toiletries. Pantry doors are perfect to add basket storage too. Look around your home and identify what is driving you nuts and then create spots for these things. 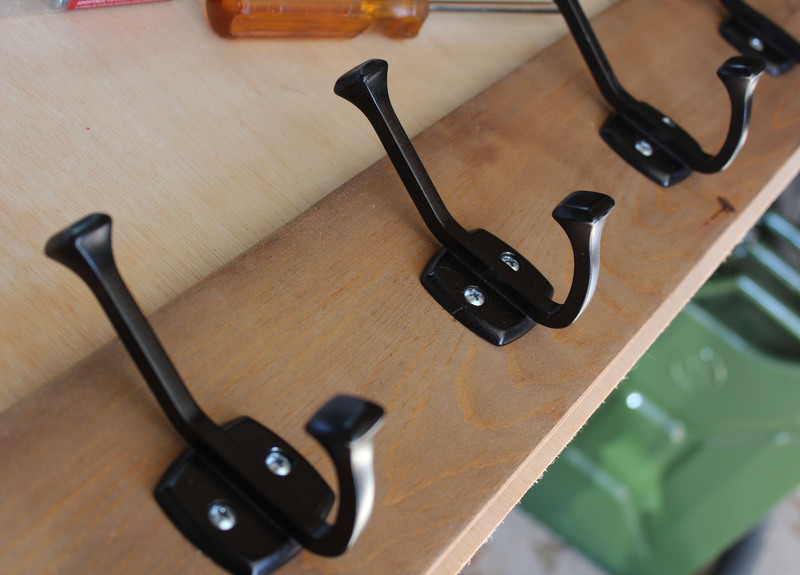 You can buy command hooks to attach easily to walls (no tools involved and easy removal). These provide a solution in just minutes. You could also go for a more classic hook. 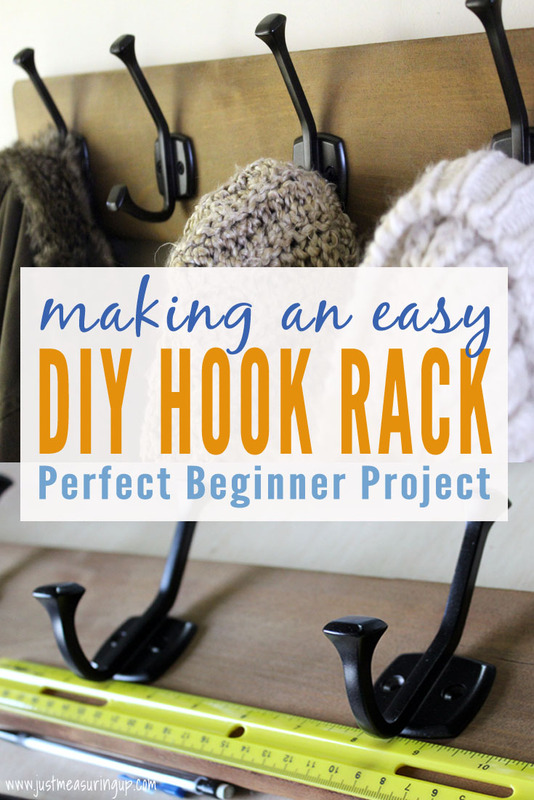 These hooks are very inexpensive and add classy organization. If you are trying to maximize closet door organization, this organization rack is huge and can hold so much! You can even attach it to your door (or wall) with command hooks. It doesn’t get easier than that! 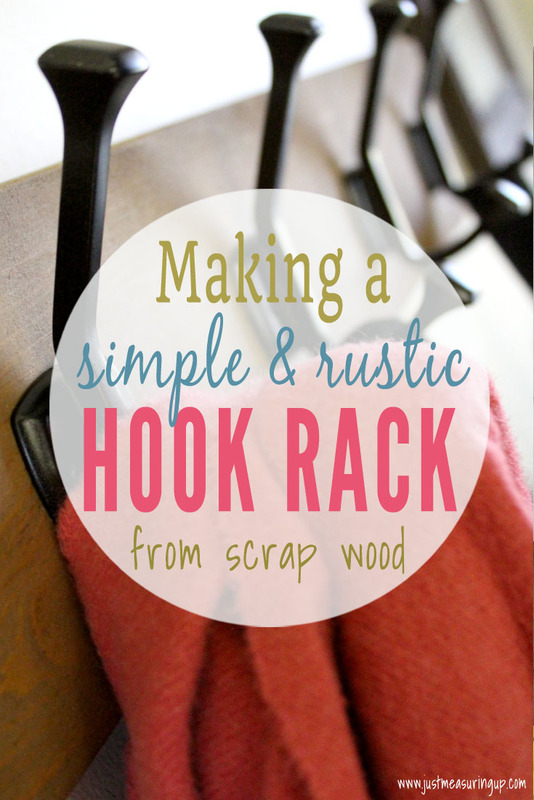 You can easily DIY a hook rack with a wooden board and a few hooks from the store. 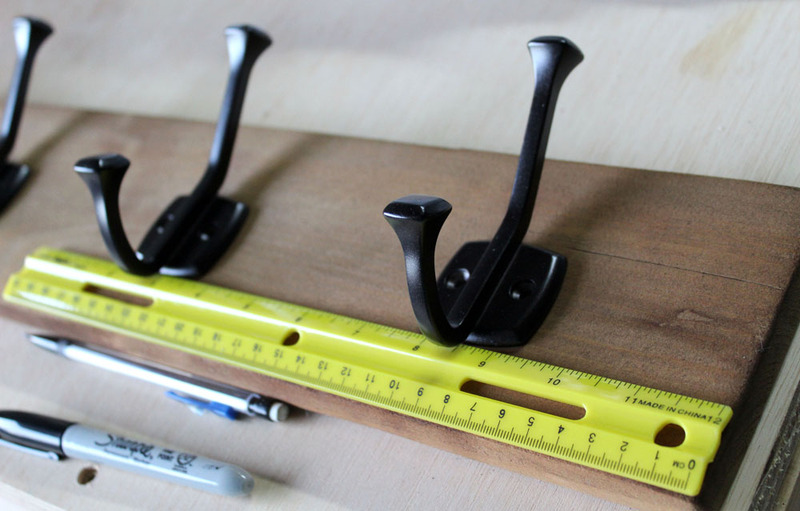 Or instead of hooks, get a little creative and use washers or screws, as long as they have enough length to hold your items. 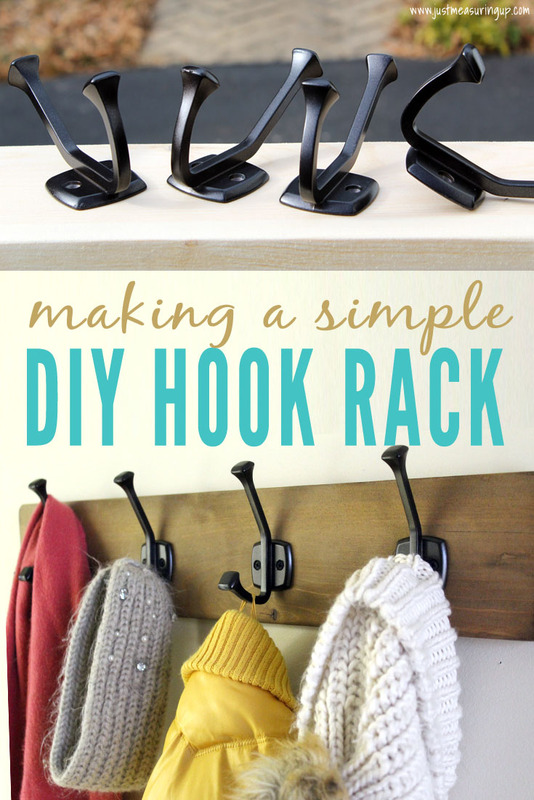 To DIY racks to attach to doors, use dollar store bins and a few screws to get the same effect. If you have any spice racks that aren’t being utilized in the kitchen or garage, you can attach them to closet doors to hold toiletries. Adding hooks and containers to doors and walls is a great DIY home organization tip that definitely keeps your home neater. Furniture takes up most of the space in our rooms, so why not capitalize on it?! If you are looking for a new piece of furniture, think about furniture with built-in storage. We were in the market for a couch that converted to a bed, and we found one that had a massive amount of storage under the cushion. Stools, ottomans, and end-of-the-bed tables all usually have storage space built in too. If you are looking for a kids bed, lots of them have drawers built-in underneath the bed. You can also buy under-the-bed storage containers to slide under beds. These are great for holding things like kids artwork collections, craft supplies, pillows, out-of-season clothes. Depending on the size of your bed, you can get quite a few bins underneath. As far as DIY home organization ideas go, using furniture as storage is really underutilized and can offer so much additional storage. Amazon has lots of options for under-the-bed storage – from the plastic containers to carts to clothes storage bags. I am loving the clothes storage bags. I purchased a few of them to store comforters, blankets, and extra throw pillows in and was able to clear out two shelves in our hall closet! Think about all that storage you will gain by using the space under your bed more wisely. 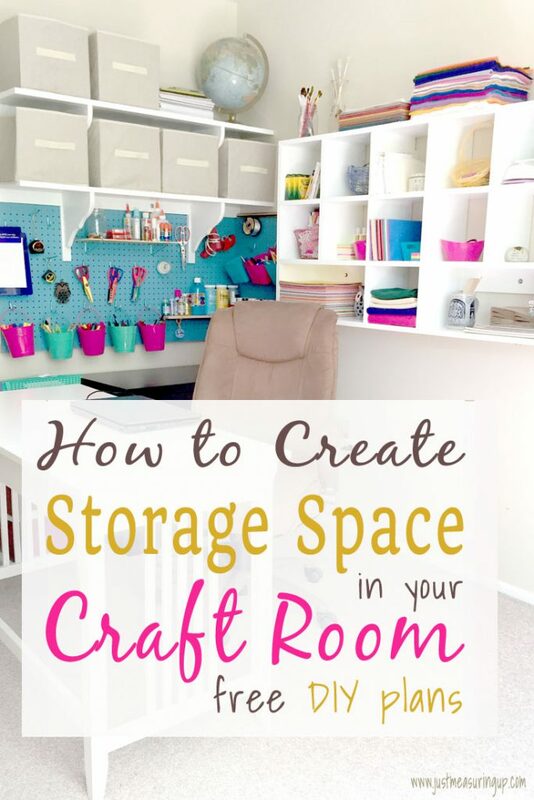 There are tons of awesome tutorials out there that have storage built-in furniture. You can make a platform bed frame that has tons of storage underneath. I’ve also seen cubby bookshelves built into beds. There also are coffee tables you could make, where the top opens and provides hidden storage. Thinking about furniture storage is a great DIY home organization idea that really creates extra space. If you have ever felt the frustration of pulling down bin after bin looking for something, then you know the importance of labels. I’ve pulled down many closet bins looking for scarves – only to find shoes, hats, and everything in between. When you label items not only do you save yourself time when you go to use those things, but you keep yourself and your items more organized. You get used to seeing the labels, so you know where everything is. And, you know exactly where to put things back. 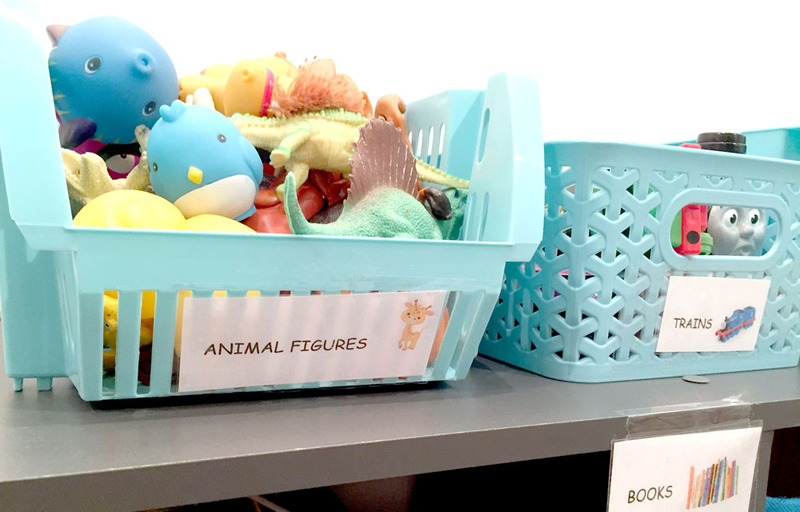 Labels are great for kids too, giving them the tools they need to put their own things away. For younger kids, include a picture of the item, so they can clean up on their own. (The picture label then becomes a learning activity – as kids see the picture along with the word and learn the word.) This will easily help you with toy bins and toy storage. Additionally, labels are great for husbands too. 🙂 You’ll notice things get put back in the right spot much more easily. For extra home organization, labels are really easy to make. Just use masking tape or paper, but I do love the idea of adding pictures for kids to help clean up. Simply google the item, grab a picture, and paste it into a printable document. I was definitely surprised at how much cleaner my toddler’s toys were when he knew where everything went. As easy as masking tape and paper are for labels, I love my label maker. It makes everything look much more neat, organized, and consistent. I LOVE this label maker– and it is a dream come true! It has tons of fonts and decorative options, making for very cute labels and of course, easy organization. Picture a completely organized home. You can walk to the bathroom without tripping on toys. You can reach into your linen closet and easily find a pillow case. You can find a pen in the junk drawer with one swift reach. Everything has a place. It’s perfection. By choosing a few of the above DIY home organization tips and ideas and seeing them through, you will start to regain your sanity. Start small – with just one or two items, and you’ll start to see a great change. You’ll make more space in your home. You’ll create places for things to be put away. And, you’ll use the space you have more wisely. Above all, you will no longer be stressed out by a disorganized house. Instead, your organized home will be your place of zen. I love when inspiration strikes – especially when it makes for an awesome DIY project. When we put my grandma’s house on the market, we did a ton of cleaning, emptying, selling, and donating. 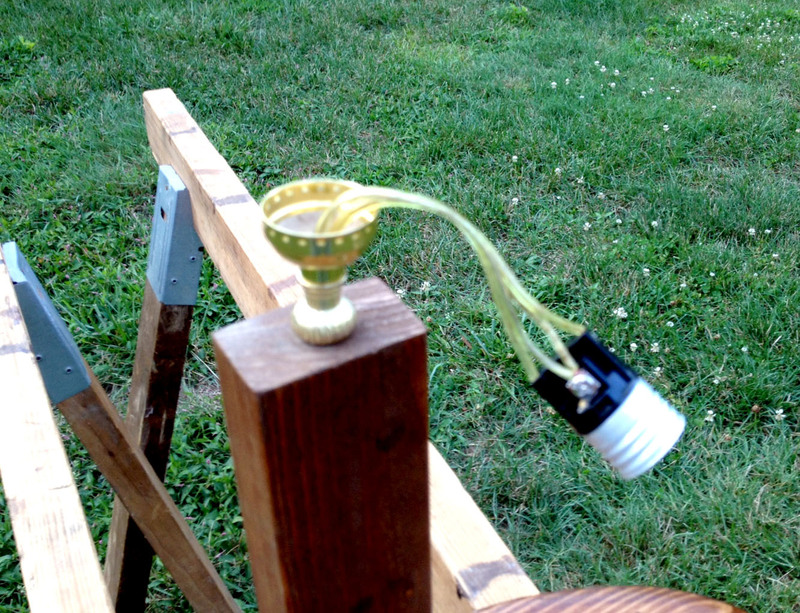 One of the last things left was a homemade fishing lamp that was set aside for my uncle who enjoyed fishing. He wasn’t interested in the lamp, so on closing day, my dad grabbed the lamp on his way out of the door. It was the very last item left. That’s when the inspiration came. 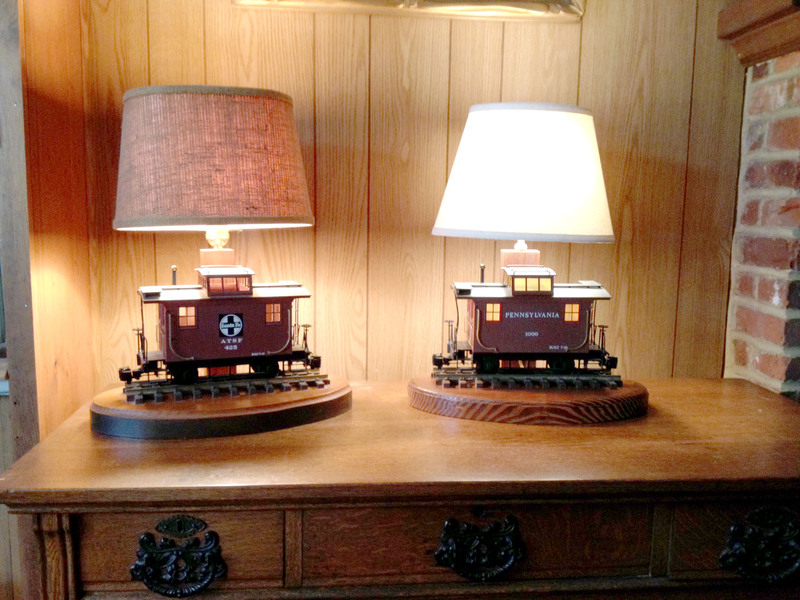 My dad does not fish – however, he is a model train collector, and he noticed that the base of the lamp would perfectly fit one of his trains. So, he repurposed the old fisherman’s lamp into a train lamp, rewiring it with a three-way light switch that toggles the main lamp light as well as a train cabin light. My dad’s friends loved his repurposed lamp so much that my dad decided to make one from scratch for his friend’s birthday. Today, we are sharing how to make this amazing DIY lamp. Ash made the base, and my dad did the rest. For clarity, we’ll state all the directions in first person point of view. Without further ado, here are all of the details on how you can make a DIY lamp too. First I started with the base of this DIY lamp. It is 15 ½” by 9.” Depending upon what model that you are putting on the lamp, it can be larger or smaller. I used a train that was nearly 12″ long so these measurements worked out perfectly. 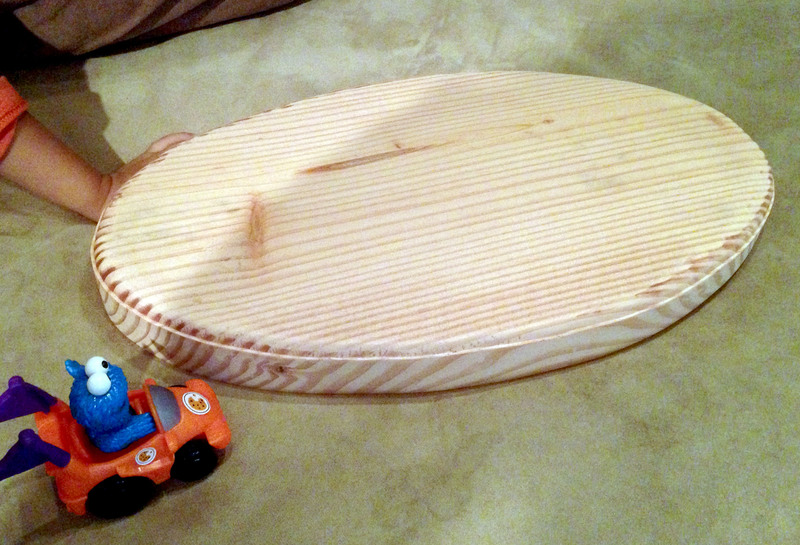 To make the base, I started with a rectangular block of scrap wood (cut from a 2×10 board). My plan was to shape it into an oval, route a groove around the top perimeter and sand it smooth. To get a perfect oval, I used the computer. 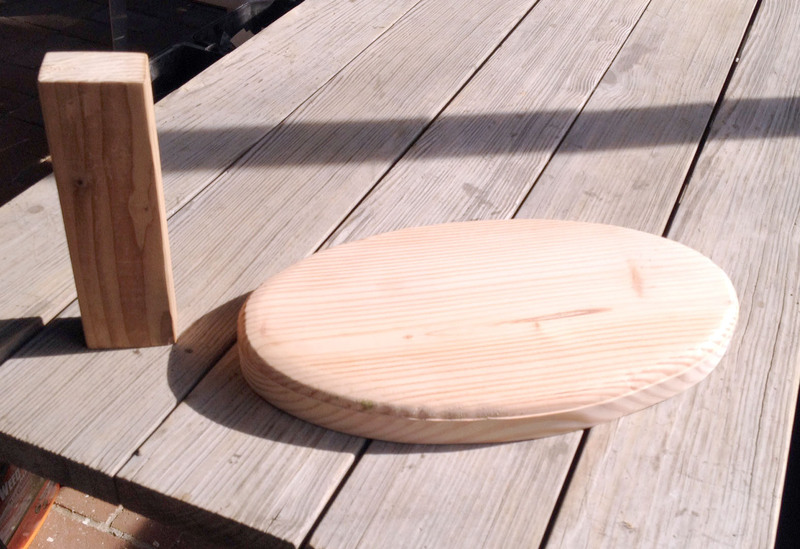 I created an oval in software, printed it and laid the cutout on the scrap wood. I then outlined the cutout with a pencil. 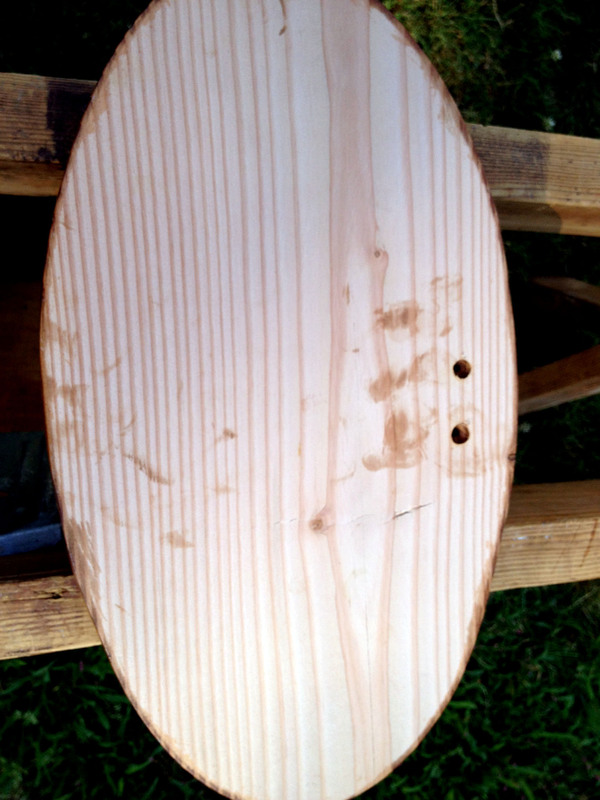 With a perfect oval outline on the wood, I made a rough cut with the jigsaw. Then, I used an orbital sander to smooth the edges. When I was happy with the result, I used my plunge router with a quarter round bit and cut a groove around the edge to give the oval a professional touch. To finish the base, I used the orbital sander once again to smooth the flat surfaces. Next was the lamp pole. 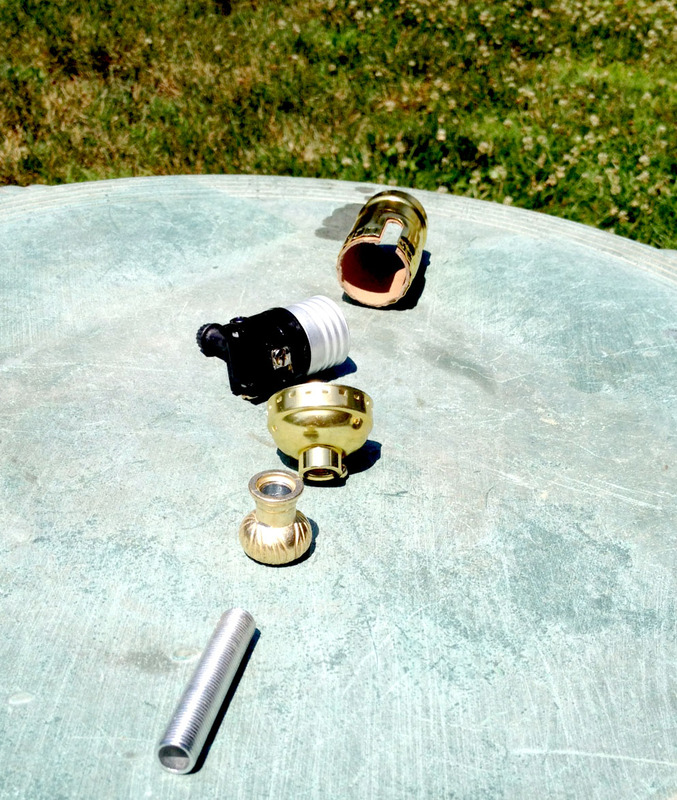 The pole was 2 1/2″ by 1 1/2″ by 8 1/4″ high upright. 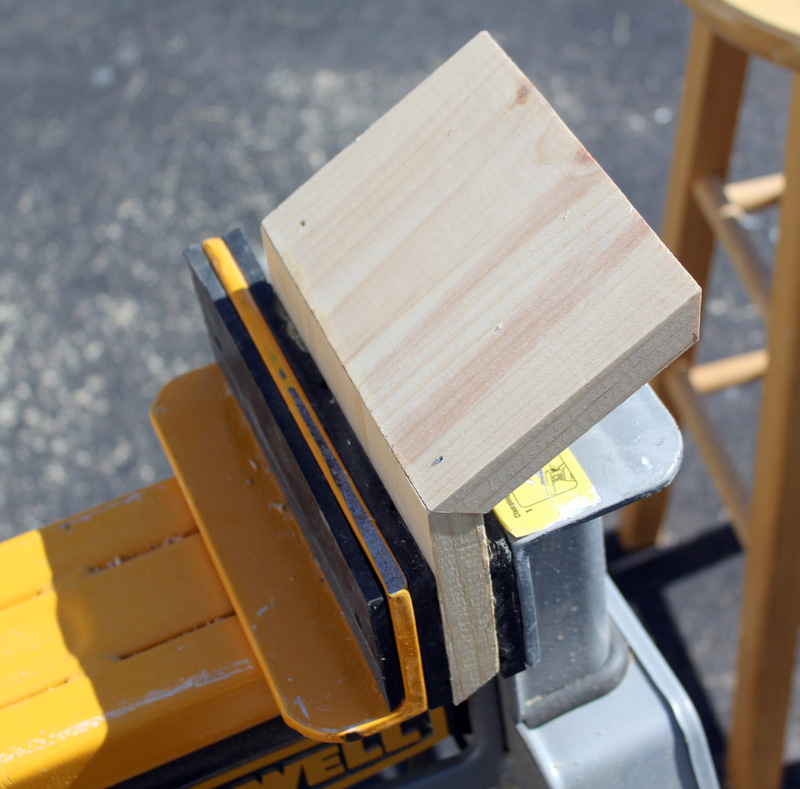 So, 2″ by 1 ¼ ” wood could be used. When choosing your model to go on the base, keep in mind the height of the pole, as it might need to be greater to allow room above the model and below the shade in order to reach lamp switch. 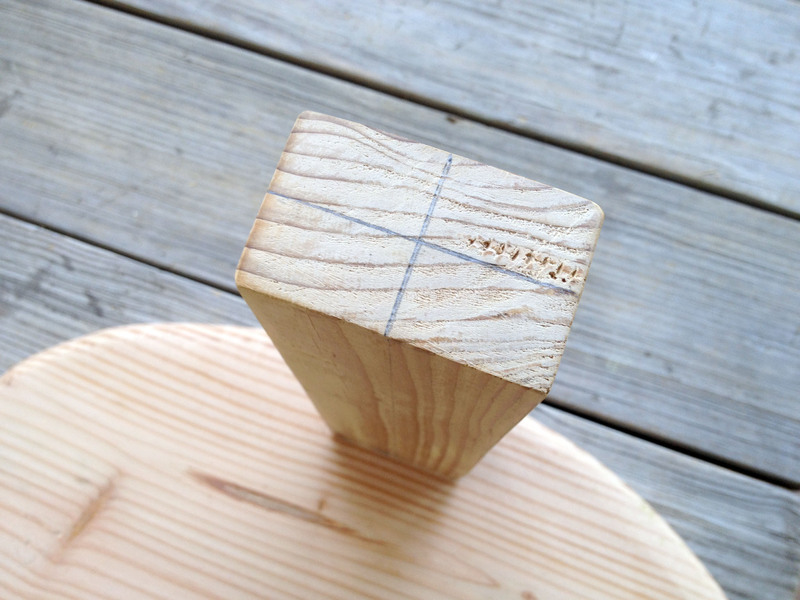 First, mark the center of each end of the upright wood pole. Then carefully drill from both ends. 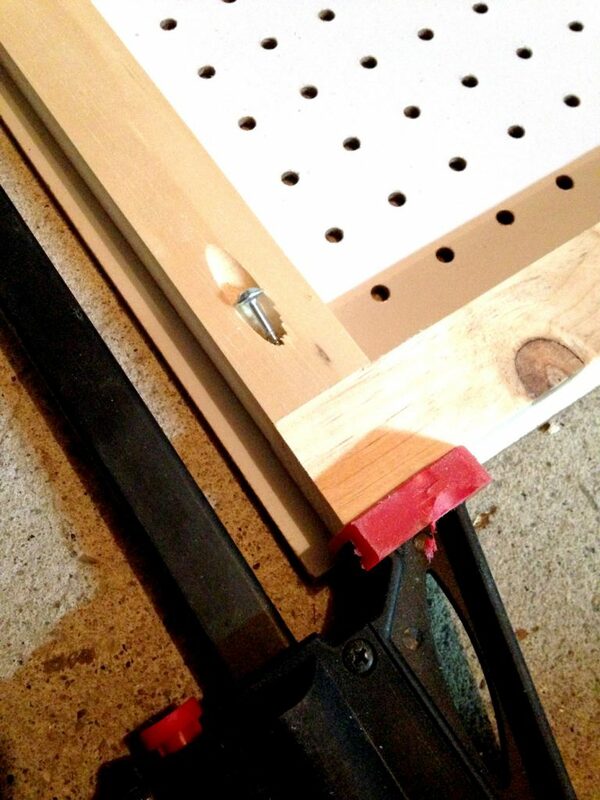 Use a level, so that holes drilled closely align in the middle. A small round file is helpful if the holes do not align. I used 3/8″ drill, as it perfectly allowed for a standard threaded lamp pipe to fit snugly in the hole. Here’s the threaded lamp pipe inserted into the pole. After that, stain and then polyurethane both pieces of wood. I did two coats of stain on the base and it was perfect. I let the stain, and then polyurethane each dry overnight. Returning to the lamp pole, on the side that is to be the back of the lamp, I drilled a 5/16 hole. This hole was made at a 45 degree angle about 1” from the bottom. I drilled until it connected with the existing ⅜ hole. 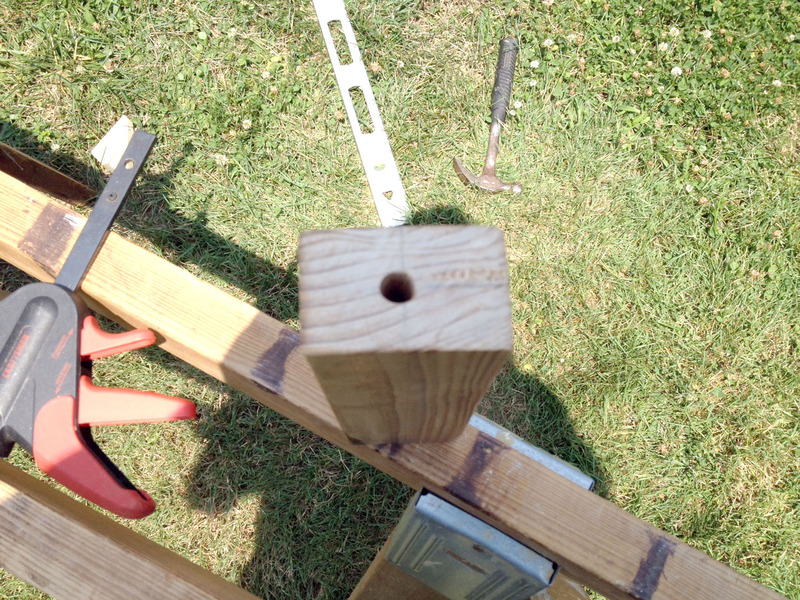 Then, on the front side of the pole, drill a very similar hole, about 2″ from the bottom. Next, I threaded the electrical lamp cord (stranded) into both holes until there are a few inches of each above the top end of the wood. Next, I aligned the electrical lamp components. Note that the socket has to be the type with a three-way switch. This way it will work both it’s own socket and a remote one sequentially. The spacer and the socket bottom will thread into the threaded lamp piece that will be inserted into the wood. Once that is done, I centered the upright wooden lamp pole at the rear of the base. Then, trace the outline with a pencil. Divide that shape in two, and locate the center of each of the two halves. 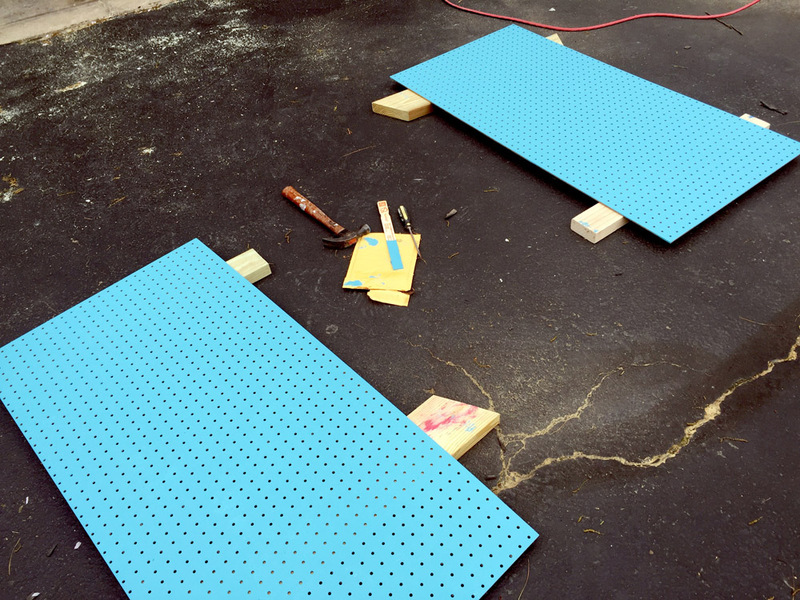 Afterward, drill pilot holes through the base at those spots. 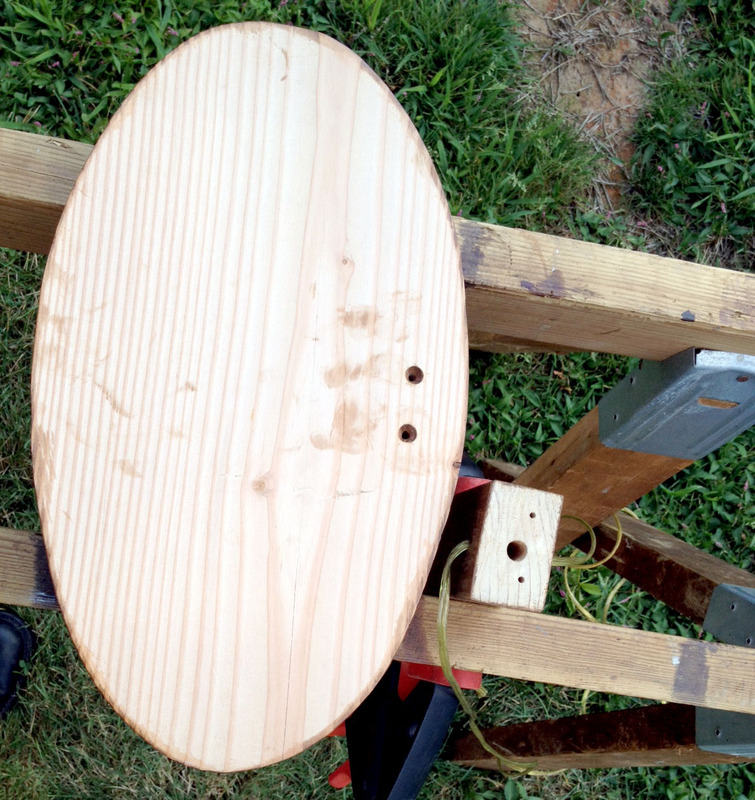 Next, turn the base over, and enlarge the holes. However, they should be a diameter less than that of the screws to be used. So, use a countersink drill bit so that the wood screw heads will be recessed. Then, insert the screws until they protrude slightly from the top side. 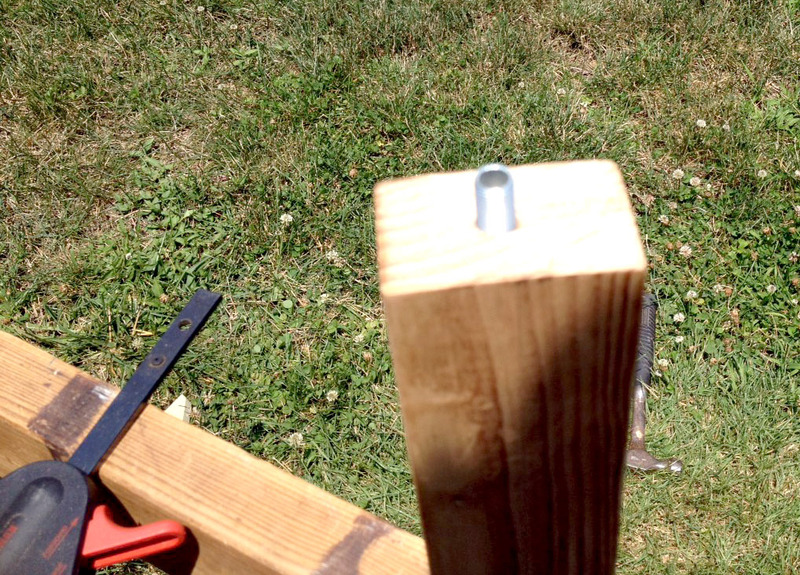 Afterward, set the post in position so that the screw tips mark the underside of the post where the screws will enter the bottom of that post. Next, drill screw holes in bottom of the post where marked, and hold the two pieces of wood together tightly while screws are tightened. I used 2 1/2″ wood screws due to thickness of the base. 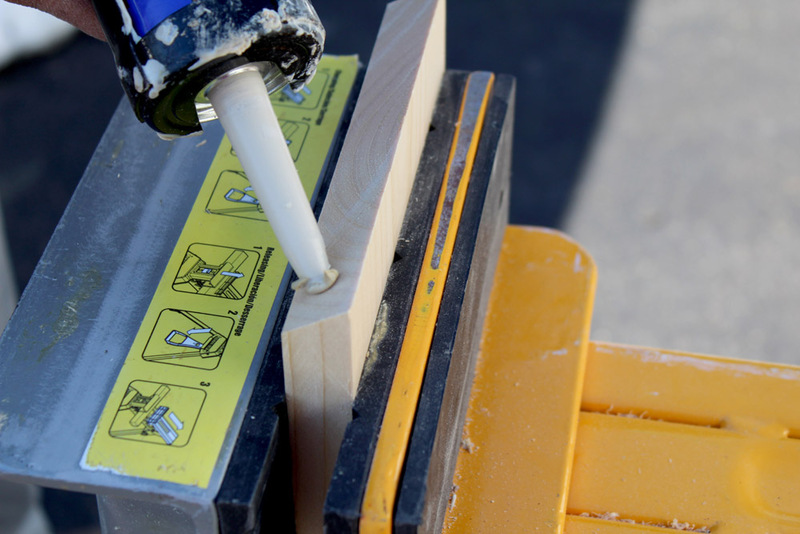 If post is not level due to any warp in the base, insert a shim under the post or remove post and trim its bottom surface. 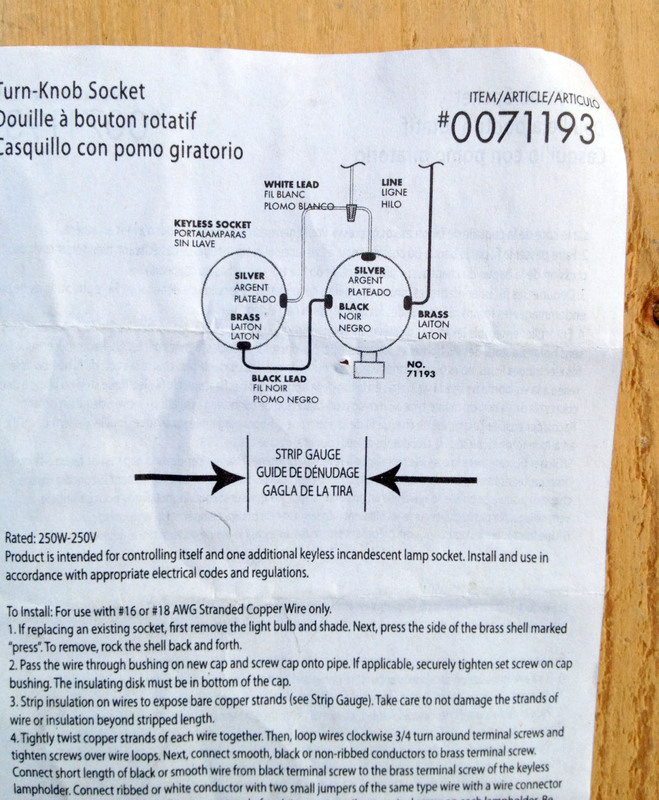 Next, you want to very carefully read the instructions that came with the socket. 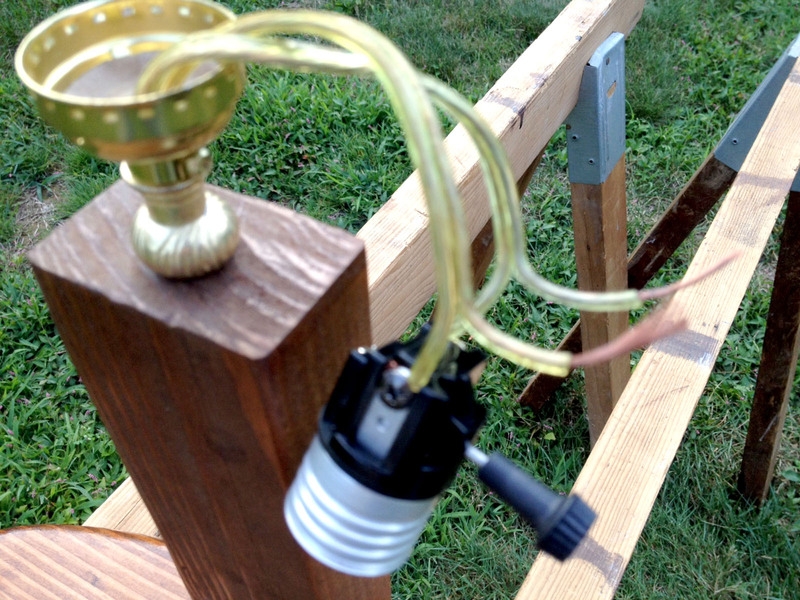 With both wires extended through the threaded lamp pipe and the socket base, push the pipe down into the wood base. If it doesn’t fit tightly, put some wood glue on the threads first. Next, very neatly wire the socket exactly as the instructions state, noting which wire will go to the wall outlet and which to the model. After, put the metal cover on the socket, and slowly pull the excess wires at both small holes at the base of the posts. 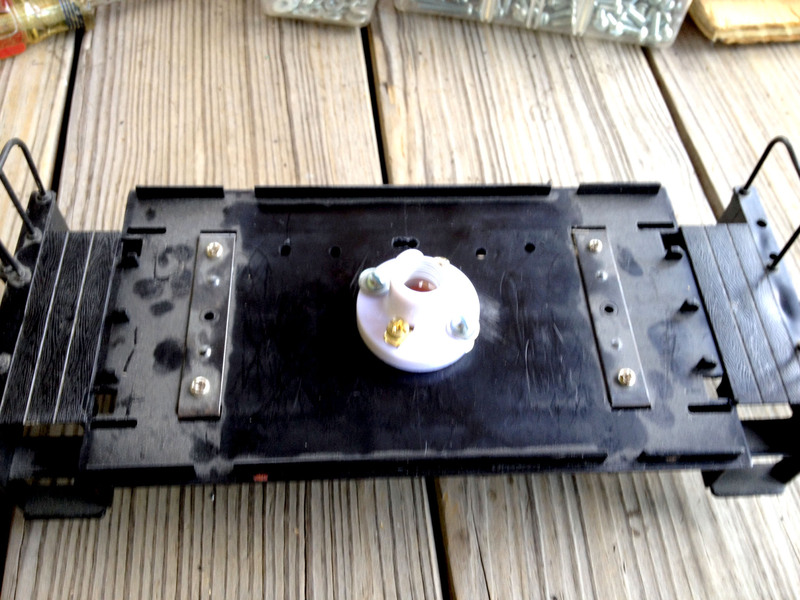 Then, I snapped the socket cover into its base. Make sure that the lamp switch is to the right side. Next, I disassembled the model I was building into the lamp. I used the mounting holes in the small socket as a template for drilling holes in the floor of the model for screws to attach the socket. Also, I drilled a hole for the electrical wire to enter the model. 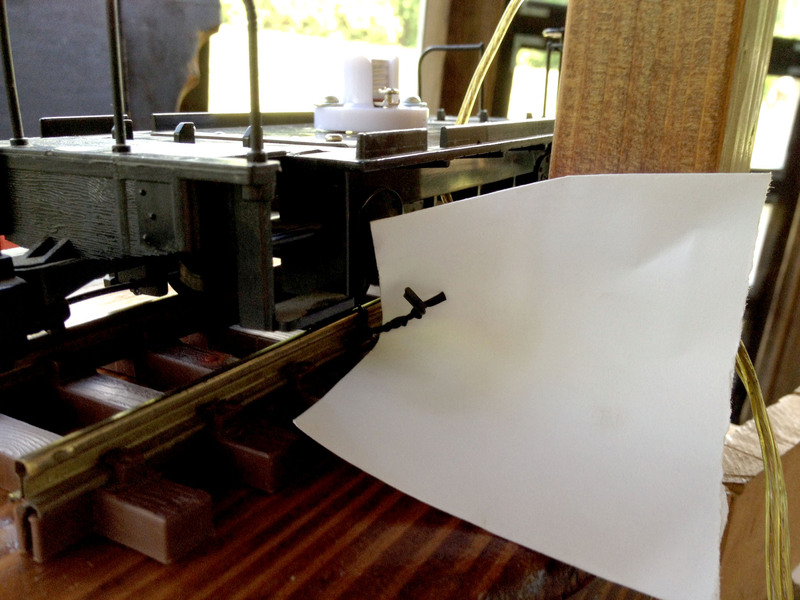 With the small socket attached to the model with screws, washers, and nuts, use a pair of 5″ or longer twist ties to securely fasten the model’s axles to the rear rail of the track. Next, I installed the small frosted light bulb into model’s socket. 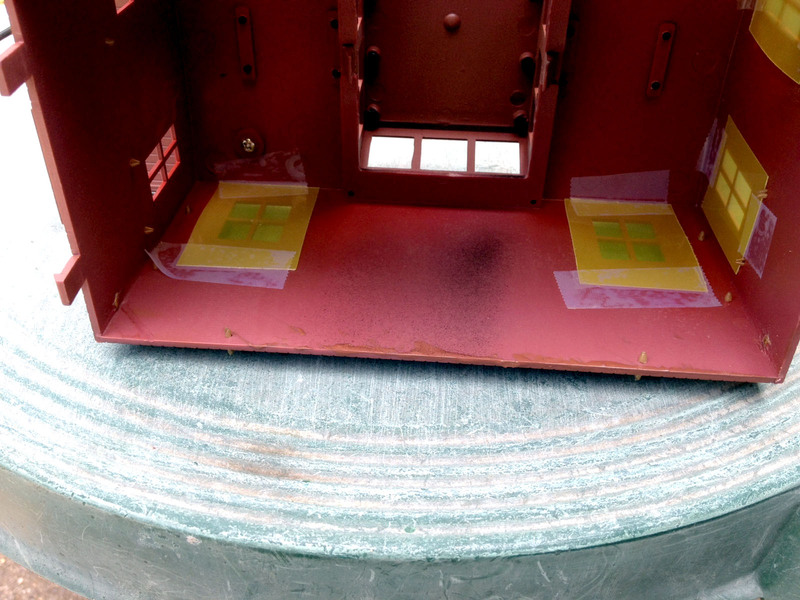 You could also consider taping thin yellow plastic sheet pieces over the insides of the model’s windows to dim glare. After, install the lamp cord plug for wall outlet, allowing about 6′ of cord. Then, reassemble the model, adding the lamp shade and a standard light bulb. 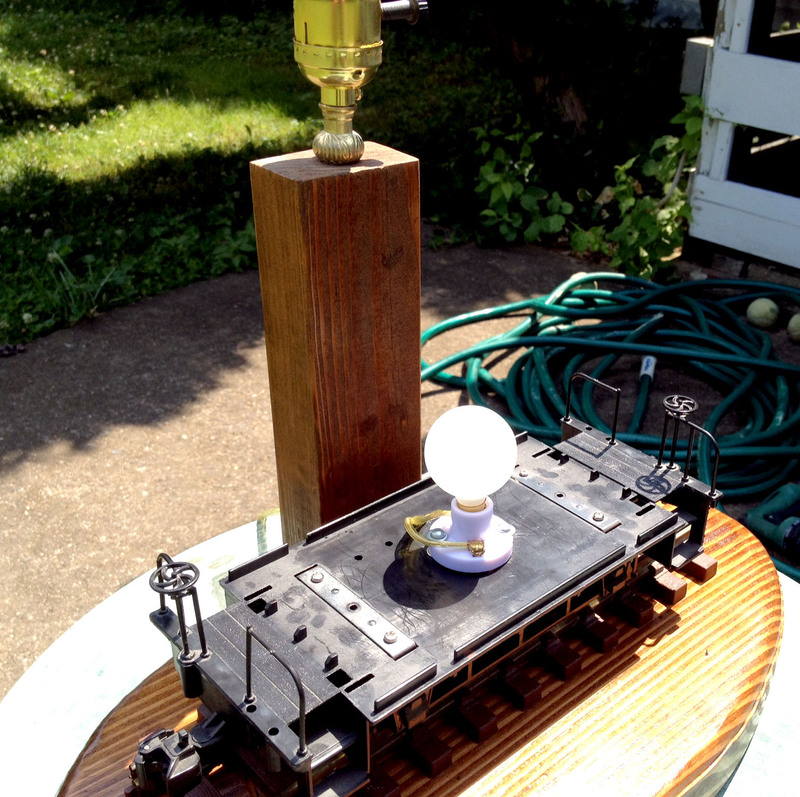 Here is the finished DIY lamp, featuring a model train. Here is the finished DIY lamp along with the repurposed lamp that was previously a fishing lamp. Not bad, right?! 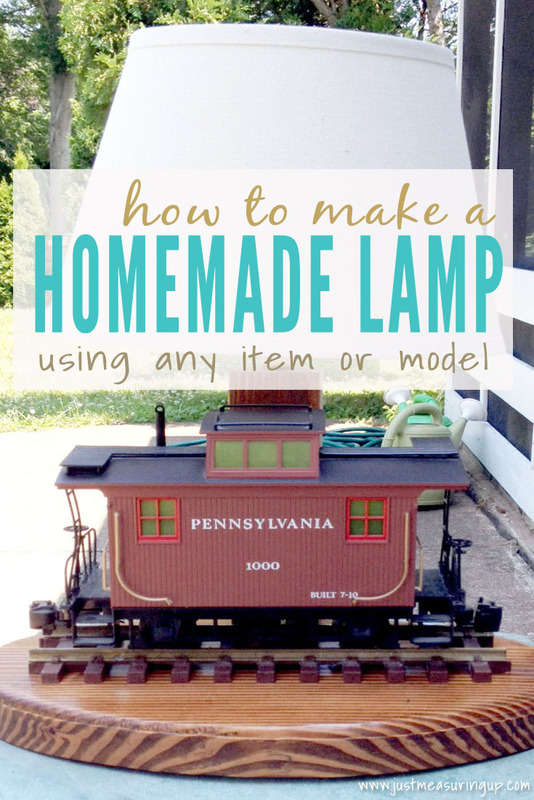 The best part is that now that you know how to make a DIY lamp – you can make one with any kind of model. The sky’s the limit!